When I was younger – much younger – I was an avid Nancy Drew Mysteries reader. I think I had 20 or so of the books. My goal at the time was to read through all of them (I think there were 55 at the time). 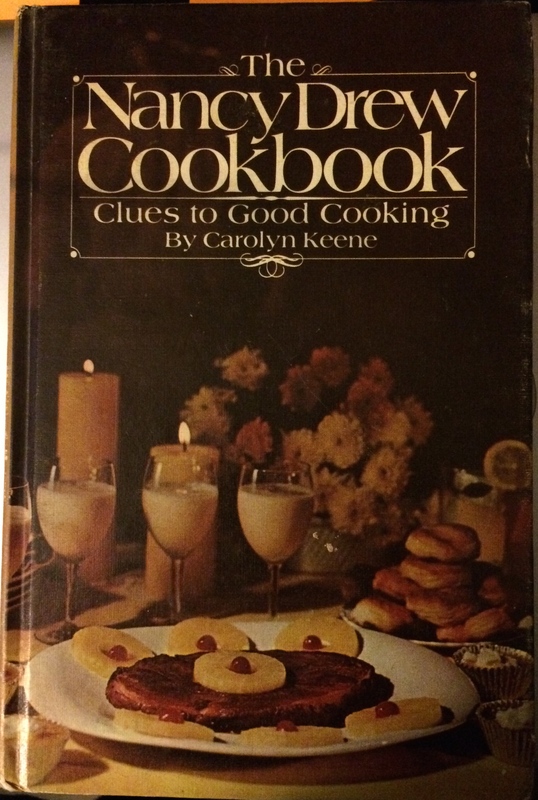 I never made that goal, but I did get one thing so much cooler – The Nancy Drew Cookbook. One of my first and most treasured cookbooks. It’s one of three cookbooks I received from my mom that I absolutely treasure. The other two are The Little House Cookbook (based on recipes from the Little House books) and Mom’s first cookbook, Wendy’s Kitchen Debut. I may give away or sell my other cookbooks, but I’ll be buried with these. There was a recipe in Nancy Drew that I really wanted to try. 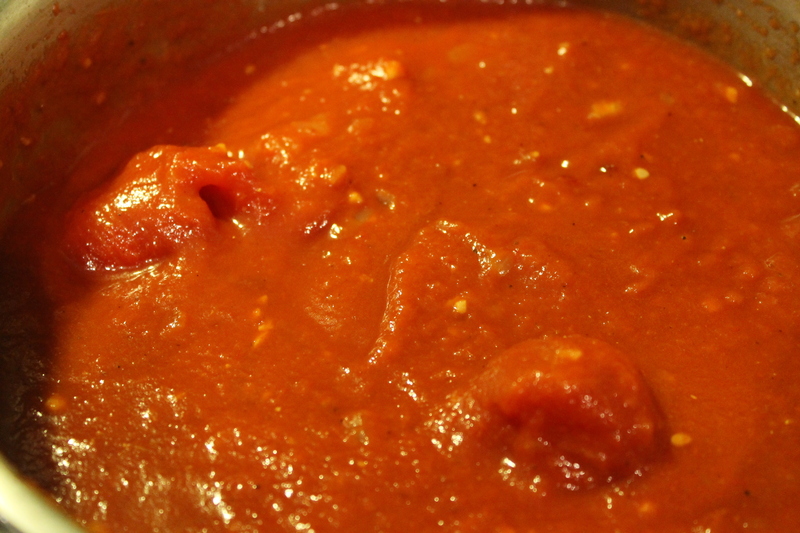 In Chapter 6 – Album of International Recipes – I came across a recipe called “Italian Salsa di Pomodoro”. Not knowing what the Italian meant, I read the recipe anyway and figured out it was spaghetti sauce. 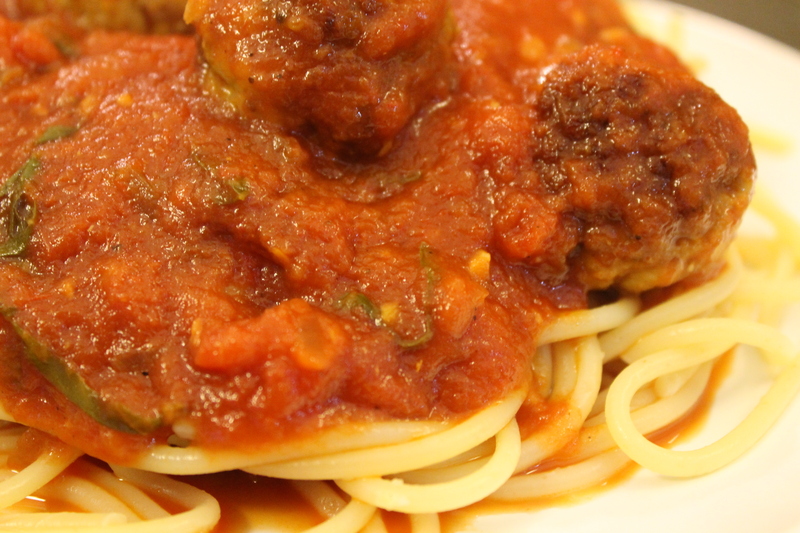 It was so different from the sauce that Mom made (hers is a wonderful amalgamation of sauce and lots of vegetables; sometimes, she would make meatballs, too). This was just a simple unadorned sauce. The first time I made it, I think I burned the onions. I still finished the sauce and the family gamely ate it. I’ve since gotten better. This book was also responsible for the infamous “A Keene Soup”, or, as my family called it, Peanut Butter Soup. It was not a success. In fact, it was really gross. They’ve never let me live it down. I don’t blame them. However, the “Old Attic Stuffed Tomato” and “Flag Cake Symbol” from Chapter 5 – “Nancy Tells Her Holiday Secrets” were pretty successful. I liked the stuffing so much that I was nibbling on it while I was making the recipe. That’s when Mom had to point out to me that eating raw sausage wasn’t a good idea. 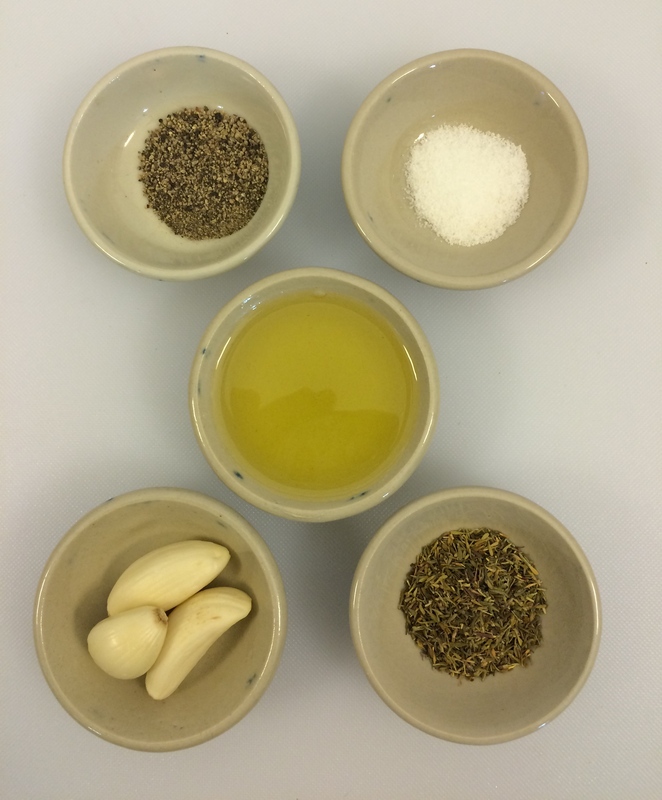 Back to the sauce: as I progressed as a cook, I set aside this little book, but I always remembered the base of this recipe – onion, tomato, olive oil, salt, pepper, sugar – and decided to make my own sauce recipe that would be simple, quick, and versatile. I think this sauce is it. I’ve used it as a base for Red Clam Sauce, added Italian Sausage, added shrimp, made Chicken Parmesan, Lasagna, as a pizza sauce, etc. The list is extensive. 1. 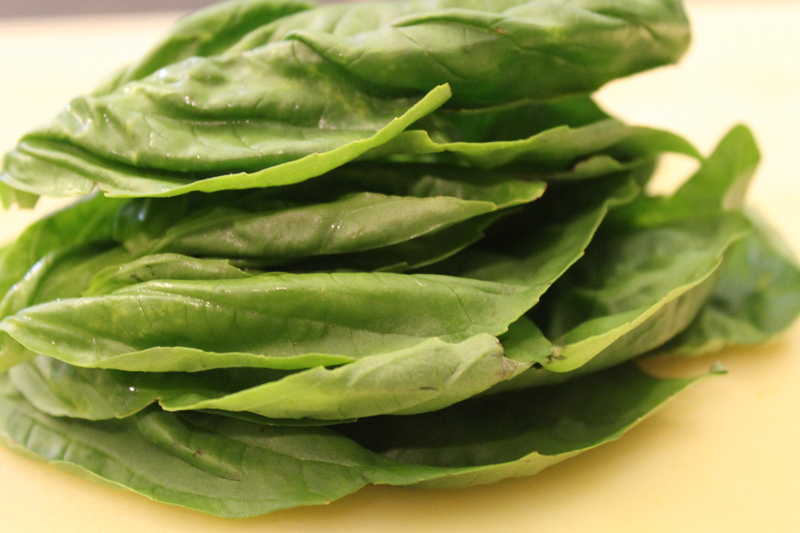 If you can’t find or don’t want to use fresh basil, you can use any other fresh herb you prefer. Just be judicious with the amount. 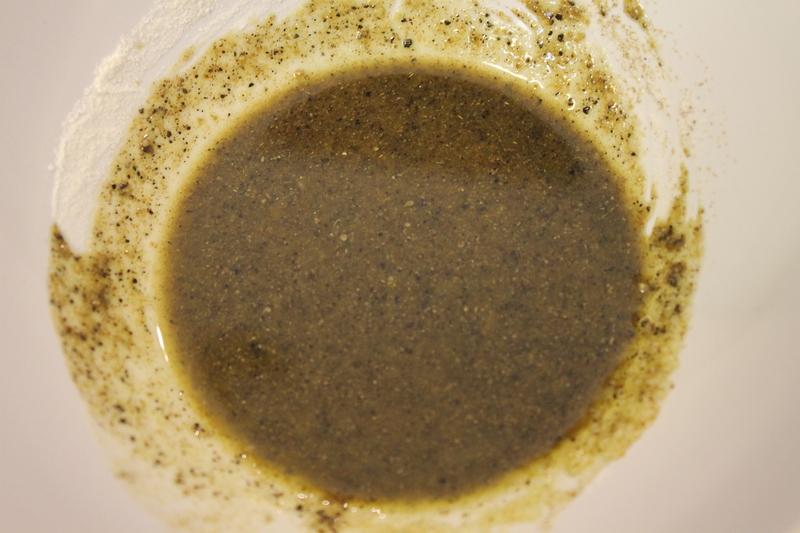 For example, if you use too much oregano, your sauce will taste like soap. Always begin with less than you think you need. You can always add, but you can’t take out. 2. 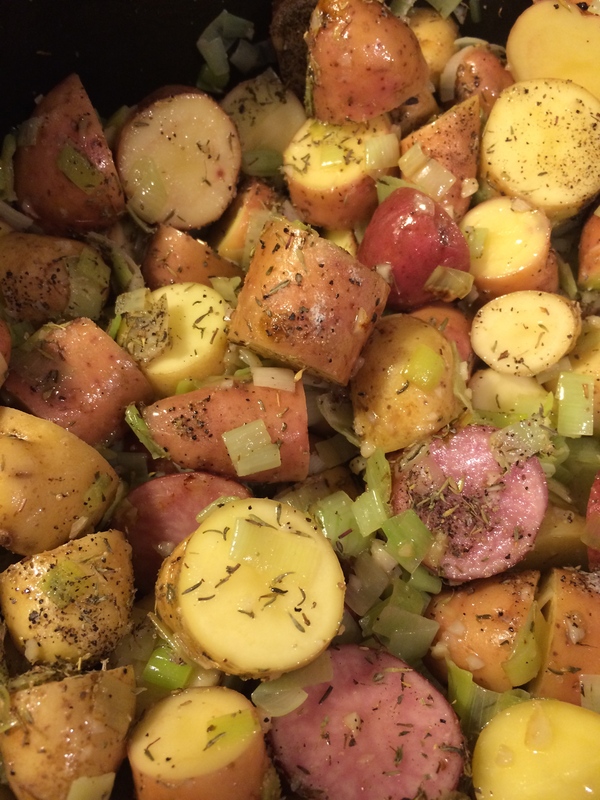 You can also use dried herbs in this recipe. 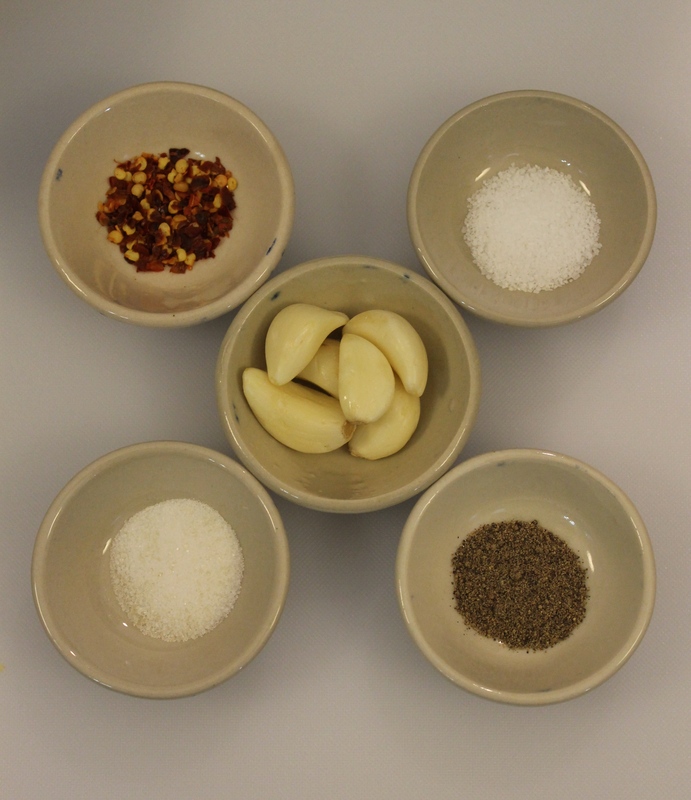 Begin with 1 teaspoon and add it when you add the red pepper flakes to the onion & garlic. 3. You can add any protein to this sauce. Just add it when you add the fresh basil at the end. If it’s something like sausage, be sure to cook it before adding to the sauce. If it’s fish or shellfish, you can add it raw, but just make sure it’s cut into small enough pieces that the heat of the sauce will cook it through. 4. This recipe makes a lot of sauce. It freezes well and can be frozen for 3-4 months. 1. 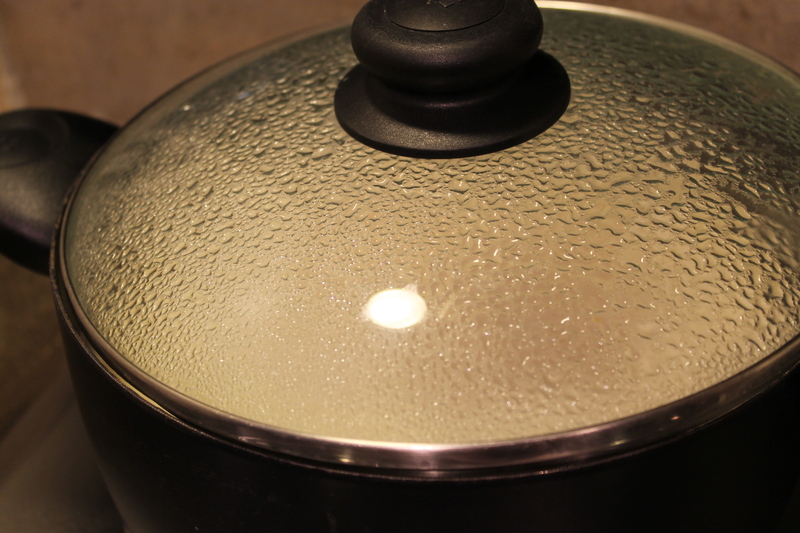 Heat the oil in a large saucepan over medium-high heat. 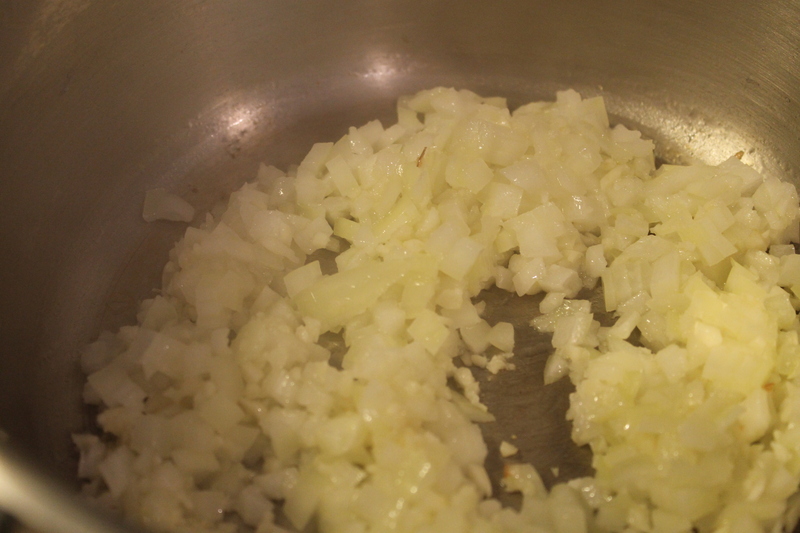 Add the onions and garlic and sauté until the onion begins to soften, about 3 – 5 minutes. Stir frequently. 2. Add the red pepper flakes (and dried herbs, if using) and saute for another 1 – 2 minutes. 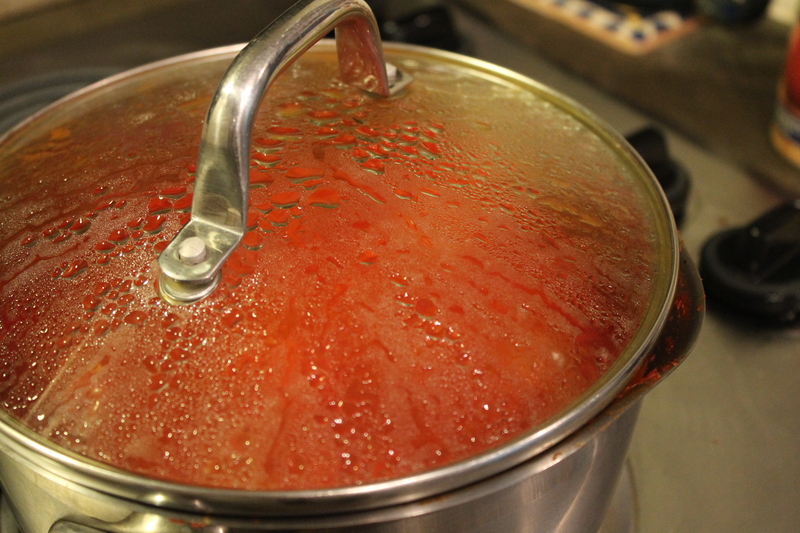 The tomato paste turns burnt orange as you cook it because you’re cooking the sugars in the tomato. 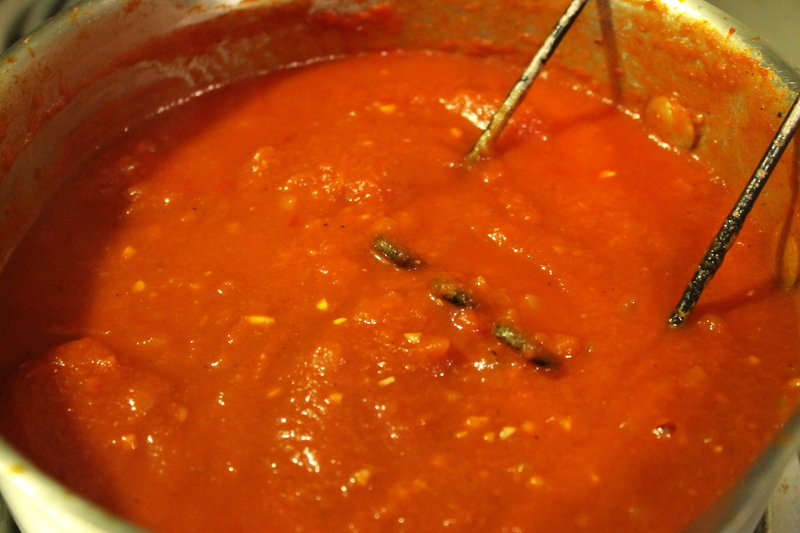 It adds a little sweetness to the sauce and helps smooth out some of the heavy flavor of the paste. Lower the heat to medium-low, partially cover, and cook for 30 minutes. Stir frequently. Cooking the sauce. I know I said partially cover. So, do as I say, not as I do. 4. Meanwhile, make the pasta. Cook until al dente, drain, and set aside. 5. After the first 30 minutes, take the sauce off the heat. If you like, mash down any whole tomatoes left with a potato masher and taste for seasoning. I like to use whole tomatoes in my sauce, so I’ll take the potato masher when the sauce has cooked and break them down. 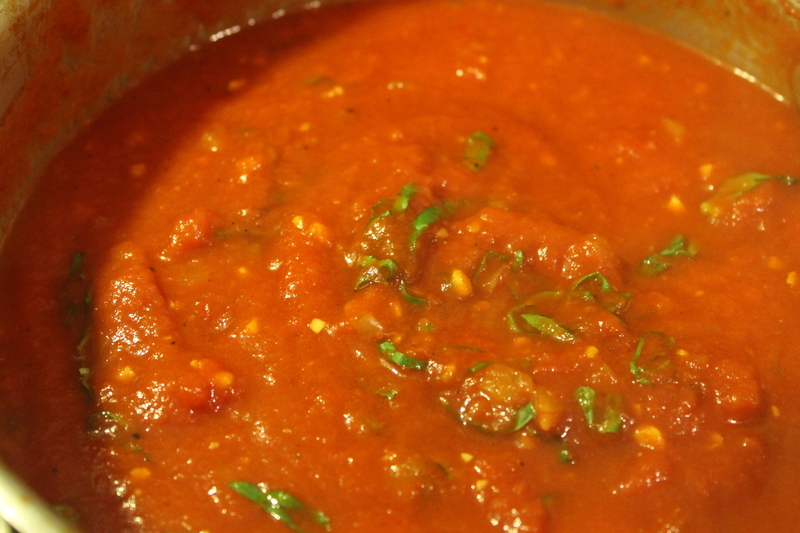 Stir in the basil and let it simply infuse into the sauce for at least 15 minutes. If you are adding any protein, add it when you stir in the basil. Taste for seasoning again. The basil stirred in and infusing. Now is also the time you would add any additional protein. The residual heat from the sauce will cook most small shellfish and heat through any already cooked meat. In general, you can serve this with any cheese you prefer (unless you’re making this into a seafood sauce; in that case, cheese is verboten), but I usually just use Parmesan. Without Parmesan. In this example, I added meatballs to the sauce at Husband Steve’s request. 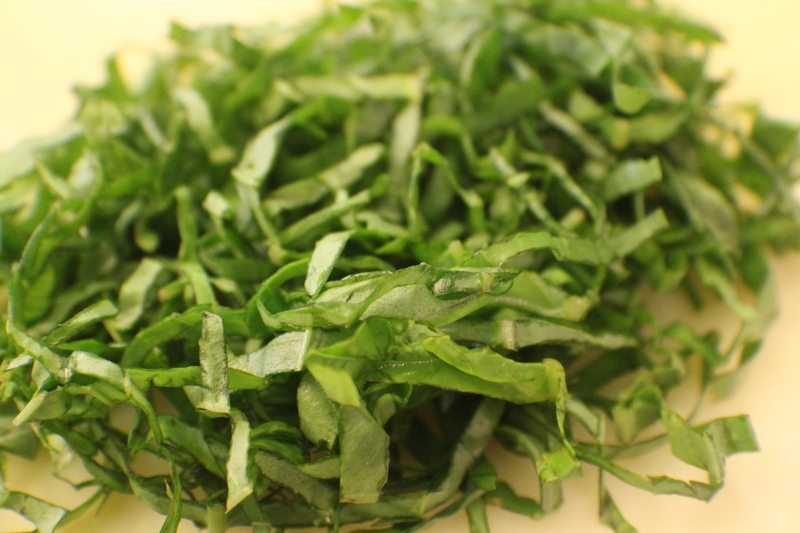 In this recipe, you can most certainly simply tear the basil leaves and add them to the sauce. 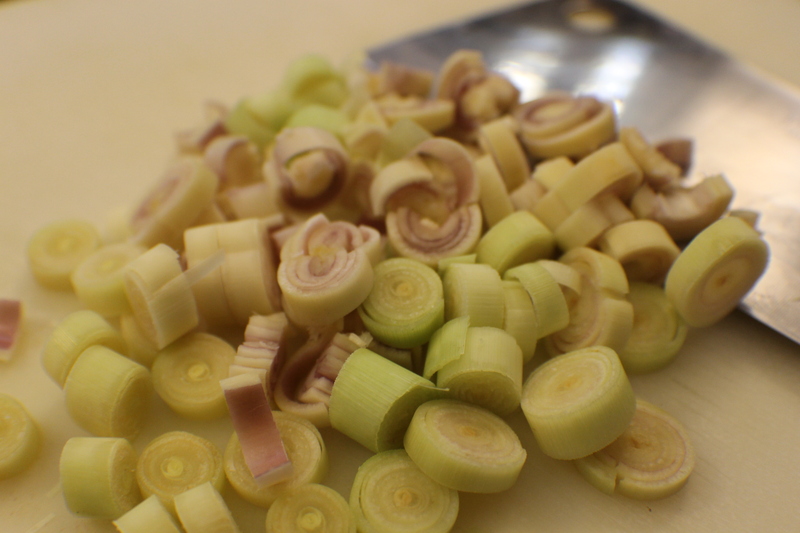 However, I like to cut them into a julienne. Basically cutting the basil into very thin strips. You can use this technique for many different herbs and vegetables. 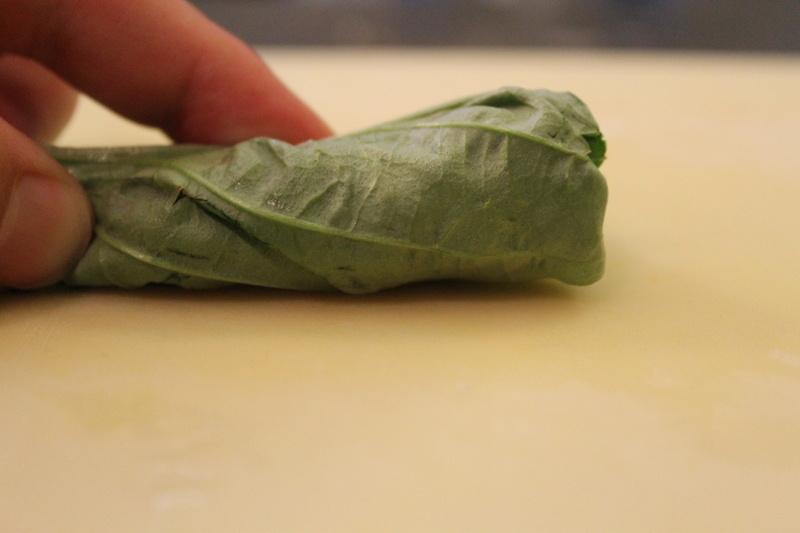 Second: Roll the basil into a tight roll. 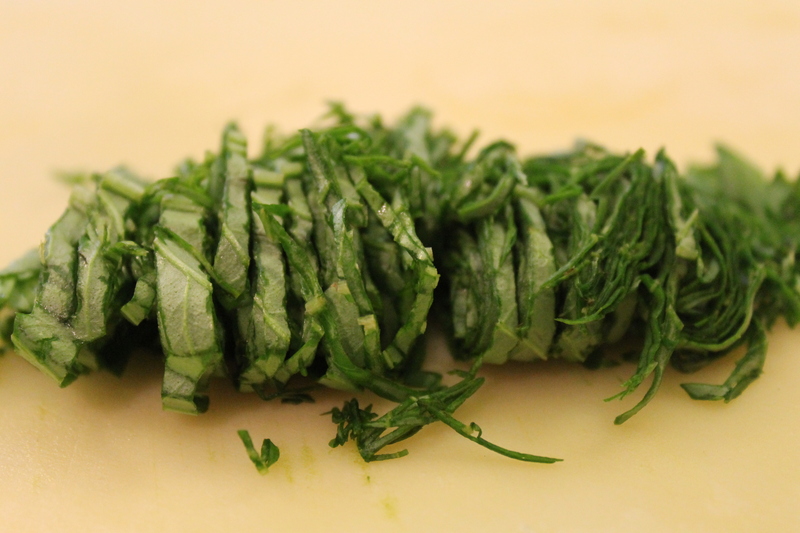 Third: With a very sharp knife, cut the roll lengthwise into very this strips. Forth: Separate the strips by basically working the roll apart with your fingers. Now, it’s ready to add to your recipe. Years ago, as I was rifling through my pantry trying to figure out what to make for dinner because I didn’t feel like going to the grocery store, I came across 2 cans of black beans and a jar of pickled jalapeños (that I figured I needed do something else with besides make nachos). Of course, these are pantry staples every Texan should have. Hmm… I thought. What can I do with these? After looking through my fridge and finding some cilantro, I stumbled upon it. “Tart these beans up, Sahar”, I said to myself. At the time I came up with this recipe, Husband Steve was a vegetarian. And, honestly, me being a dedicated omnivore, there were times I struggled with figuring out what to feed him other than the same old dozen or so meals. Thankfully, he liked this new concoction so much it became a semi-regular in the rotation. 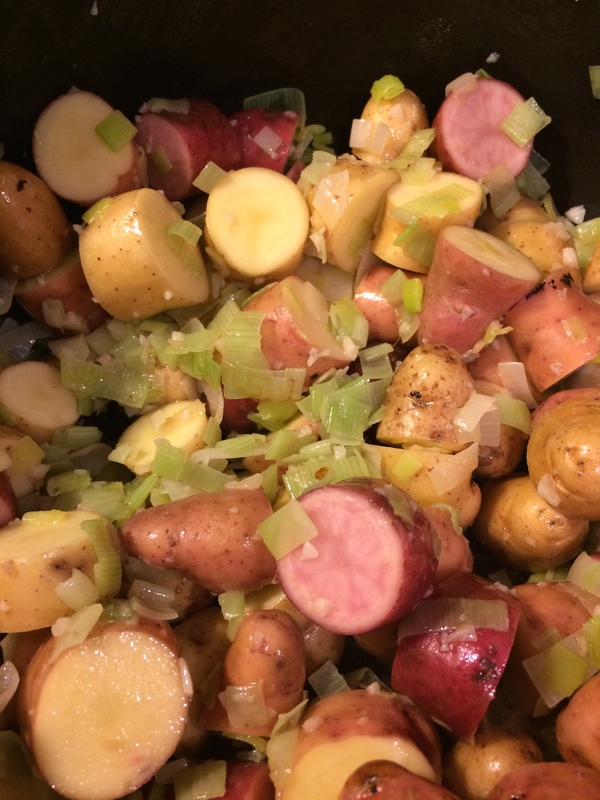 I liked it because I was working a full-time job at the time and this was a quick & easy meal to make for dinner. Cheap, too. And, let’s not forget the most important part here – delicious. I’m not even going to call this anything remotely like authentic Mexican cuisine. I mean, I honestly don’t know of any interior Mexican recipe that uses pickled jalapeños. However, I like to think I’ve at least kept to the flavor profile somewhat and honored the spirit, if not the authenticity. 1. 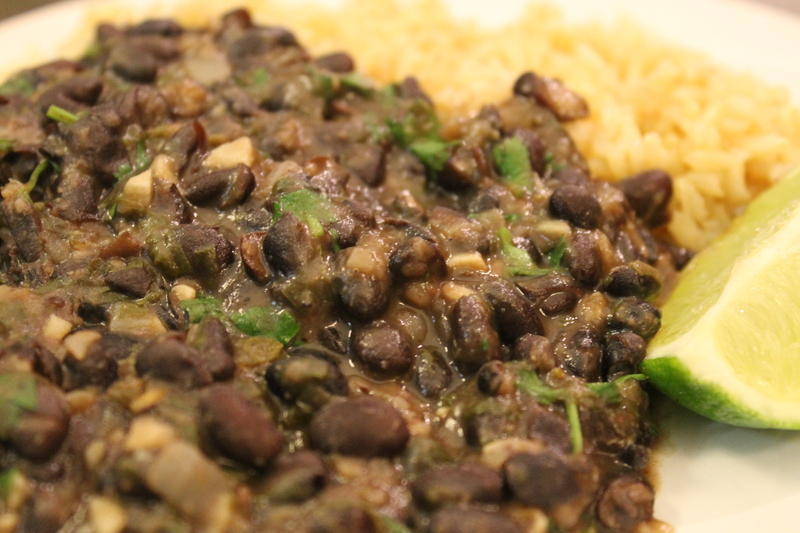 I really designed this recipe around black beans. However, if you don’t like or can’t find them, pinto will do in a pinch. 2. If you don’t have a jar of pickled jalapeños, you can use fresh. Use one, and, depending on the heat level you want, remove the seeds or not. Also, in place of the jalapeño brine, use lime juice. 3. I generally serve this dish with brown rice. It just seems to work. However, white rice or even your favorite Spanish or Mexican rice recipe will be fine, too. 4. Occasionally, I’ll dice up a tomato (after I remove the seeds) and add it to the beans when I add the second half of the cilantro. I’ll let the tomatoes sit in the beans just long enough to warm through before serving. 5. 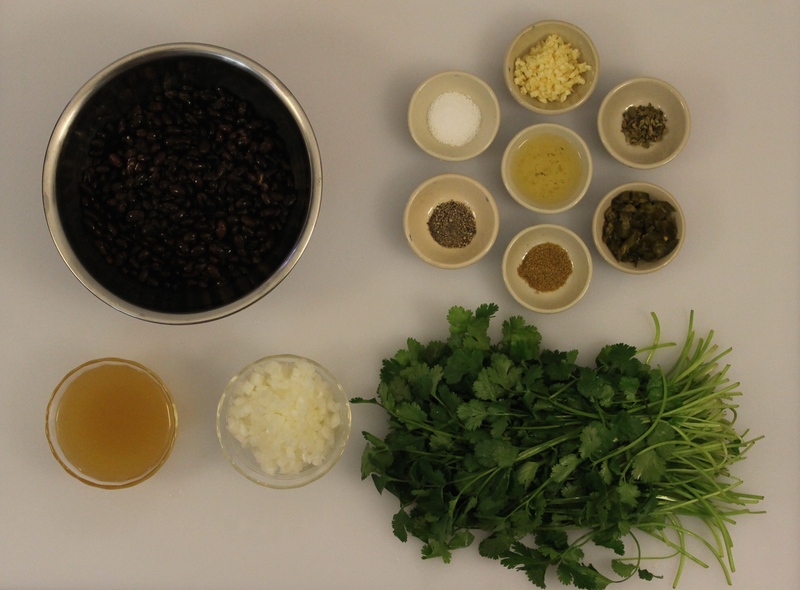 When I serve the beans with cheese, I’ll use Jack cheese or Queso Fresco as a general rule. The rule being that I usually have one or both of those in my fridge pretty much all the time. Honestly, they just seem to work. However, if you decide to go the pinto bean route, cheddar will work, too. 6. To make this dish vegan, use vegetable broth and omit the cheese. 7. If you’re feeling decadent and carnivorous, a small piece or two of salt pork or bacon cooking with the beans wouldn’t be a bad thing. Just watch the amount of additional salt you put into the beans. 1. Heat a medium saucepan over medium-high heat. Add the oil and let heat up. 2. 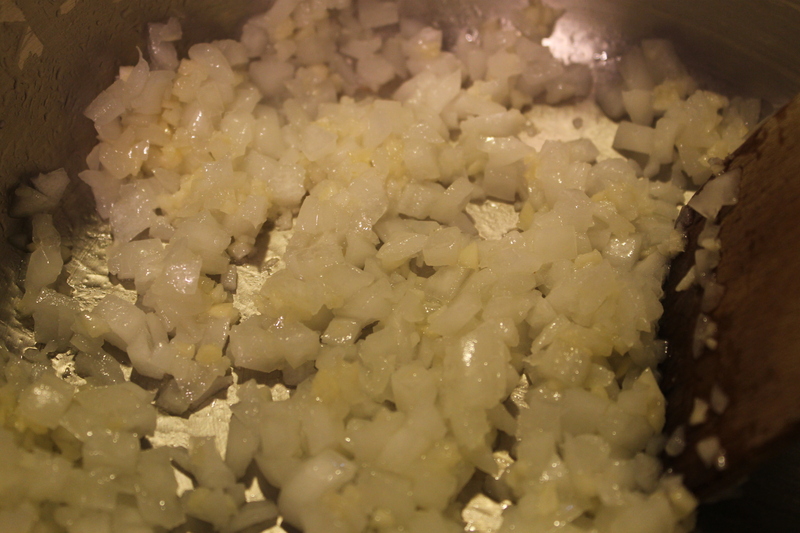 Sauté the garlic and onion until the onion is soft, about 2 – 3 minutes. Sautéing the onion and garlic. It’s important to allow the saucepan to heat up before adding the oil. This helps the surface to become more non-stick than it otherwise would be (especially in a non-teflon pan or saucepan). Plus, this helps to cook the food more evenly and efficiently. Add the jalapeños and sauté for another minute. 3. 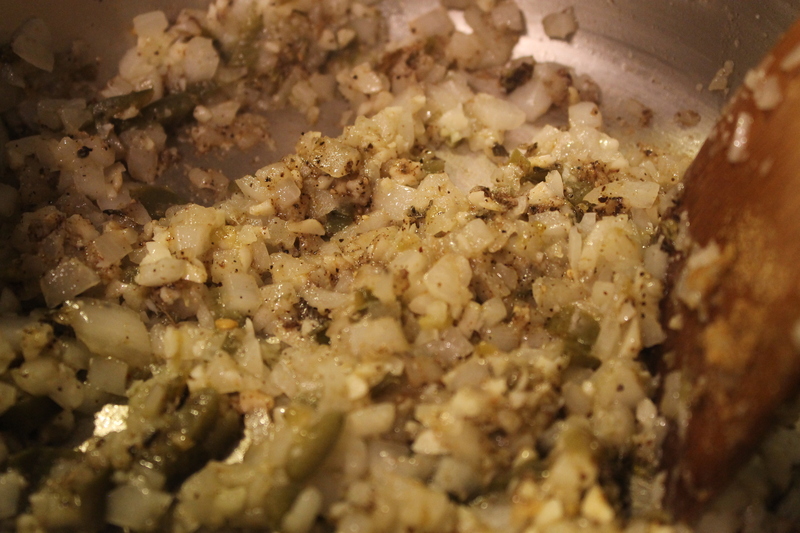 Add the salt, pepper, cumin, and oregano and sauté another minute or just until the spices begin to have a fragrance. Be sure not to let them burn. 4. 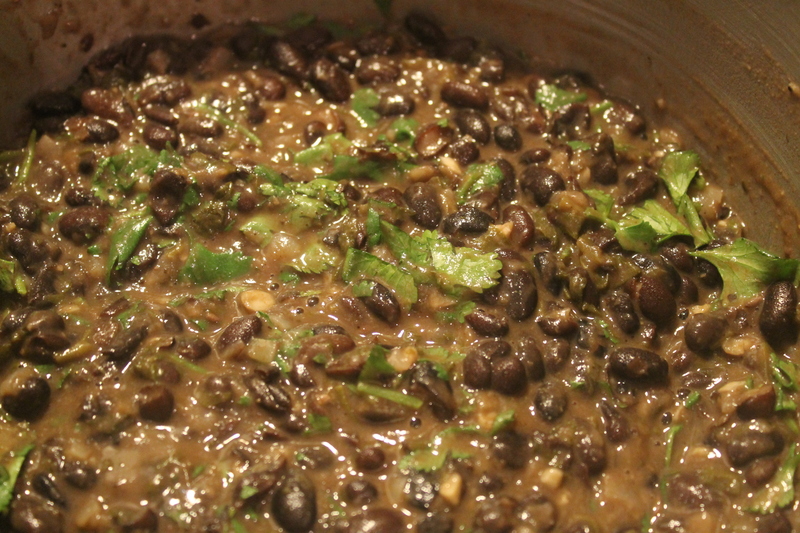 Add the beans, jalapeño brine, half of the cilantro, and the broth or water. 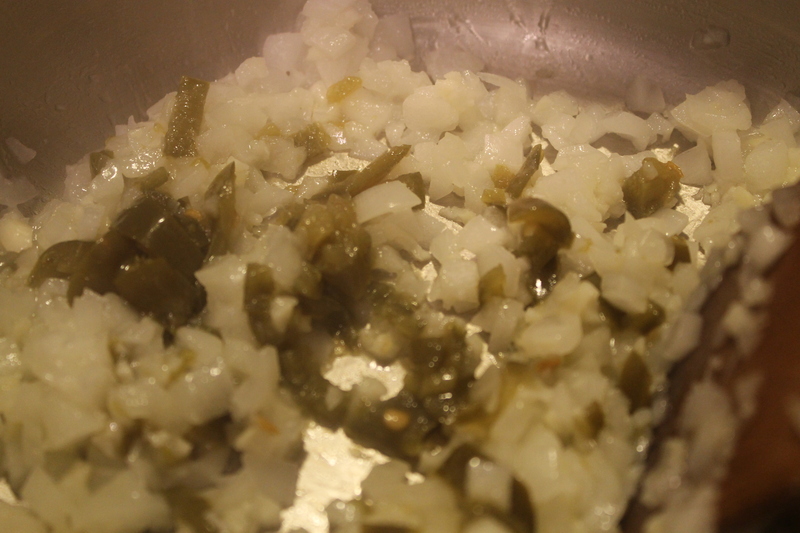 Adding the beans, half of the cilantro, and the jalapeño brine. 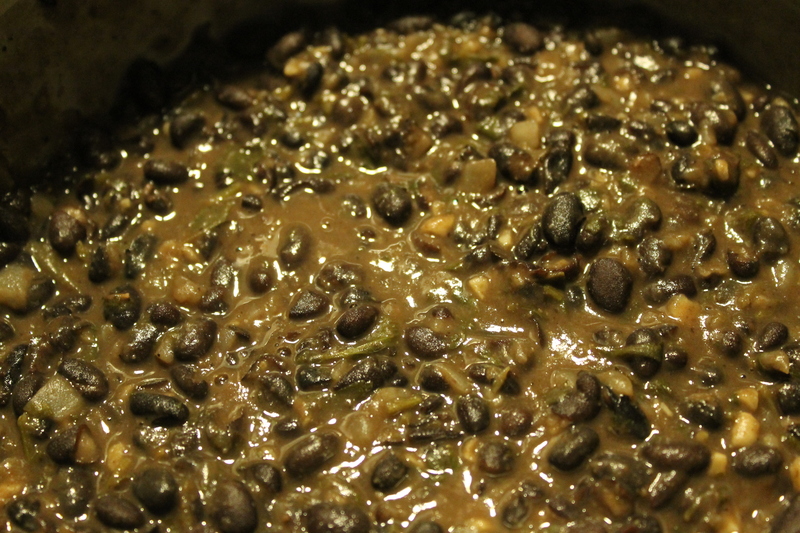 Lower the heat to medium-low, cover the saucepan, and let the beans simmer for 30 minutes. Stir occasionally. Be sure to taste for seasoning. Add more broth or water if the beans become too dry. 5. 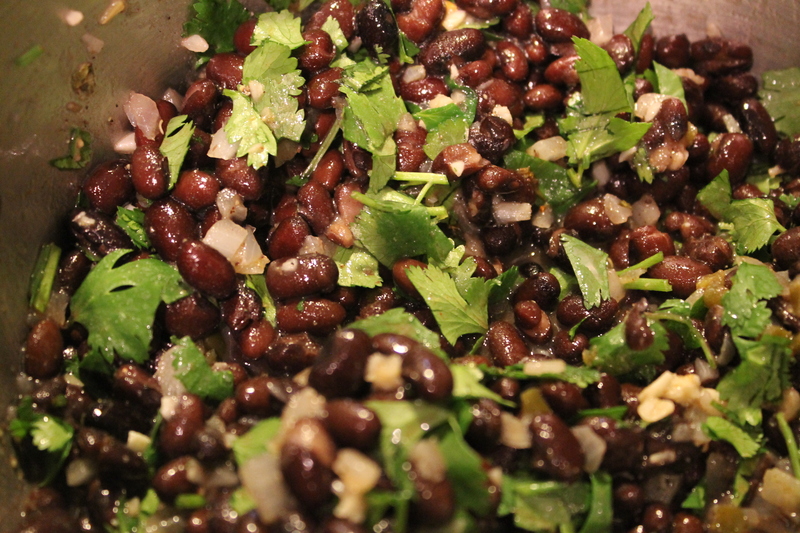 When the beans are soft and the broth has thickened, remove the saucepan from the heat and stir in the remaining cilantro and taste for seasoning. Adding the other half of the cilantro. If you’re using tomato, add it now. 6. 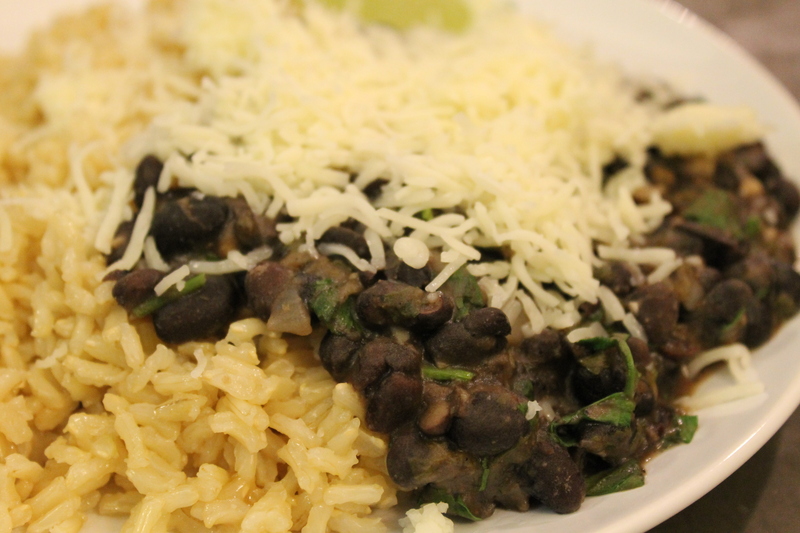 Serve the beans with rice, cheese, a lime wedge, and cornbread or tortillas on the side. It’s hard to believe even 15 – 20 years ago most Americans had never even heard of Thai food outside of cities that had a large Asian population. Now, Pad Thai, Pad See Ew, Massaman Curry, Green Papaya Salad, and Green Chicken Curry seem to be everywhere. 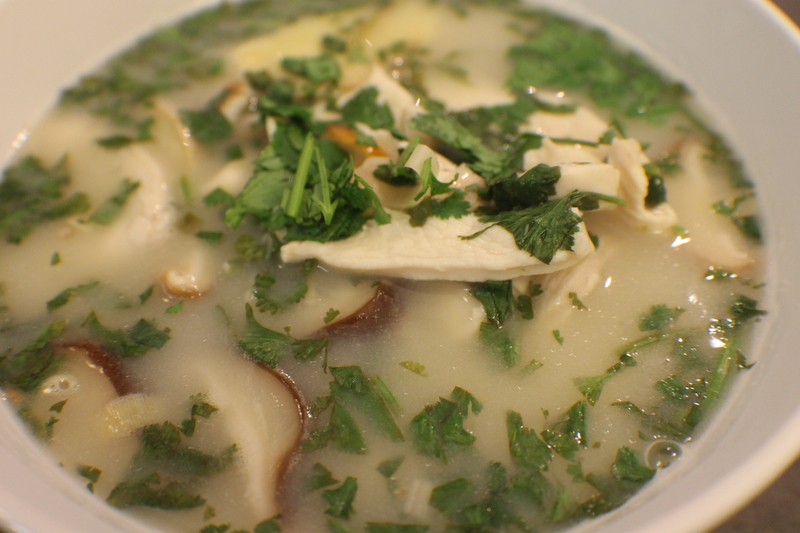 As much as I like those dishes, and many others, one stands out for me: Thom Yum Gai – Chicken Coconut Soup. The words “thom yum” basically mean “hot and sour soup”. “Gai” is the chicken version of this soup. Other styles of thom yum include – “Pla”: a fish soup eaten with rice; “Kha Mu”: a slower cooked soup made with pork knuckles. There are several other variations of this soup. This is not only a refreshing soup to eat any time of year, but it’s one on my go-to’s when Husband Steve and I aren’t feeling well. Something about the alchemy of Asian soups in general that just make us feel better. I like to make my Thom Yum Gai heavily seasoned. So, my soup has a pronounced, but not overbearing flavor, of ginger, lime, and chiles. I wanted to keep the flavor in line with what I’ve eaten at some of my favorite Thai restaurants. Of course, if you want to go lighter, adjust the seasonings as you like. Besides the taste, the next best thing about this soup is the quickness and ease in which it comes together. From start to finish, less than an hour. I will say that my inspiration for this recipe comes from James Peterson. His award-nominated book, Splendid Soups, is arguably the best book on soups ever published. While this is my recipe, he was definitely an influence on the direction I took. 1. Kaffir lime leaves are an authentic ingredient in this recipe. However, even with the plethora of Asian markets now in Austin, I still have a very difficult time finding them. 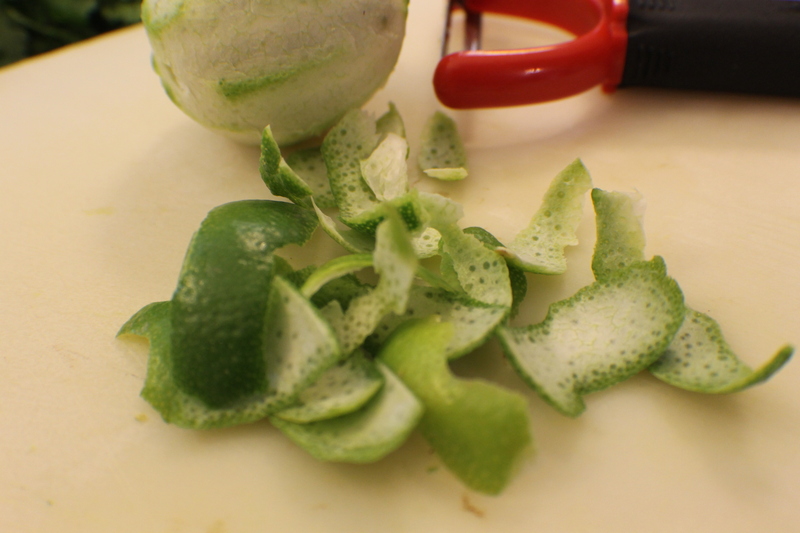 So, I now use lime peel. However, if you can find Kaffir leaves, by all means, use them. 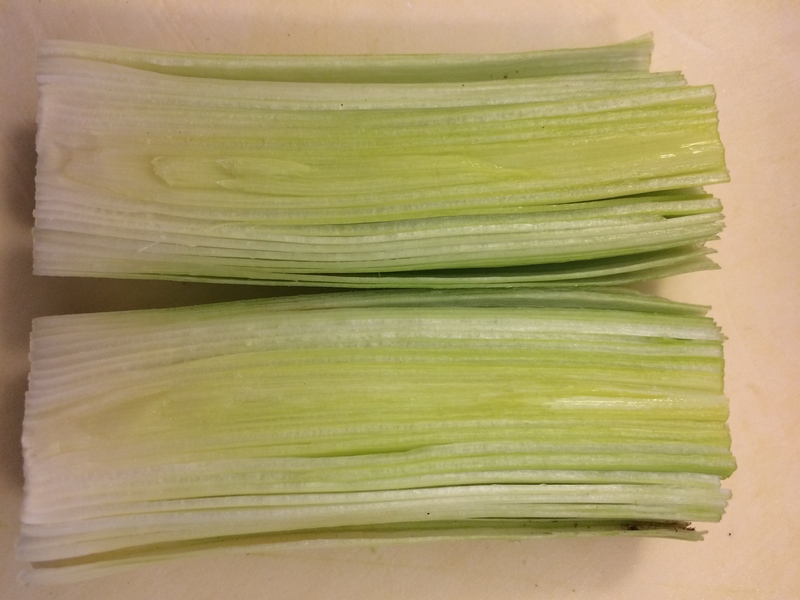 4 – 6 leaves, cut into julienne (thin) strips will work well. 2. 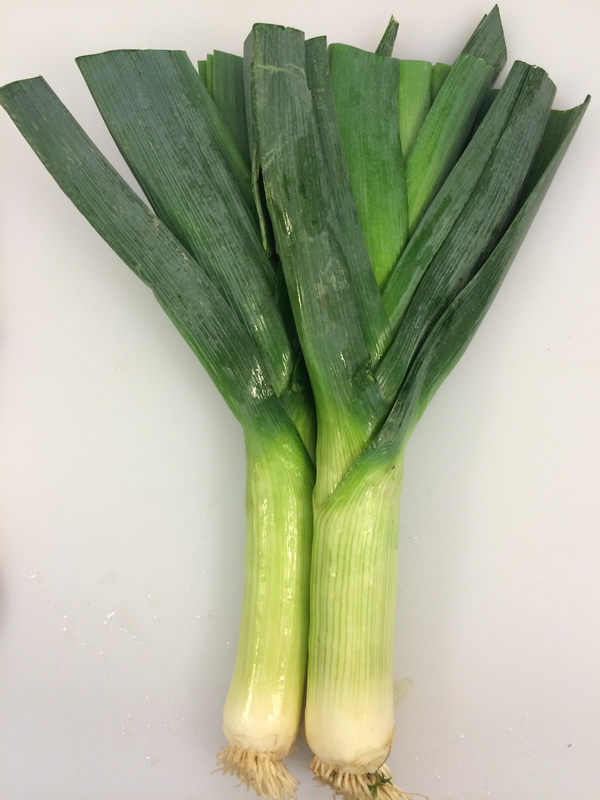 If you can’t find lemongrass, you can use the peel of 1 lemon. Alternately, if can find it, there is a lemongrass paste that is available in some supermarkets; however, once you open the tube, it must be used within a finite amount of time. If you decide to use the paste, check the measurements on the container to see how much you need. DO NOT use dried lemongrass; all of the oils that give it its flavor will have dissolved leaving you with basically grass clippings. 3. 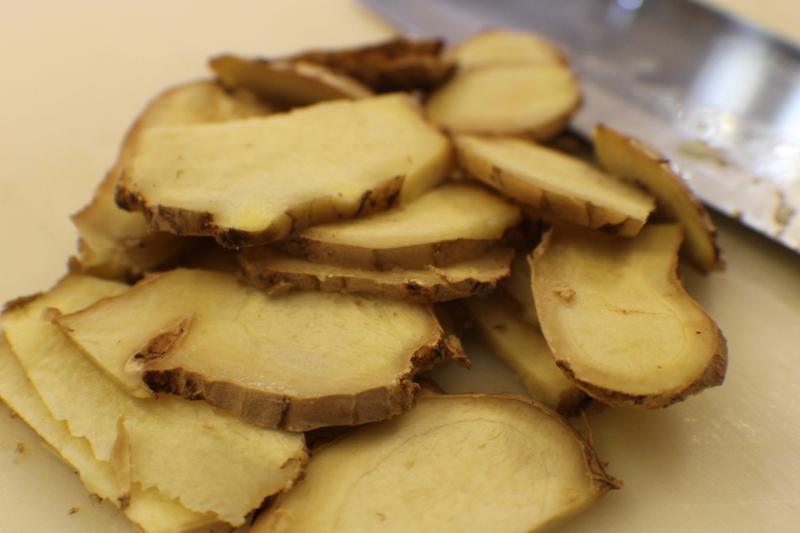 You can peel the ginger or not. I generally don’t. If you do prefer to leave the skin on, be sure to wash the ginger thoroughly. 4. Shiitake mushrooms are really best for this dish. However, if you don’t like or can’t find them, you can use straw mushrooms (you can usually find them canned. Be sure to drain them first). In a pinch, criminis will do. 5. Chicken is the most common way to make this soup. However, you can also make it with shrimp, mixed fish and/or shellfish, pork, or tofu. Just use the same amount as you would the chicken. Be sure to use the corresponding broth as well. I’ve seen some restaurants serve thom yum with beef, but I don’t know how authentic that is or if it’s just to satisfy American palates. 6. By the way, fish sauce is essential to making this dish. There’s really no omitting it. 7. If you are making this dish with tofu and want to make it vegan, here is a recipe for vegan fish sauce. 8. 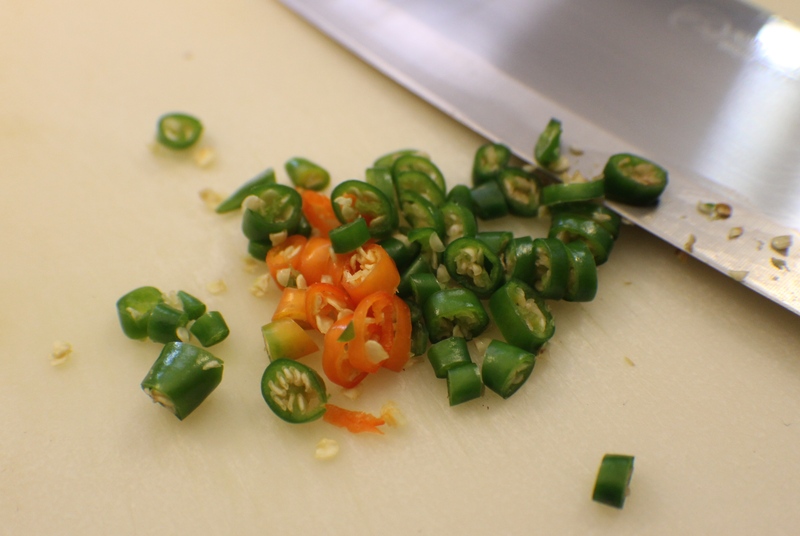 If you can’t find Thai (also known as bird) chiles, you can substitute 3 – 4 serrano chiles. If you don’t want that much heat, be sure to remove the seeds and membranes. You can also cut back on the number of chiles. 9. To help stretch the soup and/or help mitigate the heat, you can serve some Jasmin rice alongside the soup. Alternately, have some cooked rice noodles in the bottom of the serving bowl and pour the soup on top. Just have the noodles or rice on the side, not in the actual soup pot. 10. Even though leaving all of the seasonings in the soup is more authentic, if you want to, after the soup has cooked, you can strain the broth, pick the chicken and mushrooms out of the seasonings. and place them back into the broth before serving. This is especially helpful if all you really want to do is drink the broth from a mug. 11. If you do decide to go full authentic, serve the soup with a pair of chopsticks and a small bowl on the side so your guests can place their pieces of lemongrass, ginger, etc., aside as they eat. 1. 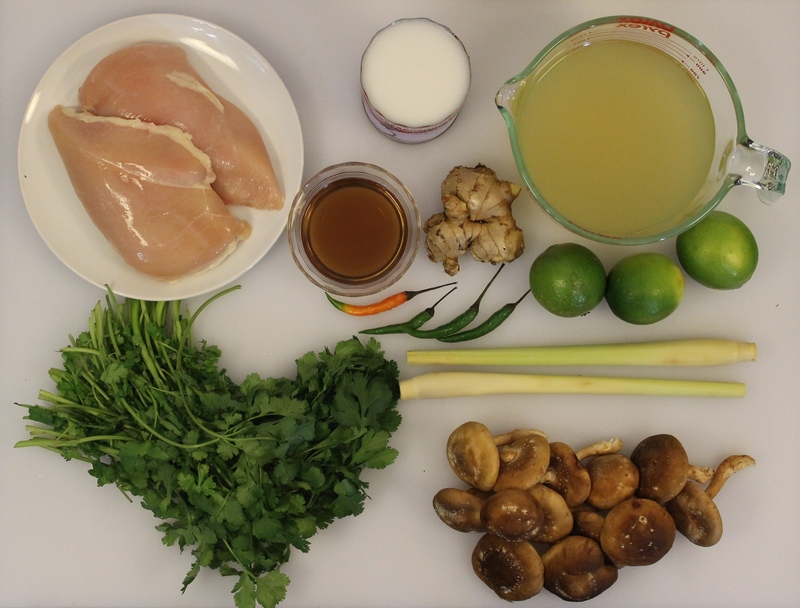 In a large saucepan, add the chicken broth, lime peel, lemongrass, ginger, chiles, fish sauce, and lime juice. Bring to a boil over high heat. 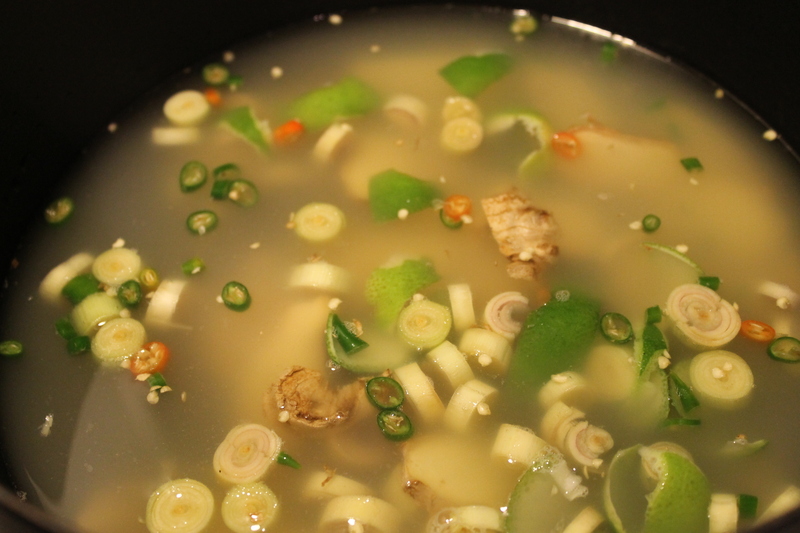 The broth, lime juice, lime peel, ginger, lemongrass, fish sauce, and chiles in the saucepan. 2. 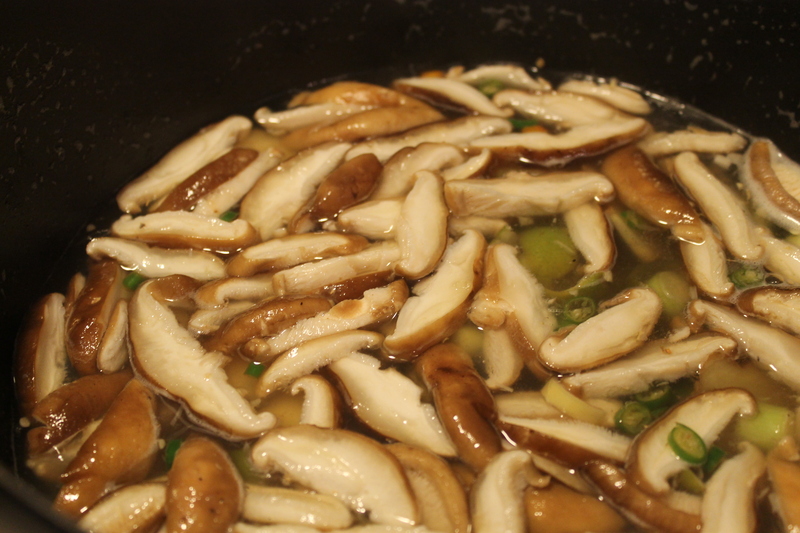 Add the shiitakes, lower the heat to medium, and cook for 5 minutes. Adding the shiitakes. 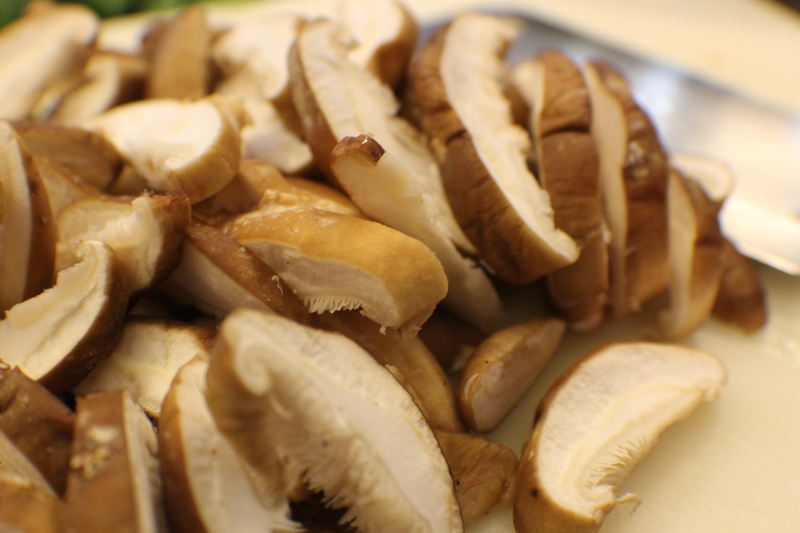 I like to use this mushroom because it adds a wonderful flavor and stands up to the cooking. 3. 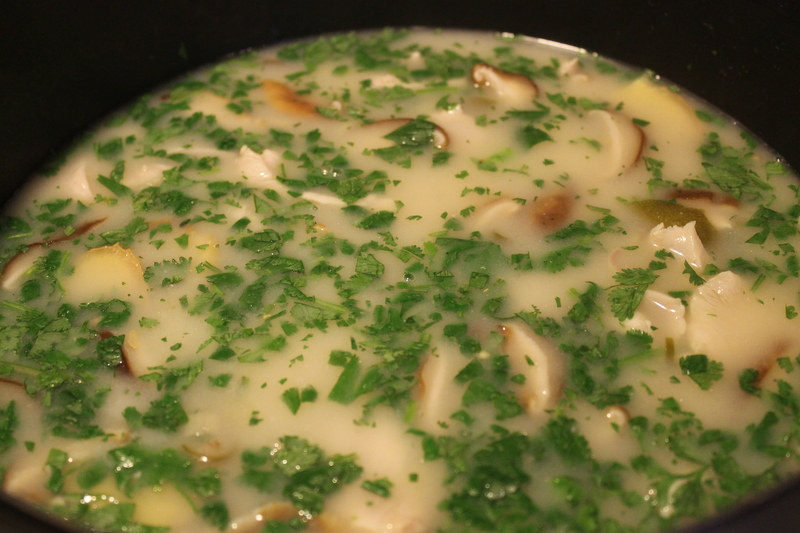 Add the chicken, coconut milk, and cilantro. 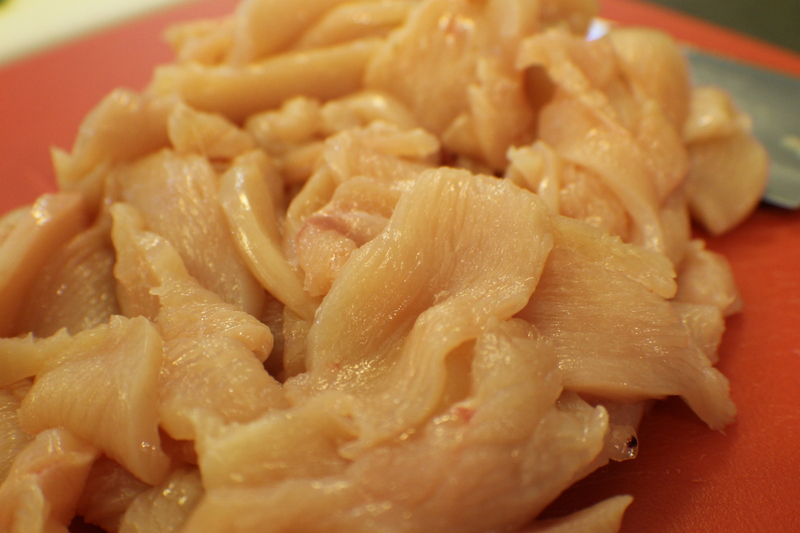 Continue cooking until the chicken is just done; about 3 – 5 minutes. Adding the chicken, coconut milk, and cilantro. Cook just until the chicken is done. You want to be sure not to overcook it. 4. When the chicken is done, remove the saucepan from the heat and taste for seasoning. I have to admit, sometimes, in this wanna-be low-carb world, I just want to enjoy a big bowl of pasta. It’s quick, easy, satisfying, and filling. But, of course, as always and most importantly, delicious. 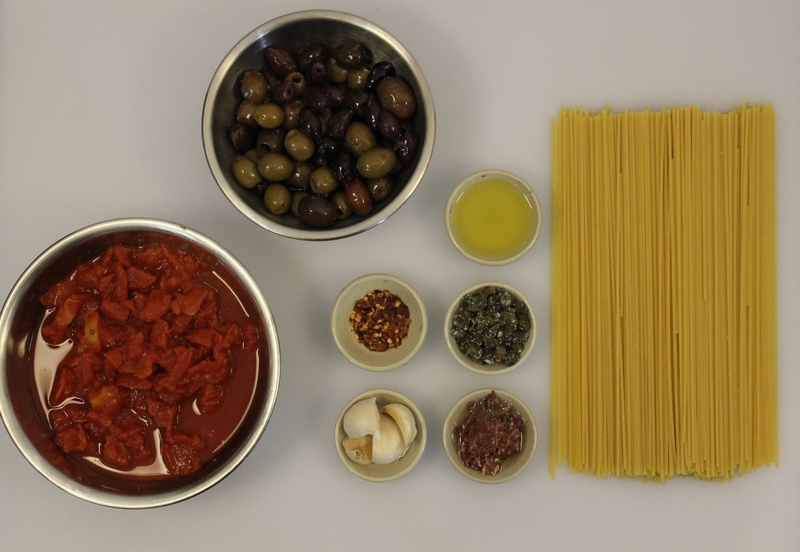 So, I’m going to introduce you to one of my & Husband Steve’s favorite pasta dishes. Pasta alla Puttanesca. Pasta alla Puttanesca literally translates into “Whores’ Pasta”. 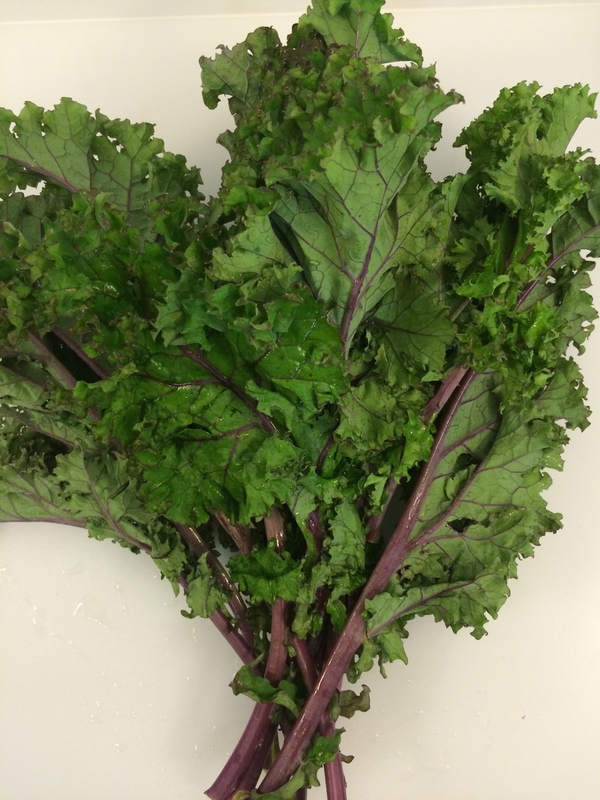 Its origin myths are a bit murky, but by most accounts, it’s a dish that dates back only about 50 – 60 years and was most likely created in southern Italy. 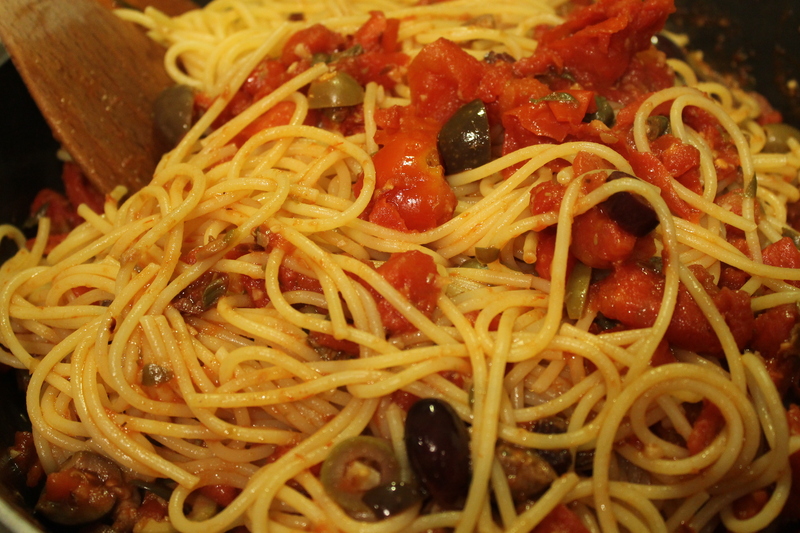 Some say the dish was invented by an Italian restaurateur who had an influx of customers near closing time one evening and threw together what he had left over – some olives, tomatoes, and peppers. Another origin story is that is was named “puttanesca” because it was easy and everything went into it. A third story is “decent” Italian housewives made this sauce with whatever they had laying around and threw it at ladies of the night while screaming “puttana!”. I’m not so sure about the third one. But, who knows? This is an easy dish. From prep to eating, it takes no more than 45 minutes. 1. 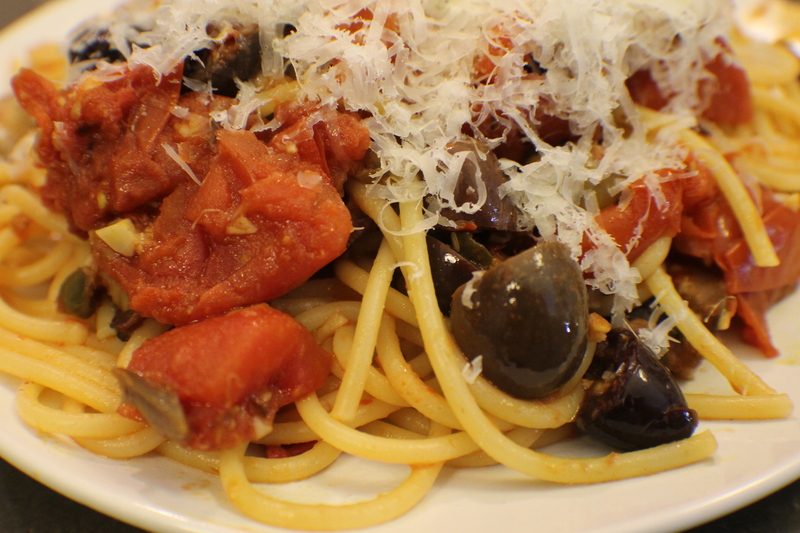 Since there are no true hard and fast rules for this dish – except that it must have the tomatoes, olives, and peppers – you can add or remove ingredients as you like. That being said, I like to think I’ve at least stayed with the spirit of the original recipe. 2. Some recipes have anchovies, some don’t. If you want to make this dish vegetarian/vegan, certainly omit the anchovies. 3. It’s also very important to at least roughly chop the olives. Even if you do buy olives that say “pitted”, pits will happen. The chopping will help you find any before your guests or family do. 4. Be sure to taste the finished sauce before adding any additional salt. 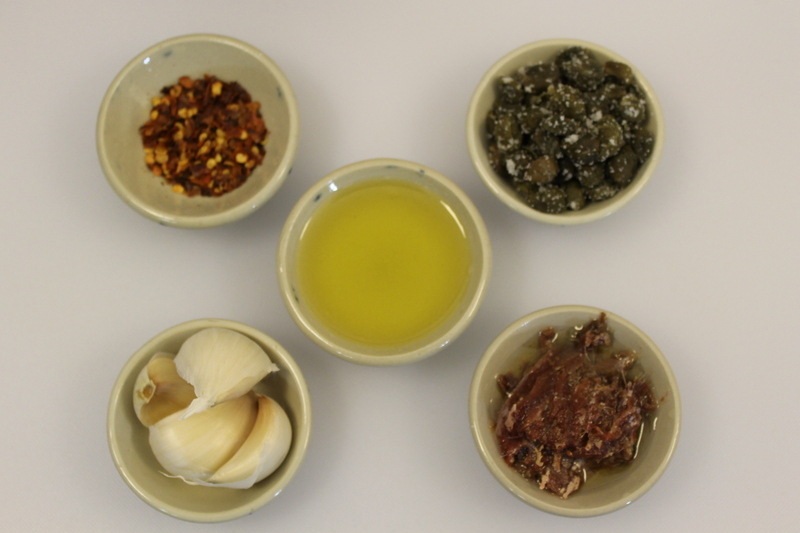 The olives are in brine, the anchovies are salted, and the capers are either in brine or salt. 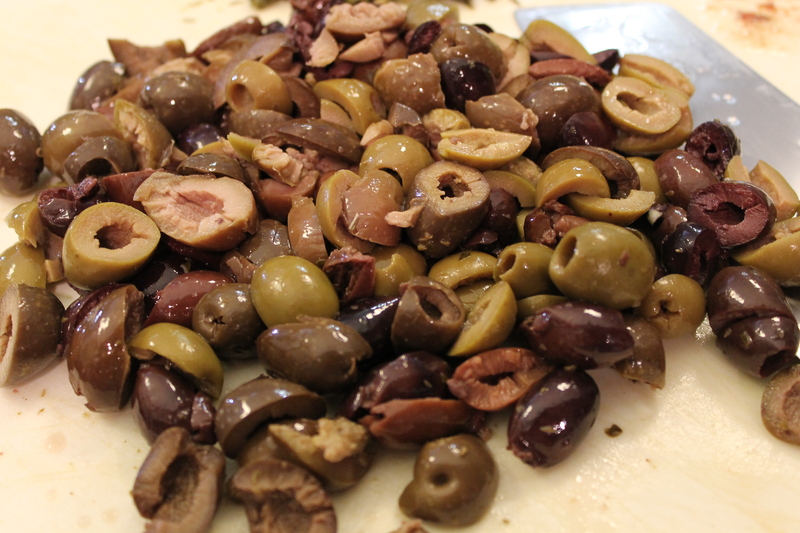 While you can rinse the excess saltiness off the olives and capers, some salt will still be there. 5. 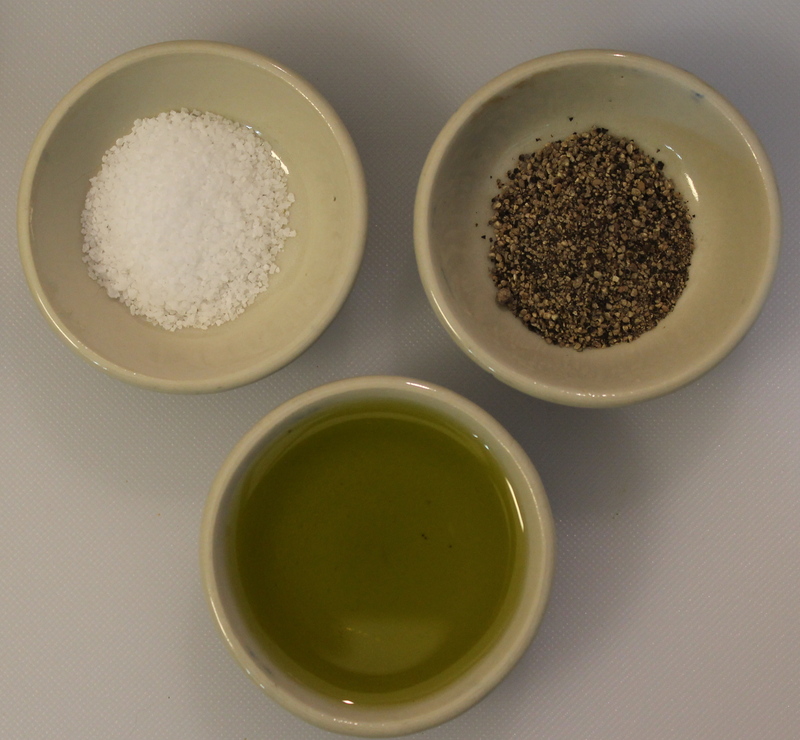 Occasionally, I like to use some of the oil from the anchovy jar with the olive oil. I really like anchovies. It’s important to at least roughly chop the olives, even if they’re pitted. Sometimes, pits will still happen. It’s better you find them during prep than your family or guests to find them during dinner. 1. Cook the pasta according to the package directions. Drain and set aside. 2. In a large skillet, heat the olive oil over medium-high heat. Add the garlic, pepper flakes, and anchovies. Saute for 1 – 2 minutes. Sauteing the garlic, red pepper flakes, and anchovies. The anchovies will melt right down. Lovely. 3. 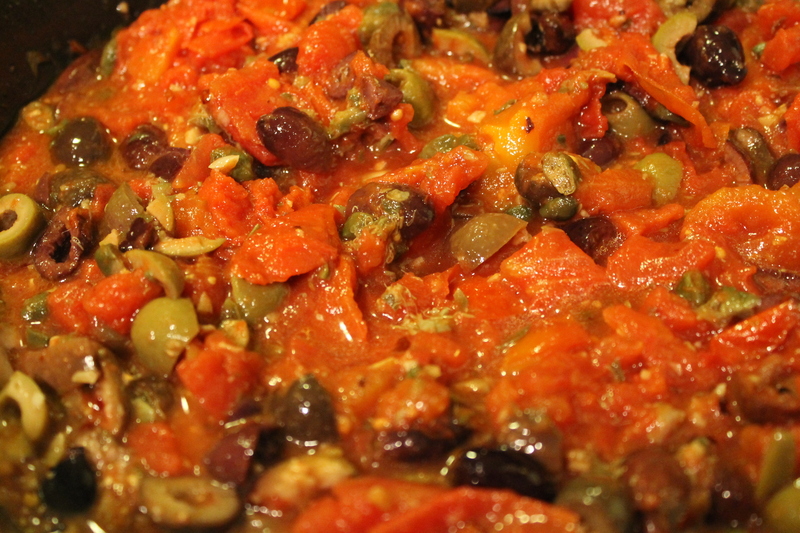 Add the tomatoes, capers, and olives. Lower the heat to medium and cook for 10 minutes, stirring occasionally. 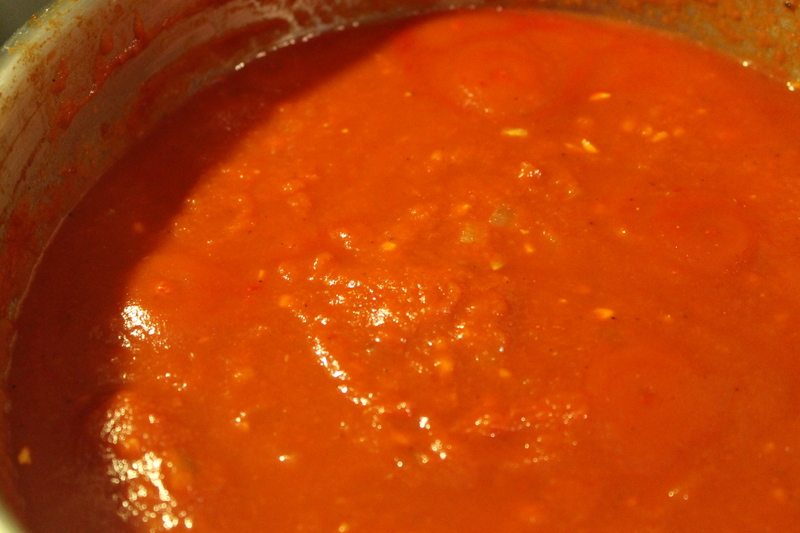 You want some of the liquid from the tomatoes to evaporate and the sauce to thicken slightly. Adding the tomatoes, capers, and olives. 4. Take the skillet off the heat and toss the spaghetti in the sauce. Taste for salt (you’ll very likely not need it). Tossing the pasta with the sauce. Take your time with this step. 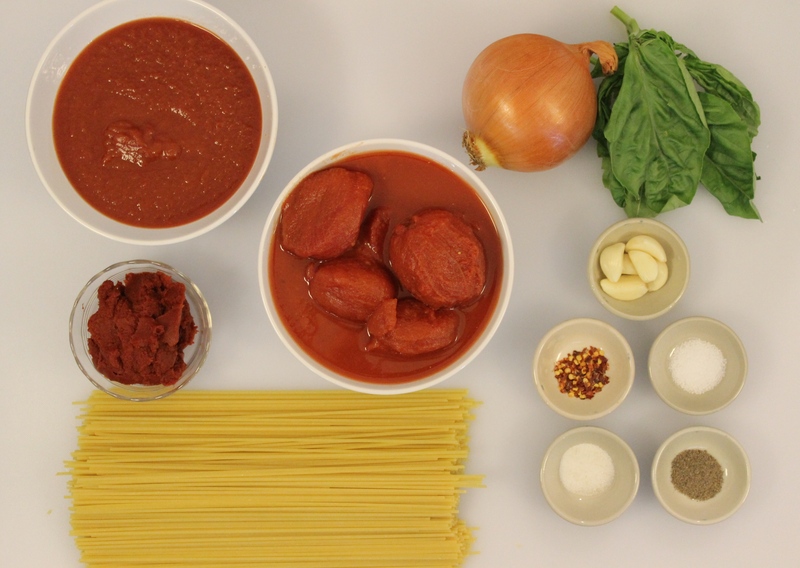 You want to be sure to coat the pasta and mix in everything as thoroughly as possible. 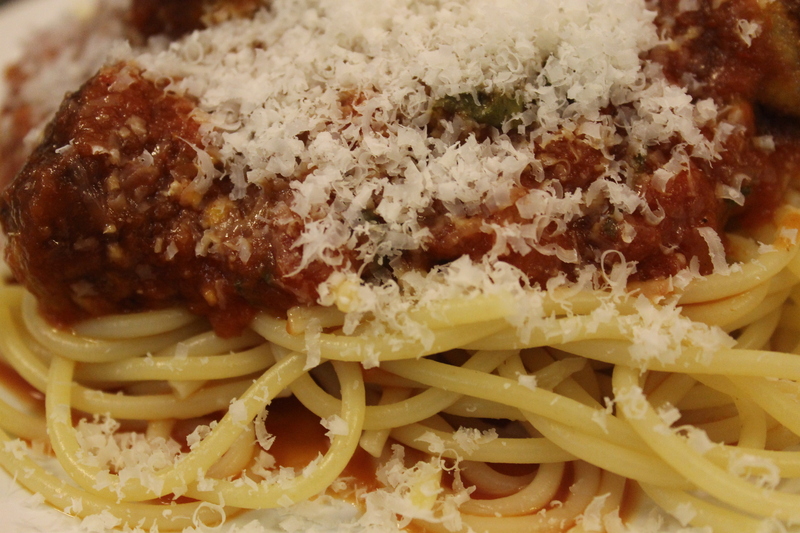 Serve with a generous helping of Parmesan. With Valentine’s Day just around the corner (if you’re into that sort of thing), chocolate, while certainly always the culinary rage, takes on a special significance right now for a variety of reasons. 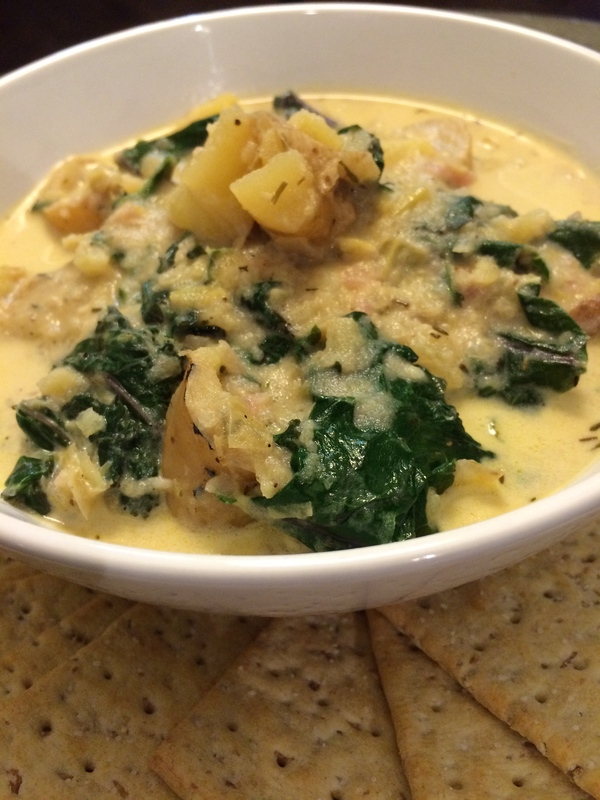 So, here is recipe you can make for your beloved (or even just well-liked) that’s easy & quick. Plus, you won’t look like one of those crazed and desperate people rushing around the grocery store picking over the remains at 7pm on The Day. And, hey, let’s admit it. That resolution to lose weight didn’t last past the 3rd week of January. If it has, congratulations. Keep it up. But let yourself indulge on this one day. One of the first documentations of fudge is in a letter written by Emelyn Battersby Hartridge, then a student at Vassar College in Poughkeepsie, New York. She wrote that a schoolmate’s cousin made fudge in Baltimore in 1886 and sold it for 40 cents a pound. She obtained the recipe, and in 1888, made 30 pounds of it for the Vassar Senior Auction. Word of the confection spread to other women’s colleges. 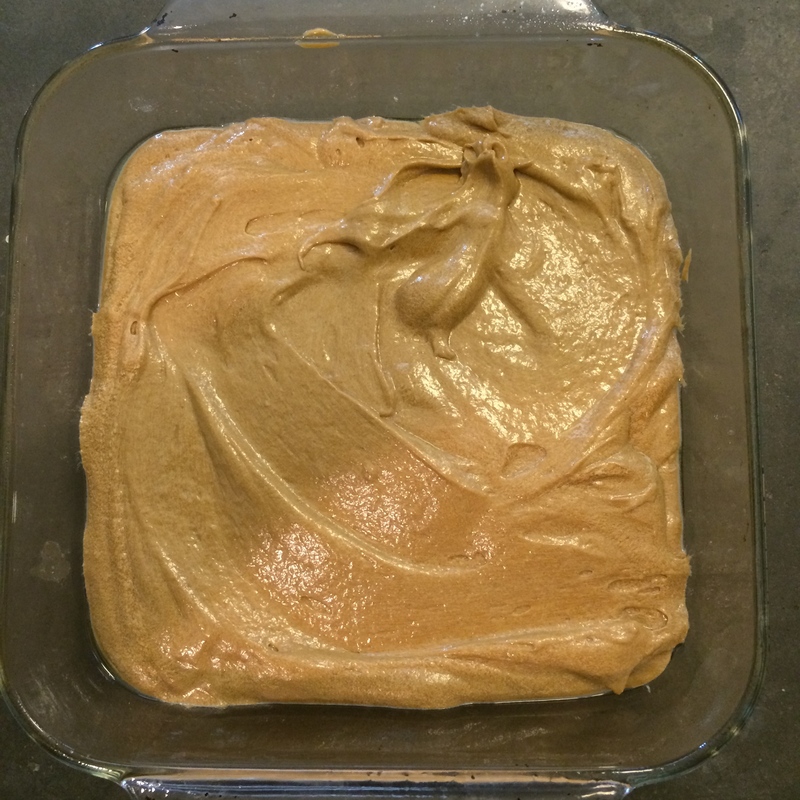 Wellesley and Smith developed their own versions of this “original” fudge recipe. The original fudge recipes were famously delicate: Precise measurements, cooking time and constant stirring were crucial for perfect fudge. The recipe looks simple—heat a mixture of sugar, butter and milk or cream to the soft-ball stage (224°-238°F), then beat it to a smooth, creamy consistency while it cools. Combine sugar and cream and cook over moderate heat. When this becomes very hot, add the chocolate. Stir constantly. 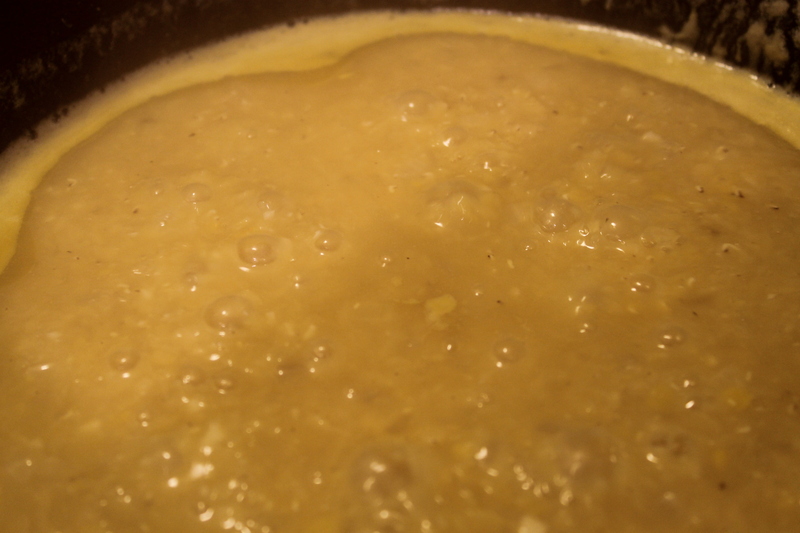 Cook until mixture reaches soft-ball stage (234°-238°F). Remove from heat and add butter. Cool slightly, then mix until fudge starts to thicken. Transfer to a buttered tin. Cut into diamond-shaped pieces before fudge hardens completely. Because of the difficulty and time needed for the “old school” fudge recipes, “foolproof” recipes were developed for the home cook that included corn syrup, which prevents crystallization and produces smooth fudge. Later recipes substituted sweetened condensed milk, marshmallow creme, or other ingredients for the milk/cream that were better guarantees of a perfect fudge texture. 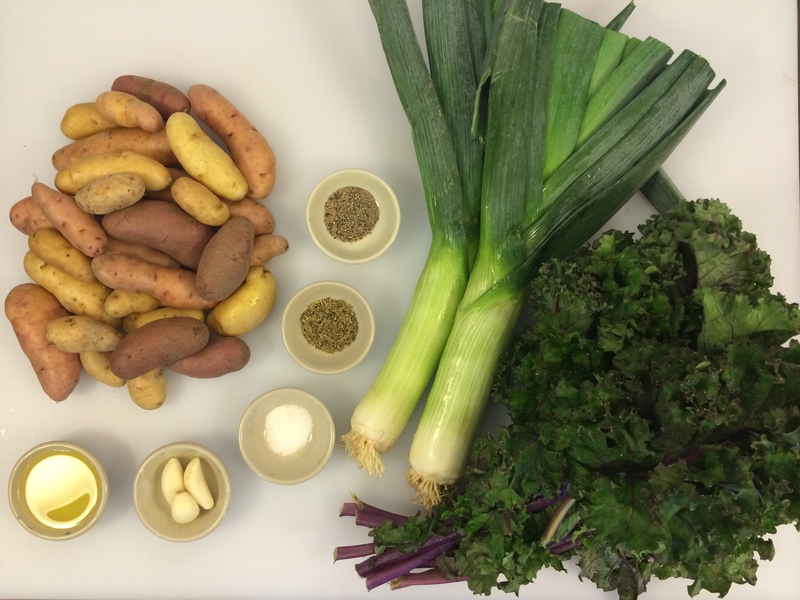 I have gone with a simpler, or “new school” recipe here. I know that some of the more traditional candy makers view these types of recipes with no small amount of skepticism, but it is quick & easy and a perfect gateway to the wider world of candy making. 1. In this post, I used semisweet chocolate chips. Chips save me the hassle of chopping the chocolate and they’re a bit easier to work with. If you do decide to use regular chopped chocolate, be aware that it will behave differently than the chips. Because of the way chips are made – with milk and emulsifiers – the fudge won’t harden (it will become firm, just not as firm as if you use chopped chocolate) the same way or as quickly once it’s been taken off the heat after melting as it will with regular chopped chocolate from a bar. So, there is less room for error if you use chopped semisweet chocolate. 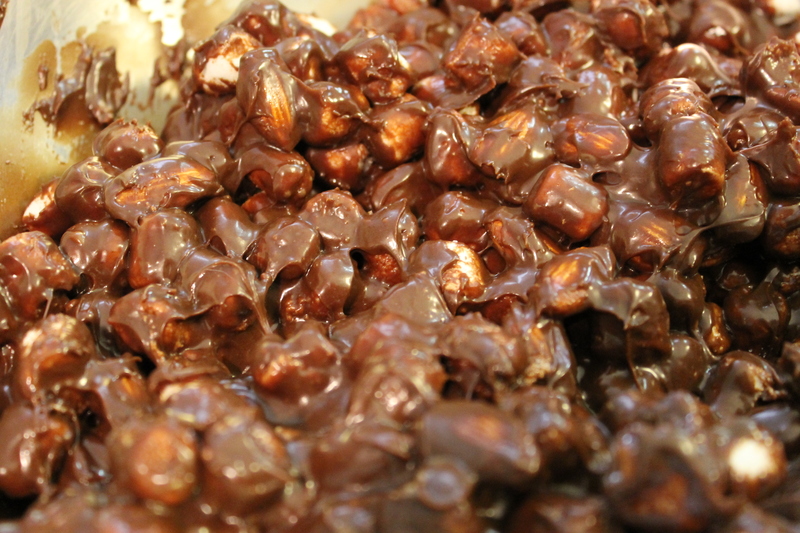 Chips are a little more forgiving; which is good if you’ve never made candy before. 3. My own personal preference, nut-wise, is for roasted unsalted almonds. You can use whatever you like or even a variety. If you like to use salted nuts, go for it. 4. Sweetened condensed milk: do not use 2%. With the chocolate, butter, and marshmallows, I don’t know why you would anyway. 5. Marshmallows. 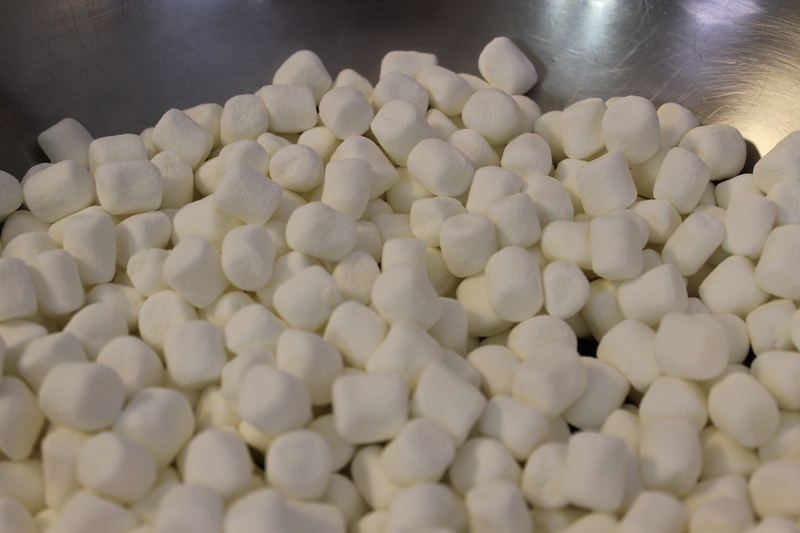 If you are following either halal (Muslim), kosher (Judaism), or vegetarian diets, there is a marshmallow for you. Otherwise, good old Kraft marshmallows are fine. 7. When you take the fudge out of the pan, there may be a thin film of spray on the bottom and on the sides of the edge pieces. I get rid of that by placing the fudge on paper towels for a few minutes. Works like a charm. 1. Line a medium baking dish with foil and spray with nonstick spray. Set aside. Pour the marshmallows into a large bowl and set aside. Pour the almonds into a medium bowl and set aside. Mini marshmallows in the bowl. You can also find Kosher, Halal, or vegetarian marshmallows if Kraft just won’t do. 2. 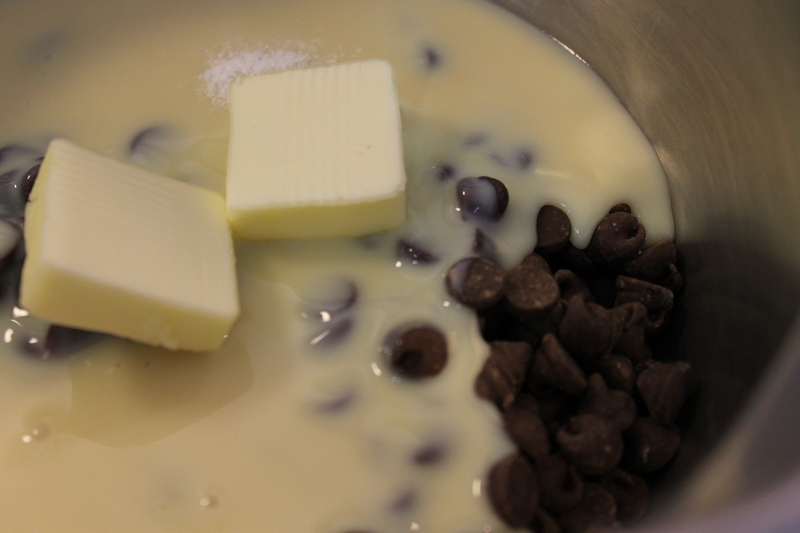 In a medium saucepan over medium heat, mix together the chocolate, condensed milk, butter, and salt. Chocolate, sweetened condensed milk, butter, and salt ready for glory. Stir constantly just until the chocolate is melted, the ingredients are well combined, and the mixture is smooth. Remove the saucepan from the heat and stir in the extract. You just want to heat the ingredients until the chocolate is melted and the mixture is smooth. You don’t want the fudge to become too hot or take a chance on the chocolate scorching. 3. 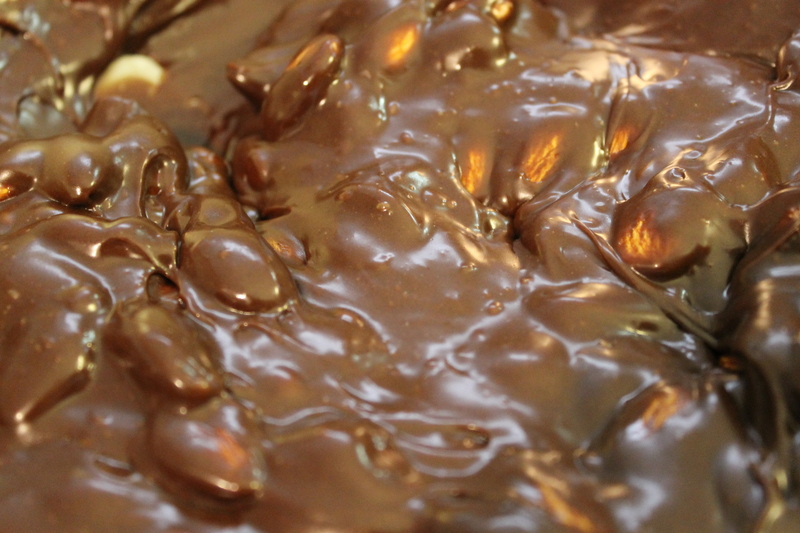 Pour the fudge into the bowl with the almonds and mix together thoroughly. 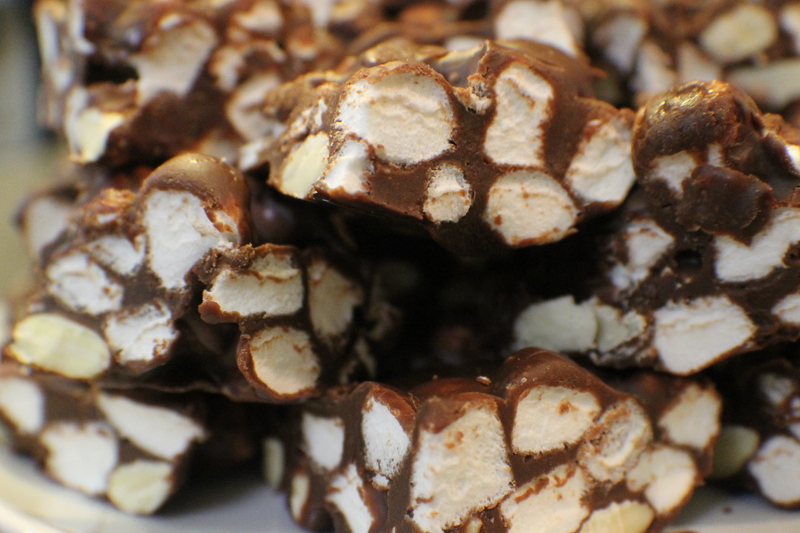 Fudge and almonds. I like to mix in the almonds at this stage because they will be more evenly distributed and they help to cool the fudge. Continue stirring almost constantly for about 5 minutes. This will help dissipate the heat and keep the fudge from setting up. When the bottom of the bowl feels comfortably warm (essentially body temperature), it has cooled sufficiently. 4. 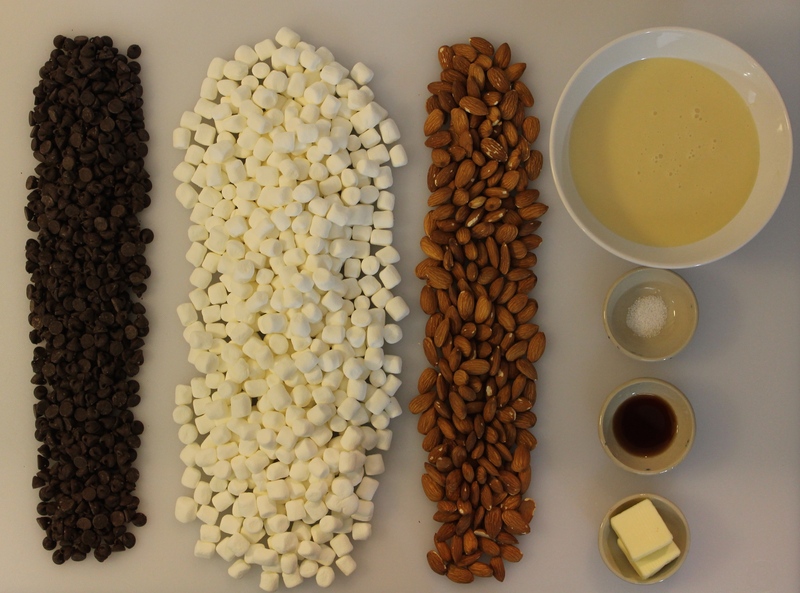 Pour the fudge-almond mixture into the marshmallows and mix thoroughly. 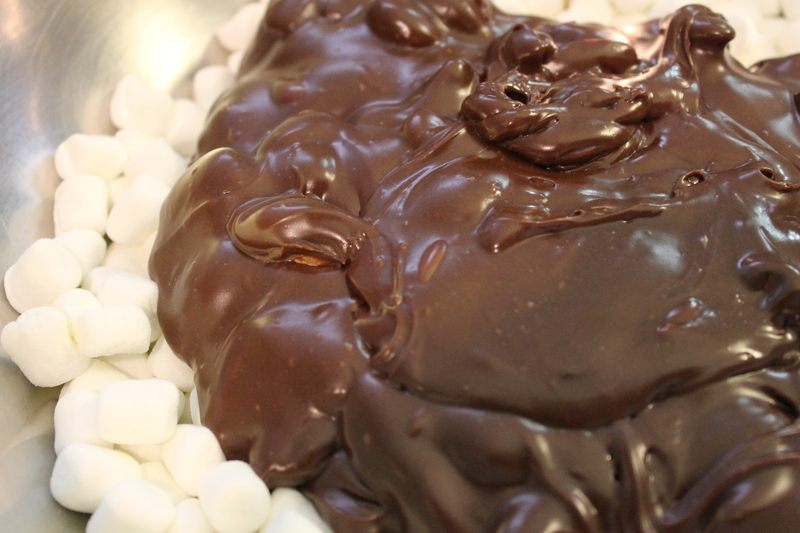 At this point, the fudge should be cooled enough for the marshmallows to be stirred in but not melted or melting. 5. Pour the fudge into the prepared baking pan, spread evenly, cover with plastic wrap, and refrigerate until firm, about 1 – 1 1/2 hours. 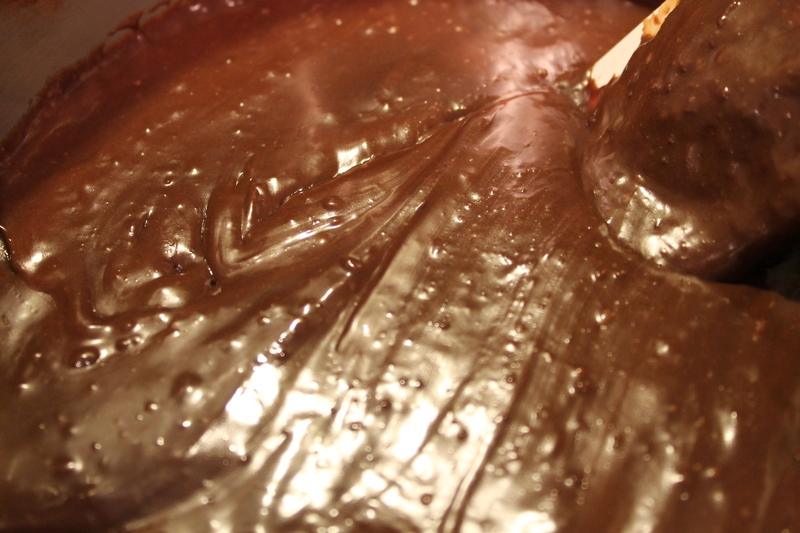 When the fudge is set, cut into 2″ pieces. It will keep in an airtight container for about a week. More than once when I’ve made gingerbread, my husband will come home and simply say, “It smells like Fall in here.” I take that as a compliment. Gingerbread is a confectionary that has seemingly always been associated with Autumn and the Holidays. In Medieval England, the term gingerbread simply meant ‘preserved ginger’. The name wasn’t for the desserts we’re familiar with until the 15th century. According to Rhonda Massingham Hart’s Making Gingerbread Houses, the first known recipe for gingerbread came from Greece in 2400 BC. Chinese recipes were developed during the 10th century and by the late Middle Ages, Europeans had their own version of gingerbread. The hard cookies, sometimes gilded with gold leaf and shaped like animals, kings and queens, were a staple at Medieval fairs in England, France, Holland and Germany. Queen Elizabeth I is credited with the idea of decorating the cookies in this fashion, after she had some made to resemble the dignitaries visiting her court. Over time some of these festivals came to be known as Gingerbread Fairs, and the gingerbread cookies served there were known as ‘fairings.’ The shapes of the gingerbread changed with the season, including flowers in the spring and birds in the fall. Elaborately decorated gingerbread became synonymous with all things fancy and elegant in England. The gold leaf that was often used to decorate gingerbread cookies led to the popular expression ‘to take the gilt off of gingerbread.’ The carved, white architectural details found on many colonial American seaside homes is sometimes referred to as ‘gingerbread work’. Gingerbread houses originated in Germany during the 16th century. The elaborate cookie-walled houses, decorated with foil in addition to gold leaf, became associated with Christmas tradition. Their popularity rose when the Brothers Grimm wrote the story of Hansel and Gretel, in which the main characters stumble upon a house made entirely of treats deep in the forest. It is unclear whether or not gingerbread houses were a result of the popular fairy tale, or vice versa. Soft gingerbread to be baked in pans. No. 2. 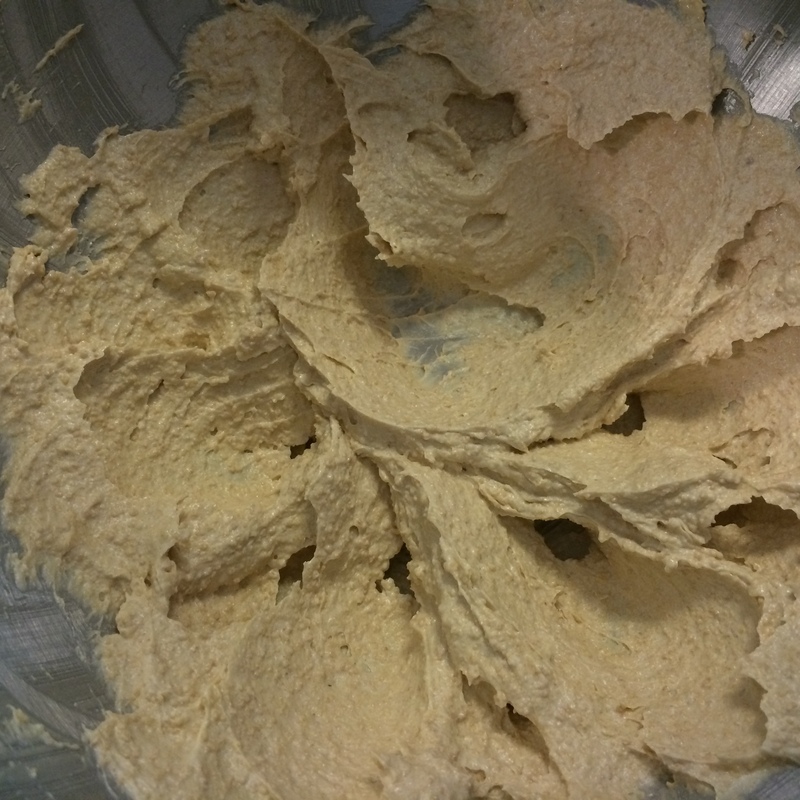 Rub three pounds of sugar, two pounds of butter, into four pounds of flour, add 20 eggs, 4 ounces ginger, 4 spoons rosewater, bake as No. 1. This softer version of gingerbread was more common in America. 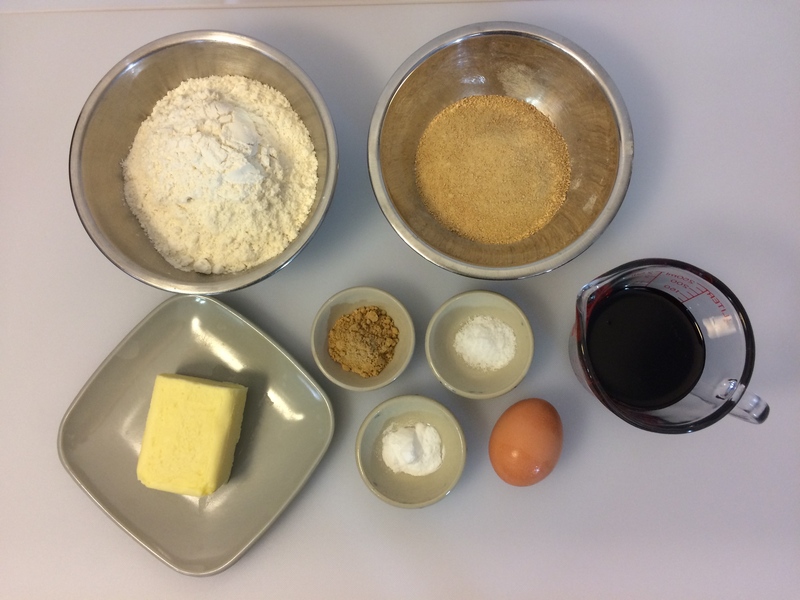 George Washington’s mother, Mary Ball Washington, served her recipe for gingerbread to the Marquis de Lafayette when he visited her Fredericksburg, Virginia home. Since then it was known as Gingerbread Lafayette. 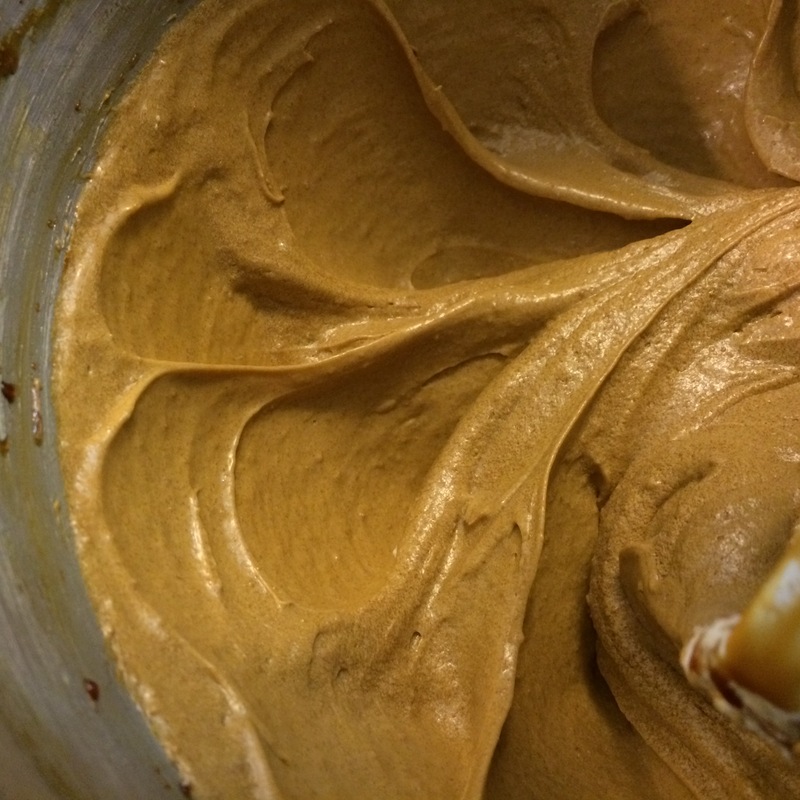 The confection was passed down through generations of Washingtons. A main ingredient in gingerbread is molasses. 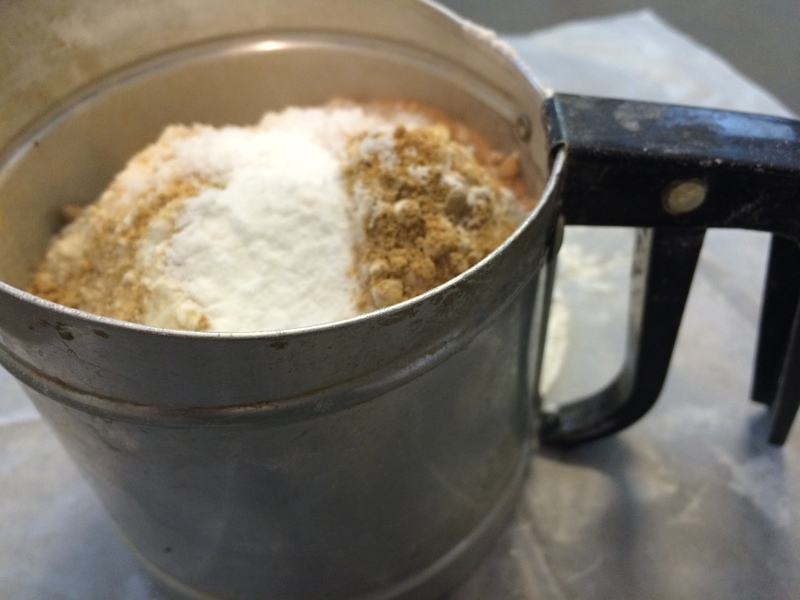 It is basically the leftovers of the sugar making process after the sugar crystals have been removed during boiling. There are several different types of molasses comercially available: Light Molasses, Dark Molasses, Blackstrap Molasses, Sulphured Molasses, and Unsulphured Molasses. 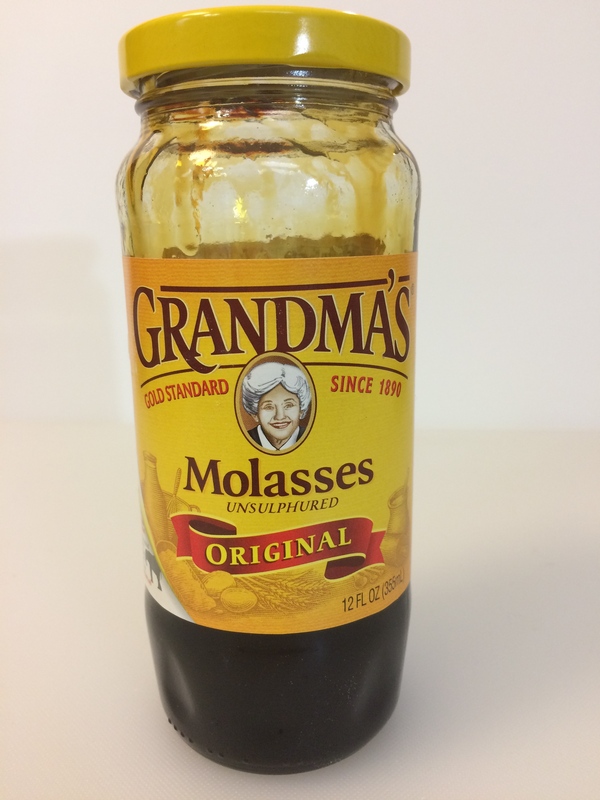 Grandma’s is a good, consistent brand of molasses that’s readily available at just about every grocery. It’s an unsulphured light molasses. Plus, the company sponsors an elephant sanctuary in Tennessee. I’m all about that. You may be asking yourself, what’s the difference? Or, you may not be. But, I’m going to tell you anyway. Dark Molasses: This comes from the second boiling and after more sugar is extracted. It is generally thicker and less sweet. it can also be called “Full” or “Second” molasses. It can be used interchangeably with light molasses for most uses. 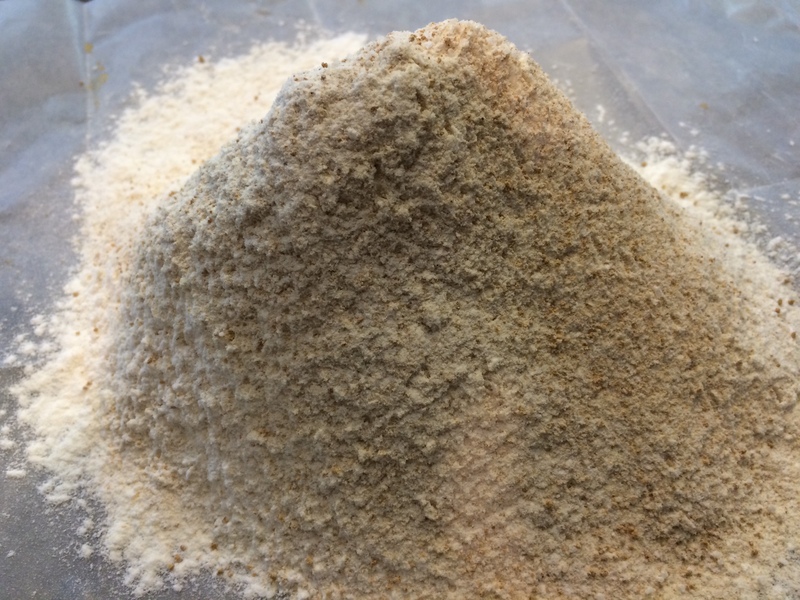 It is most commonly used in baking. Blackstrap Molasses: This comes from the third boiling and is very thick and dark in color. It has the highest mineral content because of its concentration. 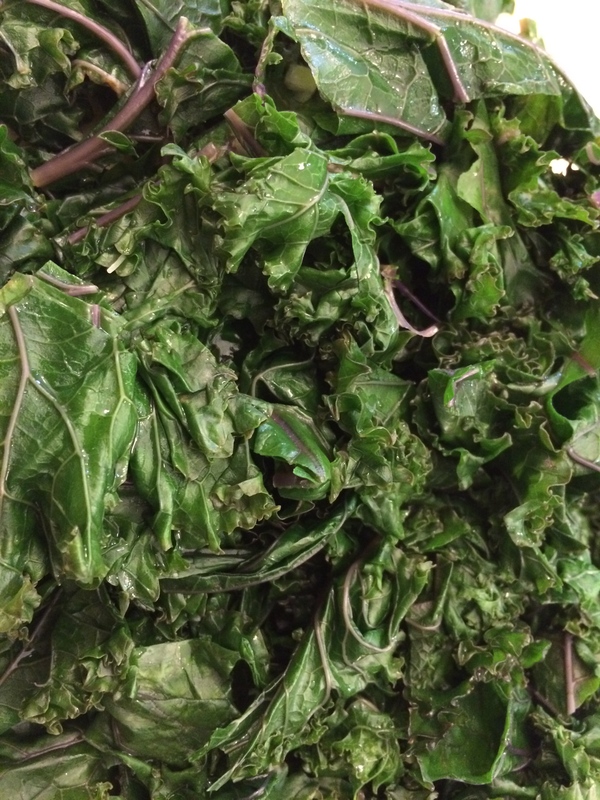 While it can be found in grocery stores, it is most commonly found in health food stores. Some people will use blackstrap molasses (especially vegans) as a health food and supplement to their diets because it contains iron, niacin, and B6, among other minerals that wouldn’t necessarily be in or in very low levels in a vegan diet. 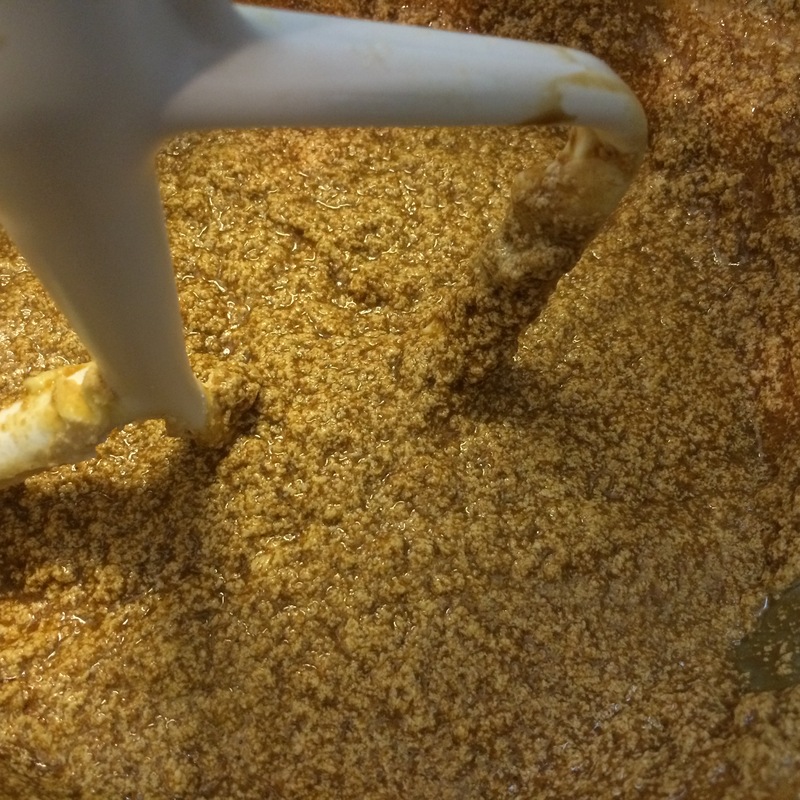 Sulphured and Unsulphured Molasses: Sulphur Dioxide (SO2) is sometimes added to molasses as a preservative because molasses can ferment and spoil. It does change the flavor of the molasses making it less sweet. Unsulphured is preferred because it is sweeter and is closer to the original molasses flavor. And, because, well, it doesn’t have sulphur. Also, molasses can be distilled to make rum. FYI. My inspiration for this recipe came from an old recipe found in a 1965 edition of the Better Homes and Gardens New Cook Book that I received from my mother-in-law not long after I married. As I was flipping through the book, it reminded me of the book my mother had as I was growing up. I believe hers was the same edition. (She still has it. I think it’s now held together with rubber bands.) I always remember the notes and McCall’s Cooking School recipes she would save in her book. 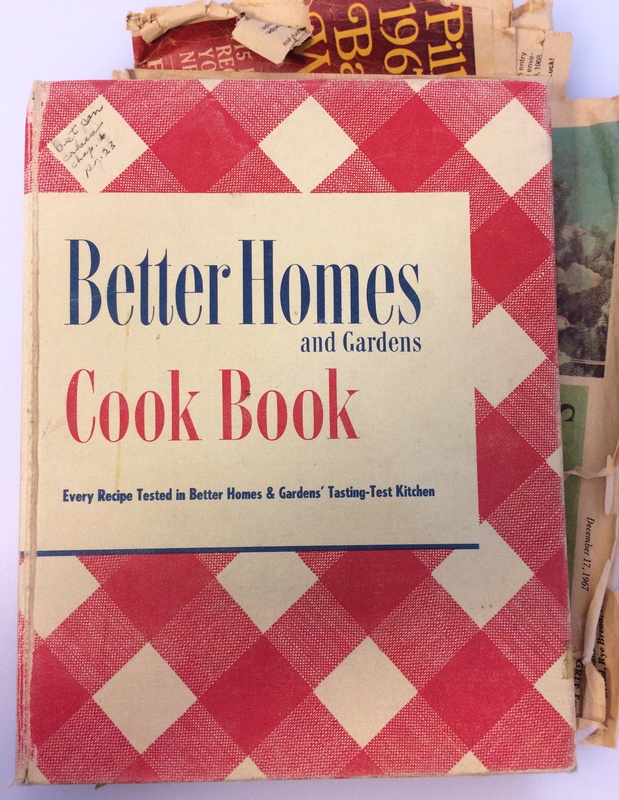 The BHG Cookbook my mother-in-law gave me. 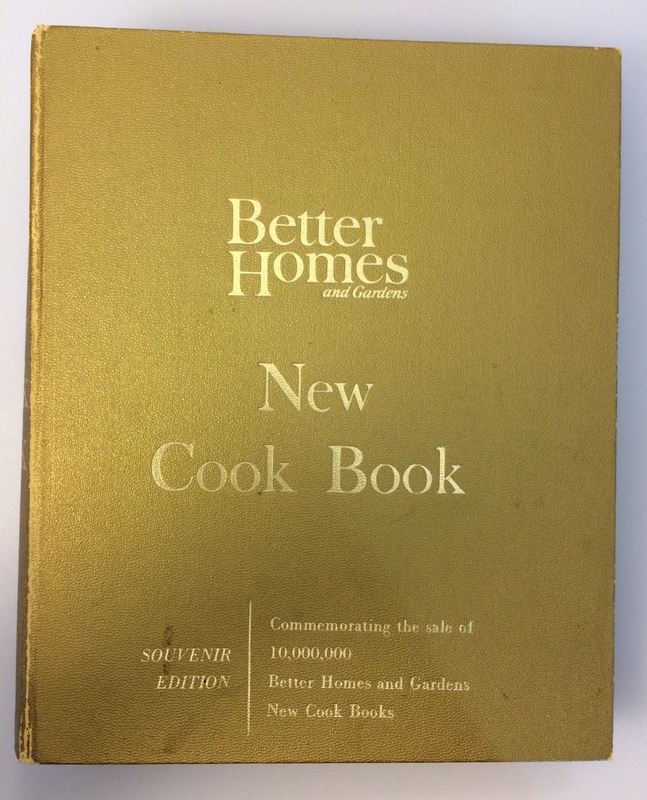 It’s a souvenir edition of the 1965 printing celebrating 10 Million copies sold. My 2nd. 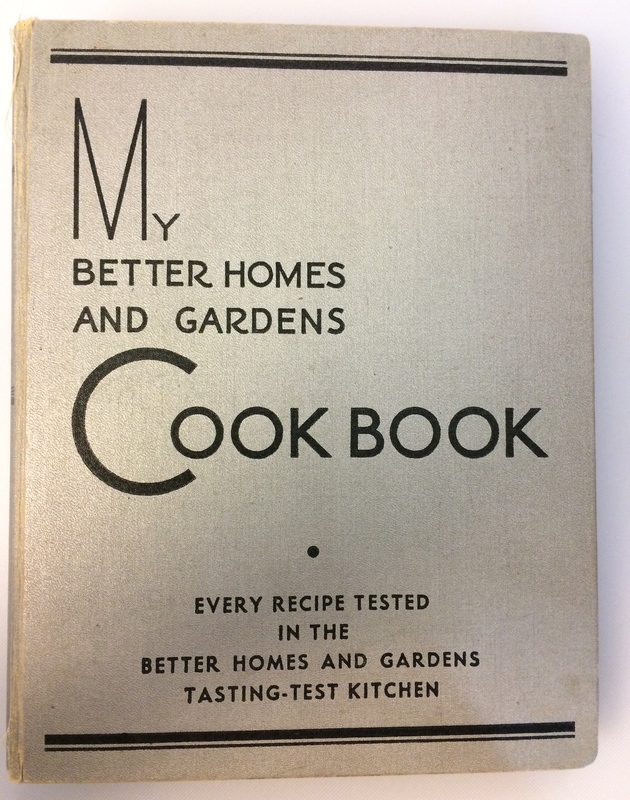 edition, 1935 printing of the BHG Cookbook. I don’t think it’s ever been used. BHG 1950 printing. This is about the time the now familiar red-and-white cover was first used. I bought this off Ebay. It was obviously loved. Mom said to me as recently as Thanksgiving that the gingerbread recipe in the BHG book is a great recipe. In fact, she made it for my sisters and I often when we were kids. * I’ve omitted the cinnamon and added quadruple the ginger. It’s a flavor preference. 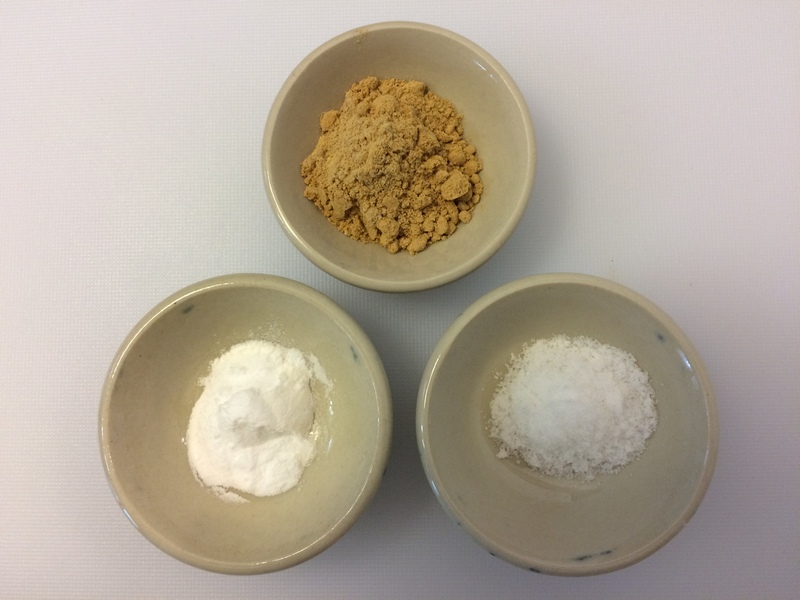 *I’ve replaced the white sugar with either dark brown or maple sugar. Again, it’s a flavor preference. The new sugars aren’t as sweet as white sugar. *I’m using butter flavored shortening. Because I can. Now, of course, you can do whatever you like. Add or subtract as you see fit. Other sweet spices (i.e. cinnamon, allspice, cloves, nutmeg, anise) will work well in this recipe, too. However, you may want to be somewhat conservative on the amount of extra spice you use. 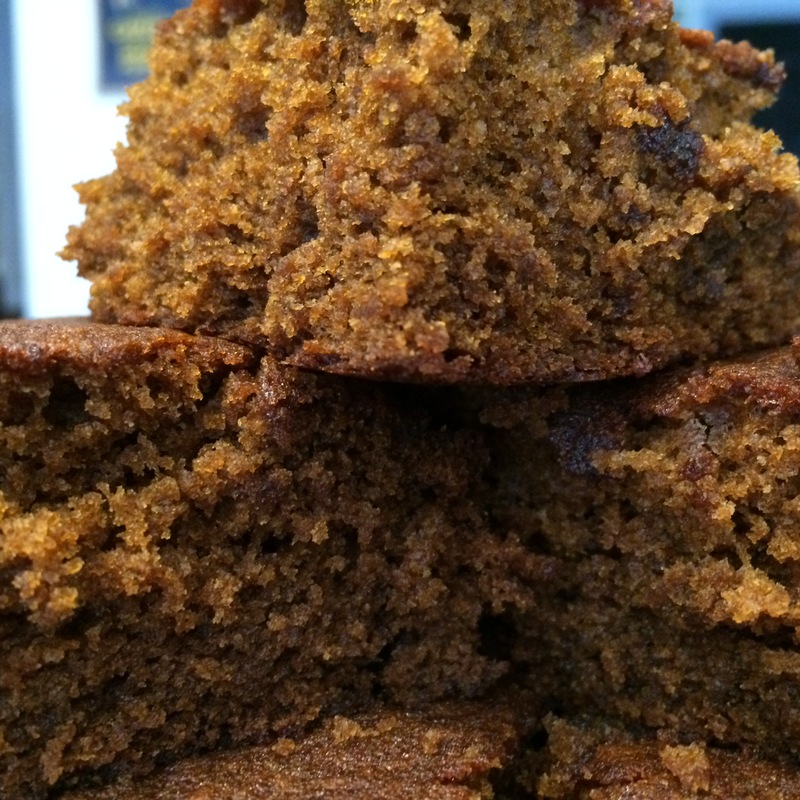 You’re making gingerbread, not a spice cake. 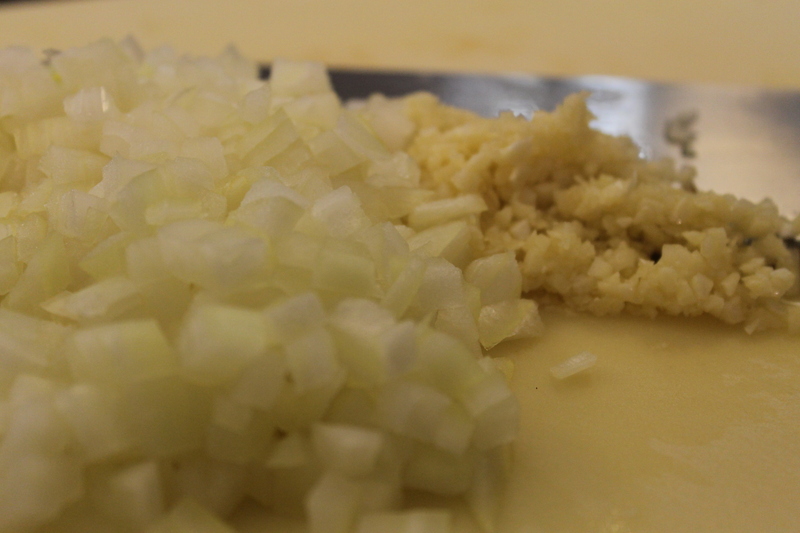 Some people will also add a small amount of finely chopped candied ginger to the recipe as well. 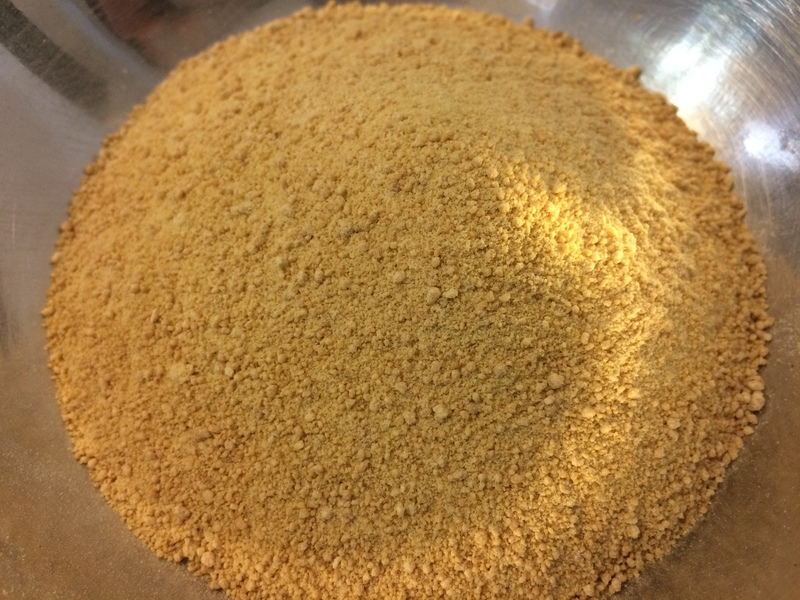 The maple sugar. Like most real maple products, it is not inexpensive. But, if you do have some, use it. 1. Preheat your oven to 350F. Spray or butter & flour a 9″ x 9″ x 2″ baking dish. Set aside. 2. Sift together the flour, salt, baking soda, and ginger. Set aside. My mom’s old sifter that she gifted to me. Sifted. 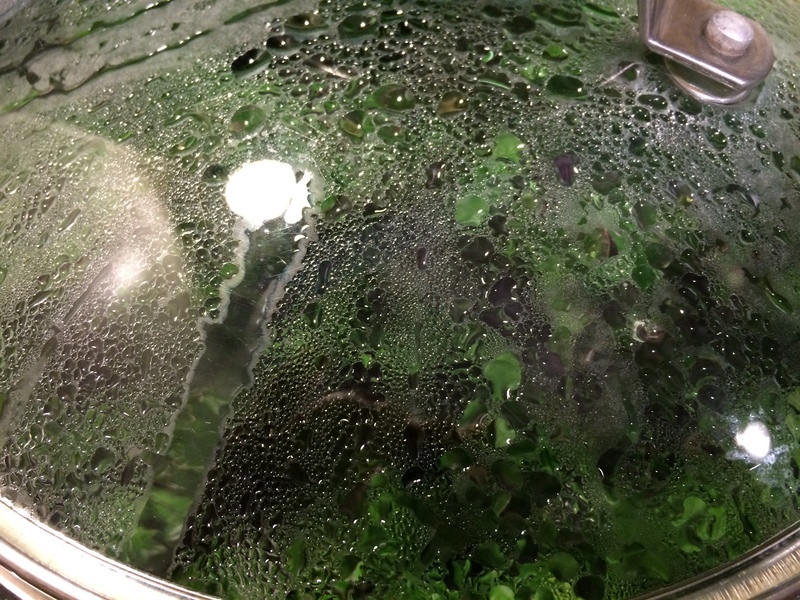 You can, of course, use a small strainer to sift as well. 3. 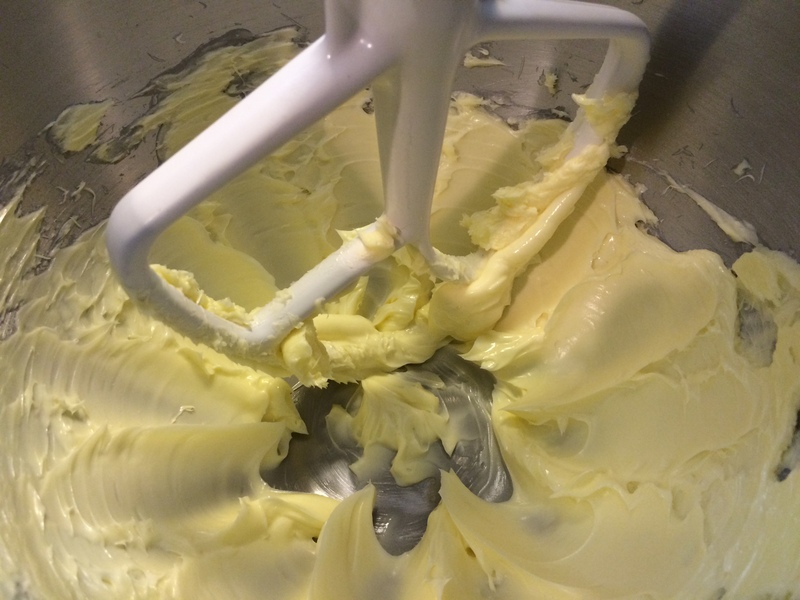 With either a hand mixer and medium bowl, or a stand mixer, beat the shortening on medium speed until it is softened. The softened shortening. It helps the process if you have the shortening at room temperature. 4. Lower the speed to low (otherwise you’ll end up with a mess) and gradually add the sugar. Once the sugar is incorporated with the shortening, turn the speed back up to medium and continue beating until the mixture is light and fluffy. A fluffy shortening and sugar mix. 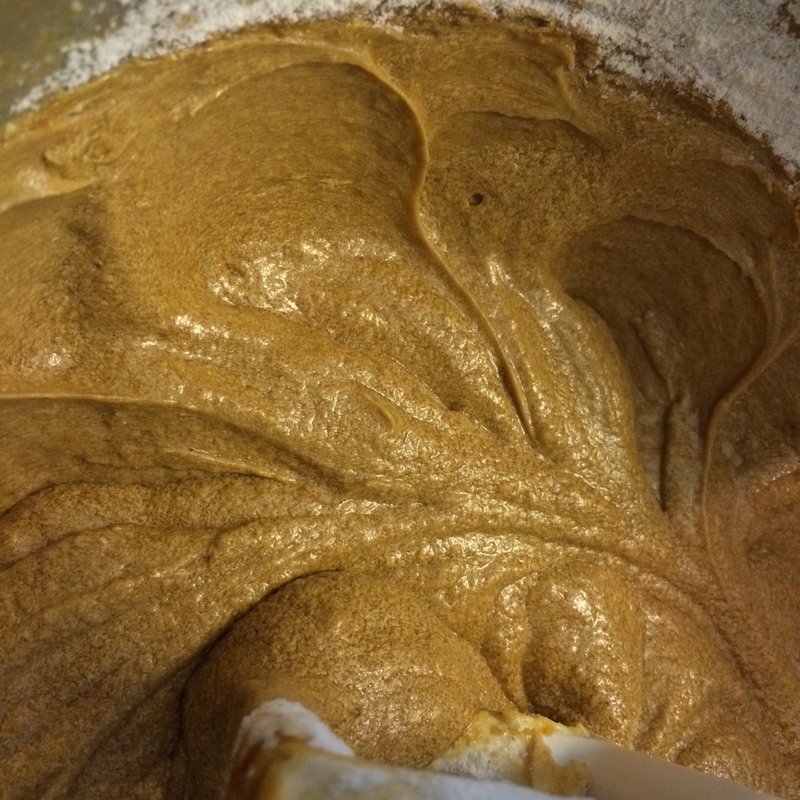 This process helps to incorporate air into the shortening and make sure the sugar will mix into the rest of the batter thoroughly and not lump up. 5. Turn the heat back down to low and add the egg and molasses. Scrape down the sides of the bowl and be sure the ingredients are mixed thoroughly. 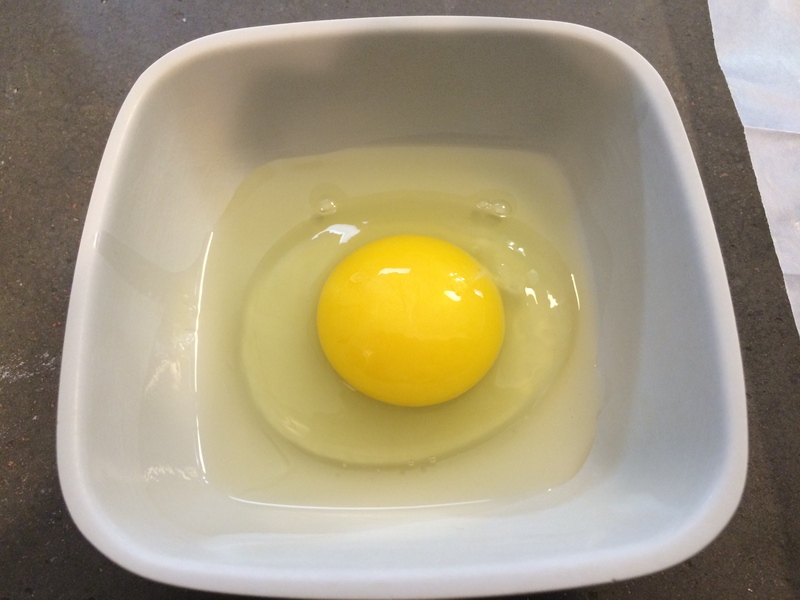 I’ve said it before, but it bears repeating: always break your eggs into a separate bowl or cup before adding to the rest of your ingredients. Otherwise, you may be full of regret. Egg and molasses mixed in. 6. Keeping the speed on low, alternately add the dry ingredients and the boiling water. (I generally begin with 1/4 c. of the boiling water, half of the dry ingredients, the other 1/4 c. water, the other half of the dry ingredients.) By adding the ingredient this way, along with scraping down the sides of the bowl, you are ensuring even mixing as well as jump-starting the baking soda. After adding the first 1/4 cup water. I know it looks strange, but, trust me, it’s fine. After adding the first half of the dry ingredients. 7. Pour the batter into your prepared baking dish and place in the center of the oven. Bake for 35 – 40 minutes, or until a tester comes out clean when you insert it into the cake. So, as soon as I took this photo, Husband took the piece off the top. I am now going to introduce you to two more dishes from the Middle East – one from my childhood and one I discovered more recently. Lentil Soup and Artichokes with Coriander. 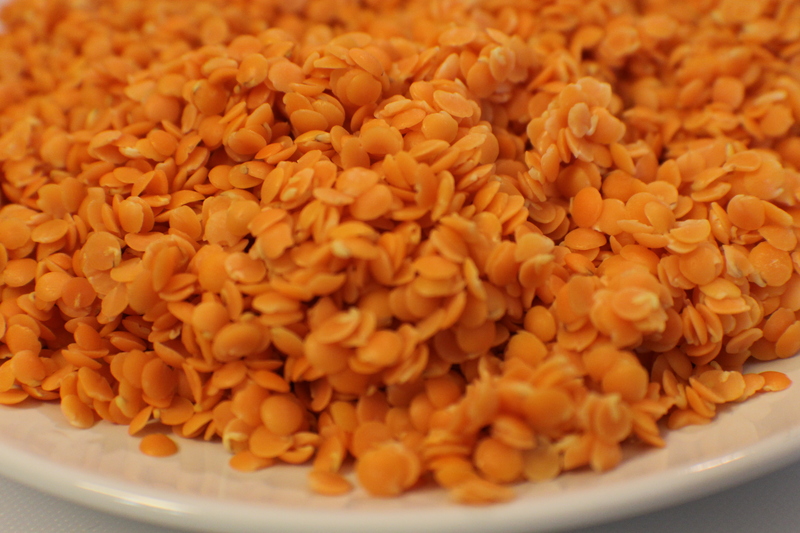 Lentil Soup (Shorbat Adas) is a very popular dish during Ramadan. Soup is a traditional way to break the fast and the heartiness of this soup is perfect for that. Some people will put cooked ground beef or lamb in the soup, others balls of Kefta (basically, ground meat with onion, parsley, and spices). 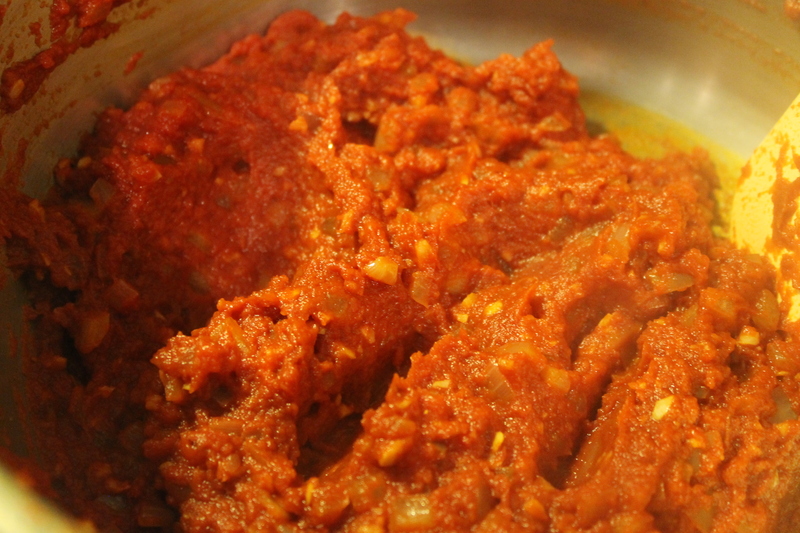 Some will also use dried bread and puree it into the soup to thicken it. Sliced radishes are also a popular addition. 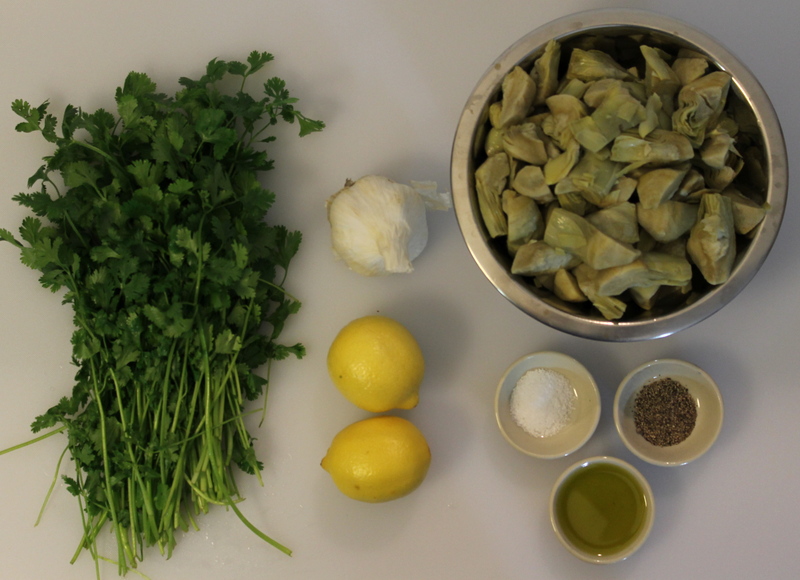 The Artichokes with Coriander (Ard al-shokeh ma’kuzbara) is a more recent discovery for me. 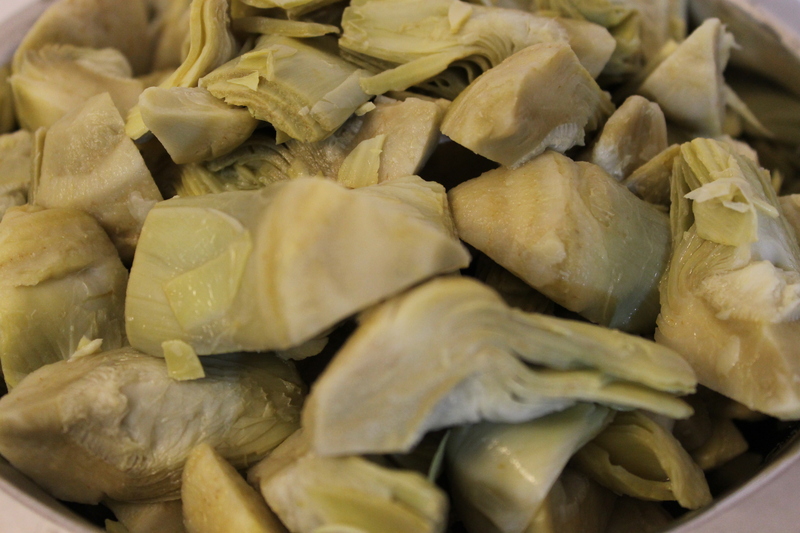 It’s a dish popular in Jericho in the early summer when artichokes are in season. Here, I’ve used frozen artichokes. This way, I can eat this dish at any time of year. Mainly, though, because I really don’t like to clean artichokes. 1. The soup is really best with the red lentils. They have a lighter, slightly sweeter flavor that’s best for the soup. They’re much more readily available than they used to be. 2. Be sure to wash the lentils. They’re generally dusty when they’re packed. 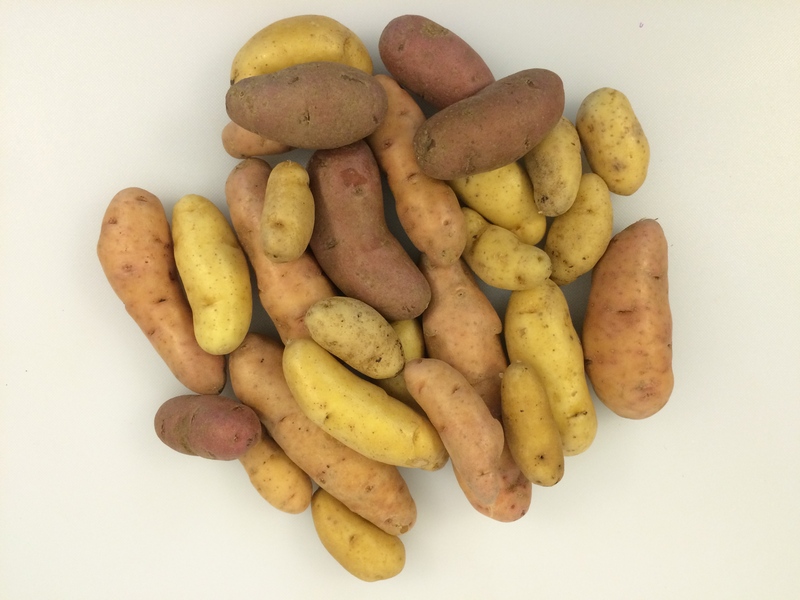 While processing methods have become better, sometimes, especially if they’re from a bulk bin, they may also have small rocks or dirt. So, be sure to check them carefully. 3. 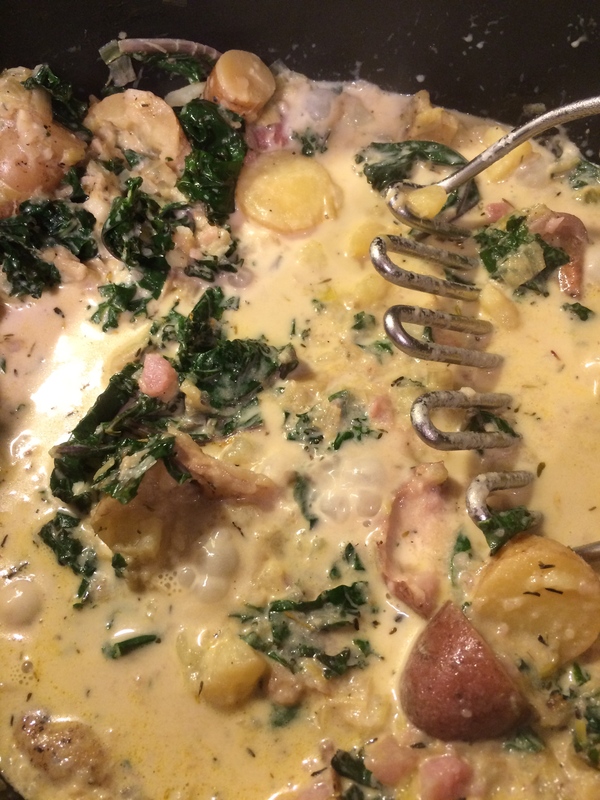 As with most soups, this is even better the next day and freezes well. 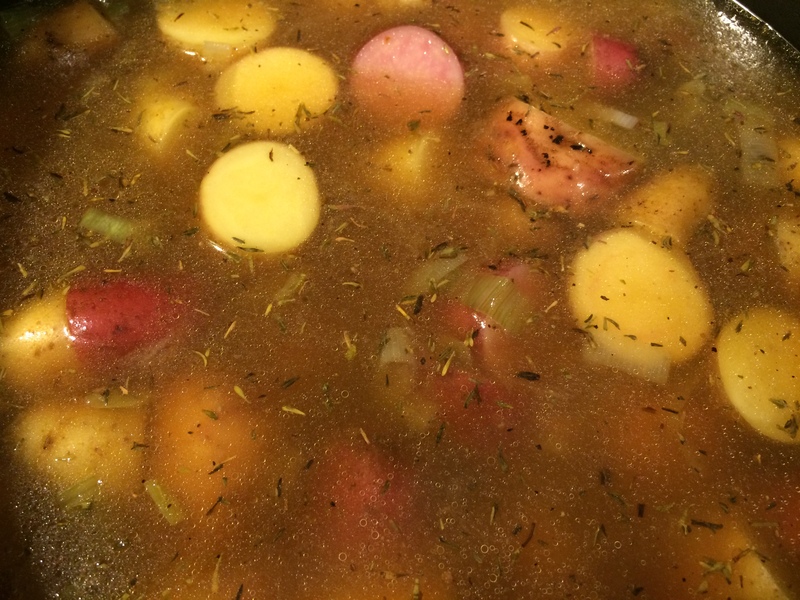 When you reheat the soup, be sure to add a little broth or water because it thickens up as it sits. 4. 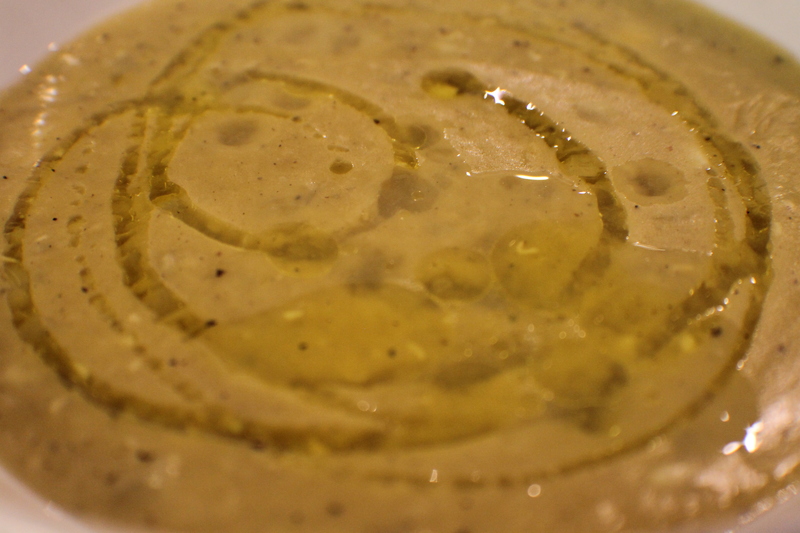 If you want a smoother soup, then you can puree it. However, I prefer a little texture in the soup. 5. You can easily make the soup vegan by using either vegetable broth or water. 6. 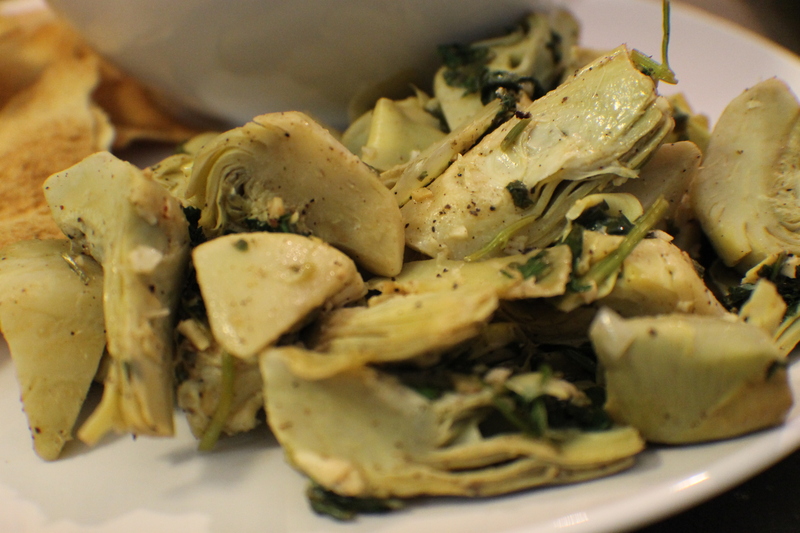 Don’t use marinated artichokes packed in olive oil. Be sure, especially with canned or jarred ones, that they are packed in water. Or, if you’re using frozen, they’re unseasoned. 7. 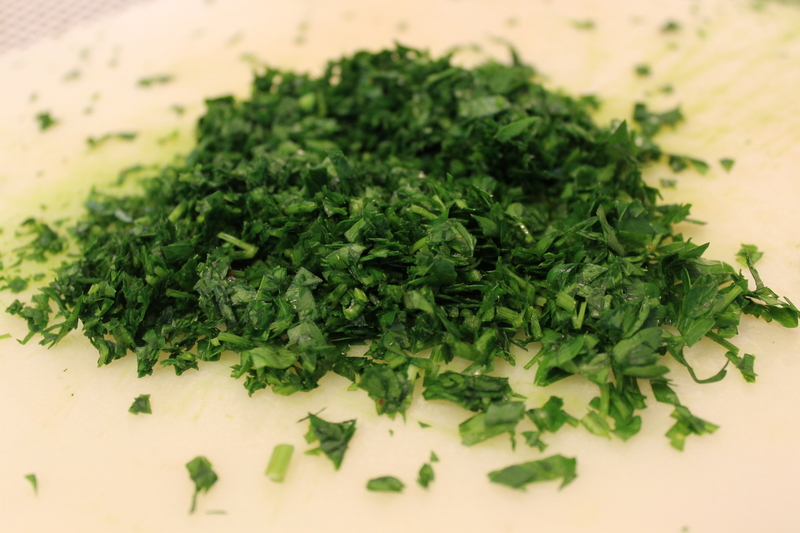 If you don’t like cilantro (coriander), you can use parsley. It obviously won’t taste the same, but it will work. The lentils. 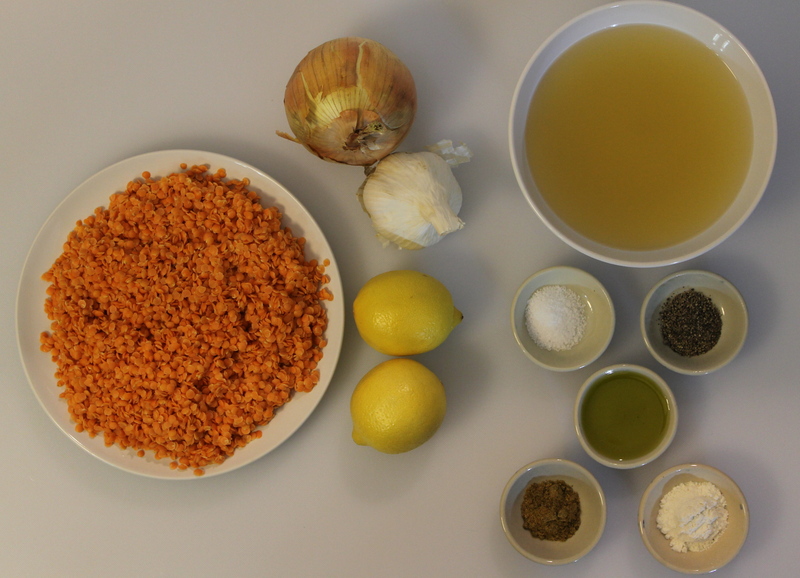 Red lentils work best in this soup. They’re much more readily available than in the past. 1. 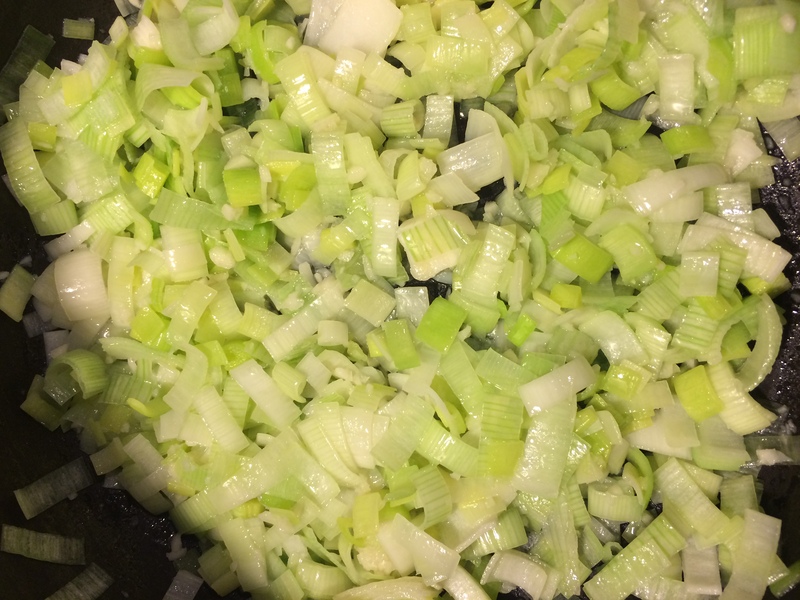 In a large saucepan, place the onion, garlic, lentils, and broth or water. Lentils, onion, and garlic in the saucepan awaiting the broth. Cover and bring to a boil. Keep the saucepan covered, turn the heat down to medium-low, and simmer for 45 minutes. Stir occasionally. 2. 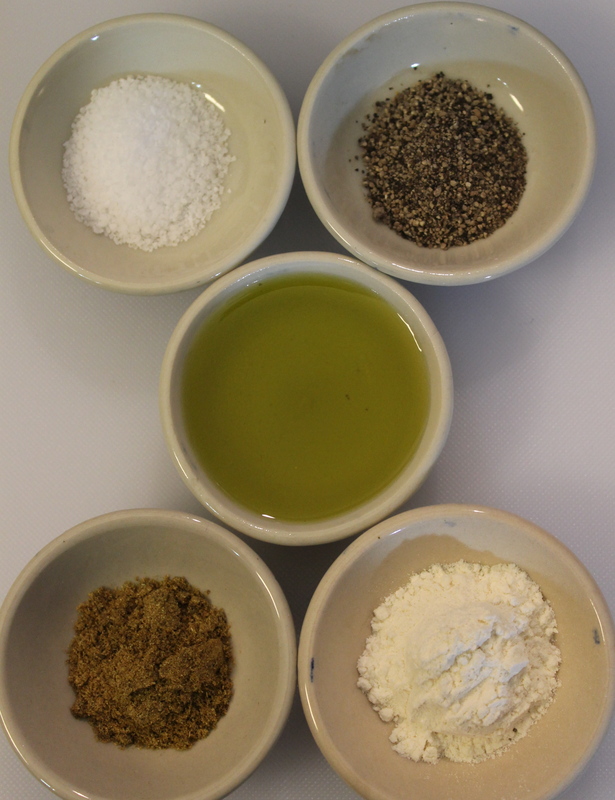 Meanwhile, in a small bowl, mix together the flour, salt, pepper, cumin, and olive oil. 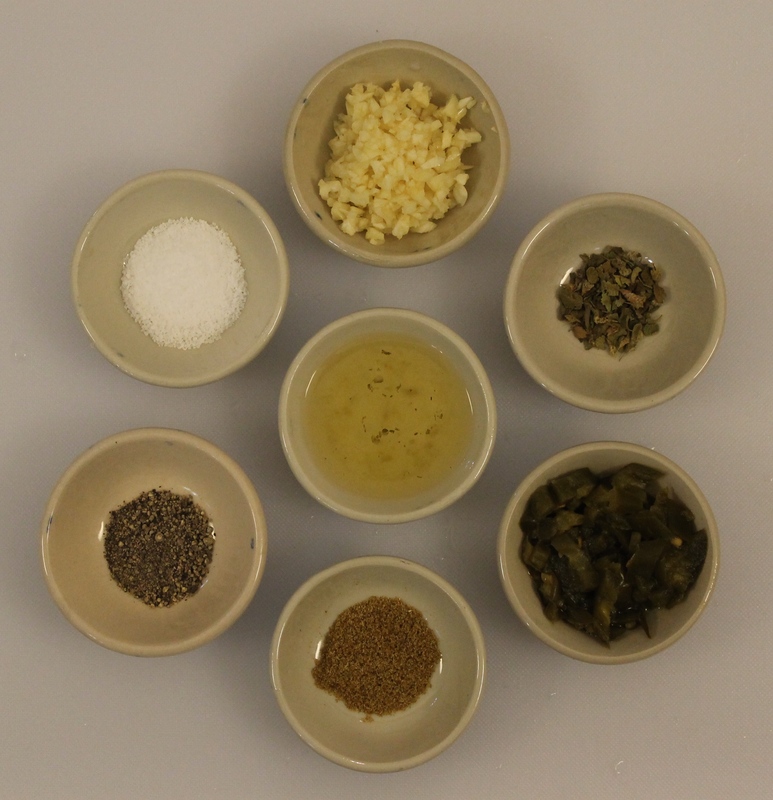 The oil, flour, and spices mixed together. It smells lovely. 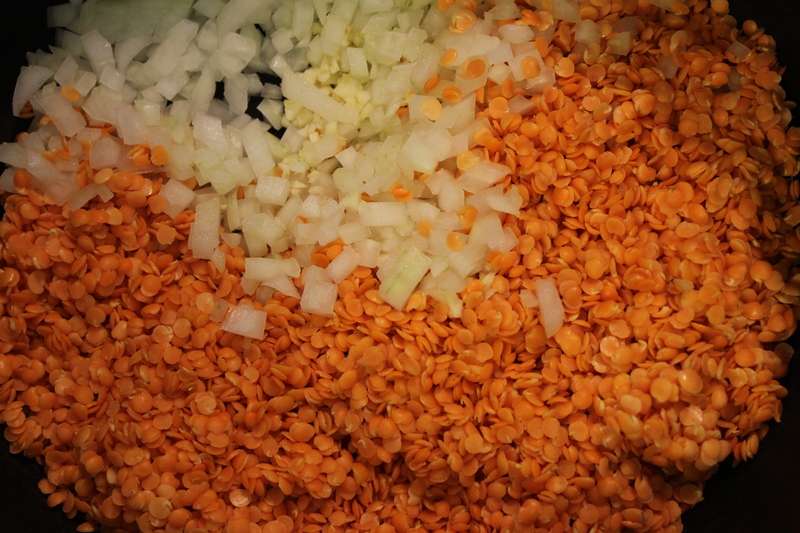 Add the mixture to the lentils after the first 45 minutes of cooking. The soup after the first 45 minutes of cooking time. Sorry, the lentils don’t stay red. They turn to a dull gold-yellow. 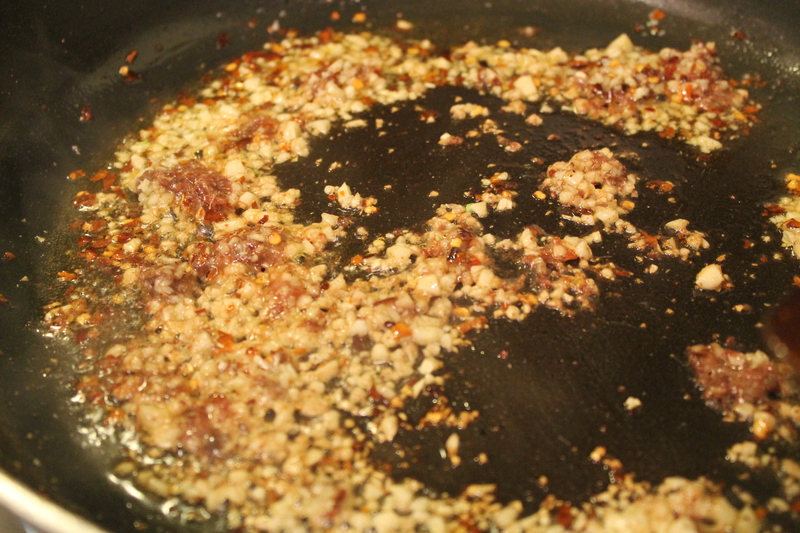 After adding the oil-spice mixture. After you add the oil & spices, cook for another 15 minutes, uncovered. Stir occasionally. 3. Add the lemon juice and cook another 5 minutes. My old-style lemon reamer. One of my favorite things I received from my mother-in-law. Taste for seasoning. Serve with a drizzle of olive oil over the top and some extra lemon on the side. The artichokes. I used frozen ones in this recipe. If you do get jarred or canned, be sure they aren’t marinated & flavored ones. 1. 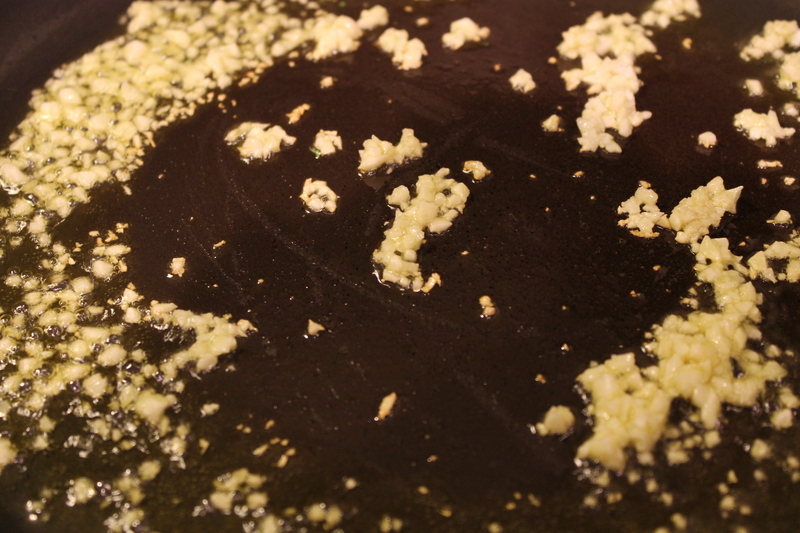 In a large skillet, heat the olive oil over medium heat. 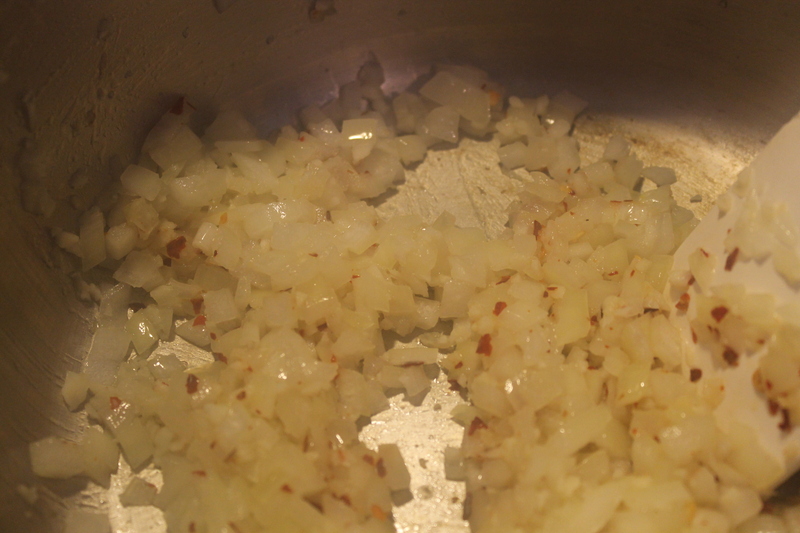 Add the garlic and cook for 1 – 2 minutes. 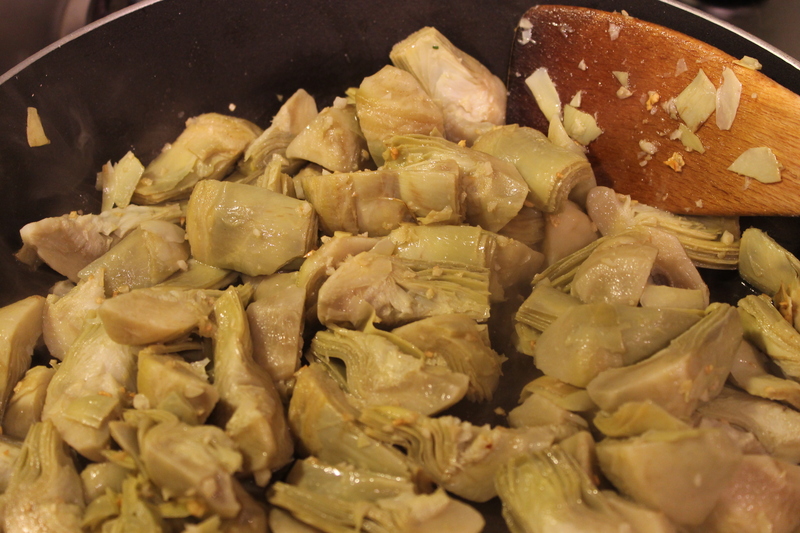 Add the artichokes hearts and cook another 5 minutes. 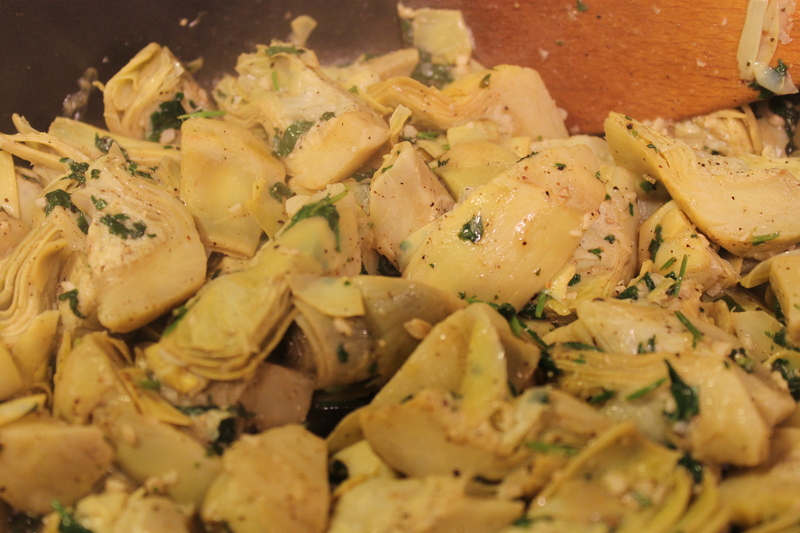 Adding the artichokes. Be sure to continue stirring frequently to keep the garlic from burning. Add the coriander (cilantro), salt, and pepper. Cook another 5 minutes. Stir frequently. 2. Add the lemon juice and cook another 2 minutes. Remove the skillet from the heat and taste for seasoning. 3. You can serve this either warm or room temperature. This dish can also be made a day in advance. Warm it slightly or let it come to room temperature before serving. 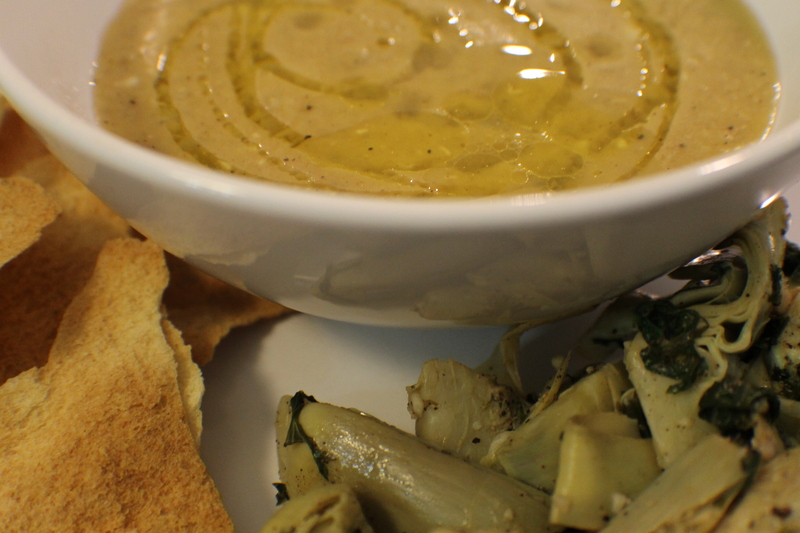 In this post, I served the soup with toasted split pita bread to make a sort of cracker. You can also serve with warm pita or a cracker of your choice. The plainer the better. Panzanella is one of those dishes that simply screams summer. It is at its best when tomatoes are in season, and, especially, fresh from your own garden. 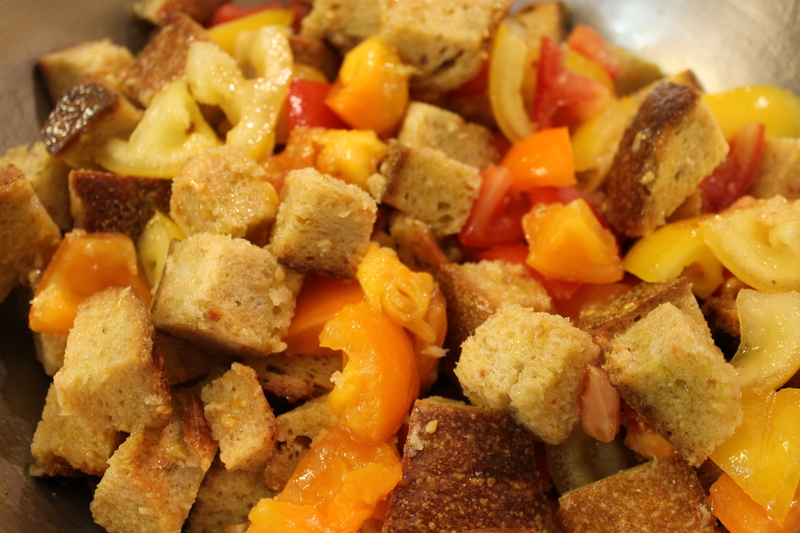 Panzanella (literally meaning “bread in a small basket) is a Tuscan recipe that, before the 20th Century, was based on onions, bread, olive oil, and basil. It wasn’t until the 20th Century that tomatoes were added; no doubt out of desperation and poverty. The earliest known description of Panzanella is by the painter Angolo di Cosimo (“Bronzino”; 1503 – 1572). He sings the praises of onions with oil and vinegar served with toast and, a page later, speaks of a salad of onions, purslane, and cucumbers. The best things about this recipe? It’s easy, fast, and there’s no cooking involved. More reasons it’s perfect for summer. 1. This should go without saying, but use the best ingredients you can find and/or afford. 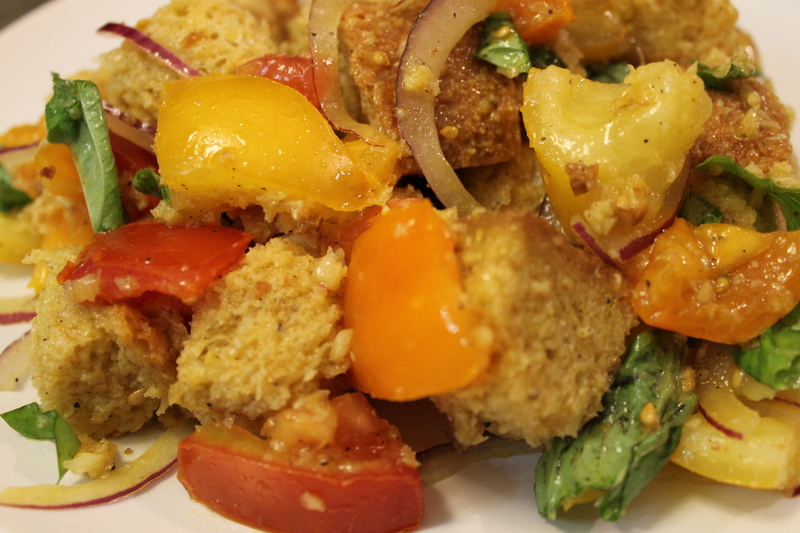 Panzanella traditionally has few ingredients, so they all need to shine. There’s no way to mask indifferent ingredients in this recipe. 2. Use at least day-old bread. If your bread is too fresh, it will become gummy. 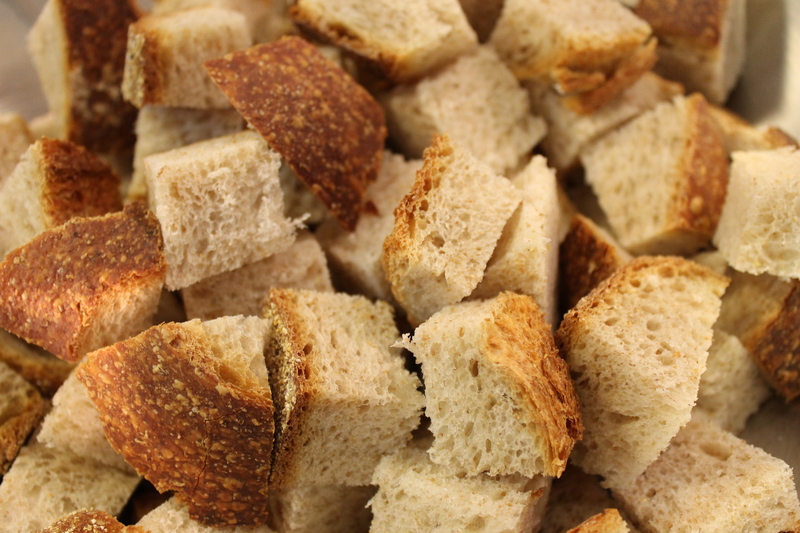 Also, use a good European-style crusty bread. Most American-style breads don’t have the hard crust needed. 5. This salad is really best the day it’s made. You can eat it the next day (just let it come to room temperature after you take it out of the fridge), but the bread will be soggy. Unless that’s what you prefer. The cubed bread. I used an Italian rustic whole-wheat bread. 1. 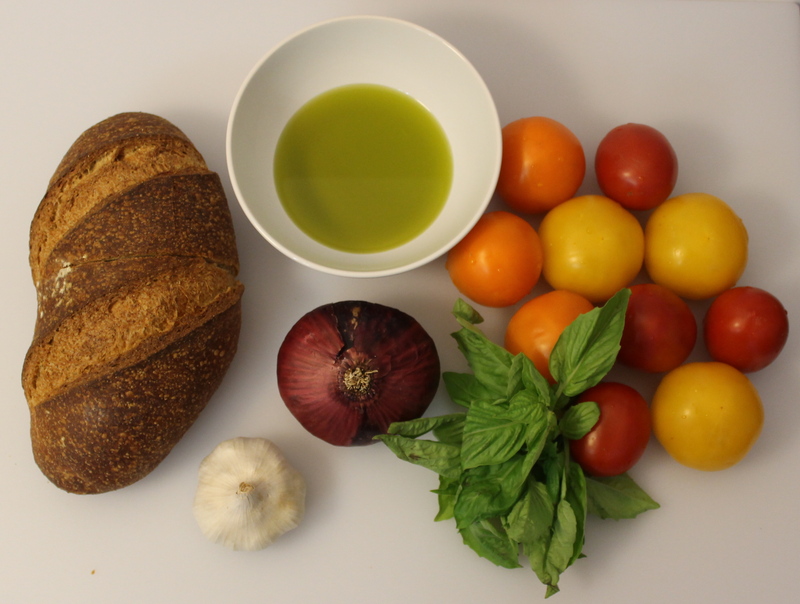 Mix together the bread, tomatoes, and olive oil. Mix thoroughly and let sit for at least 20 minutes or up to 1 hour at room temperature. 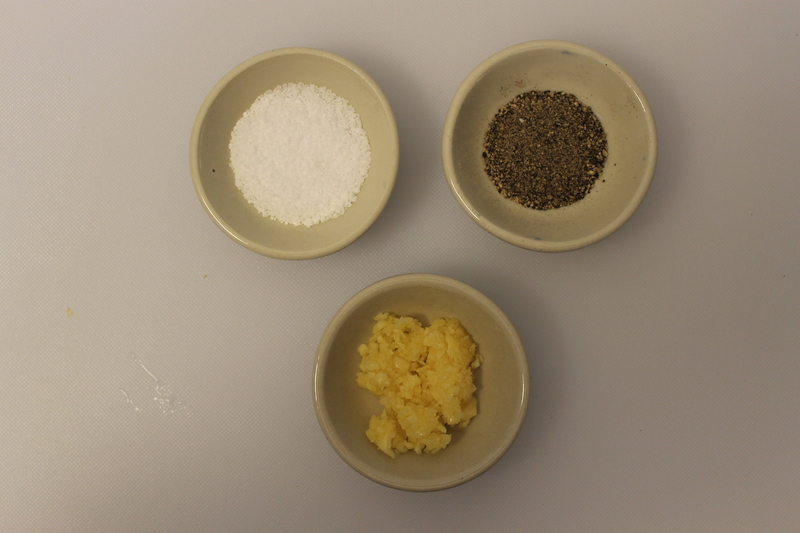 The first three ingredients mixed together. Now, the waiting begins. 2. Add the remaining ingredients and combine thoroughly. Taste for seasoning and saturation of the bread. Adjust as needed. Serve immediately. Typically, this is served alone. However, it will go well with just about any protein – especially grilled meat. Ranch, Blue Cheese, Thousand Island. 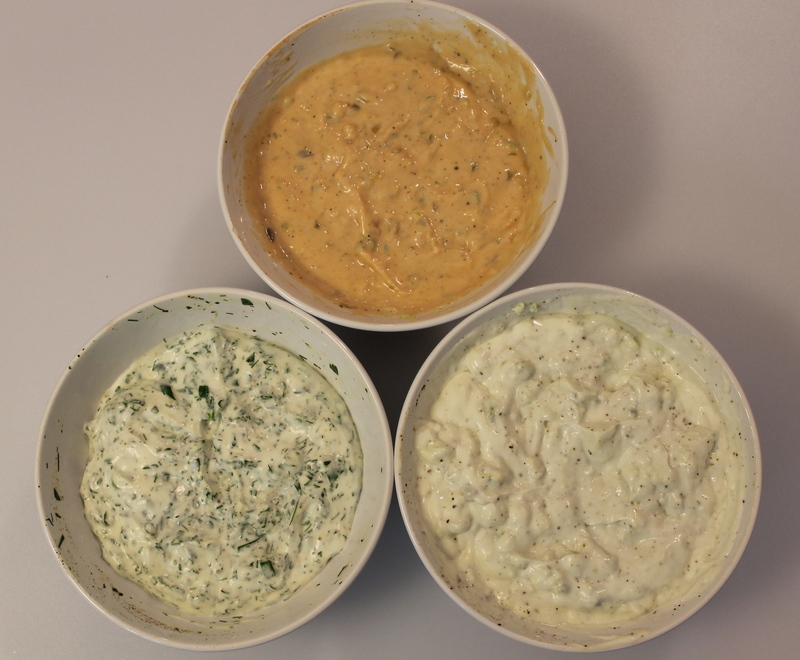 Three dressings that have been ubiquitous on the American Dinner Table for decades. Of course, being American, these dressings have been adapted to serve other purposes than just coating lettuce. They are used for dipping vegetables, marinating, as a sandwich ingredient, and for mitigating the heat of Buffalo Wings. Each one of these has an origin story that shows off, even in some small way, American ingenuity, taste, and not a little desperation. Ranch Dressing was created on the true-life Hidden Valley Ranch (a dude ranch) near Santa Barbara, CA. The originator, Steve Henson, was said to have come up with the original recipe while working as an electrical contractor in Alaska. When he and his wife opened their dude ranch in the early 1950’s, they served the dressing to guests and it became a hit. They began selling kits to guests to take home and make their own dressing (just add buttermilk). The Hensons managed to build a small empire on their dressing, eventually selling their company to Clorox in the early 1970’s (the company still owns the brand). 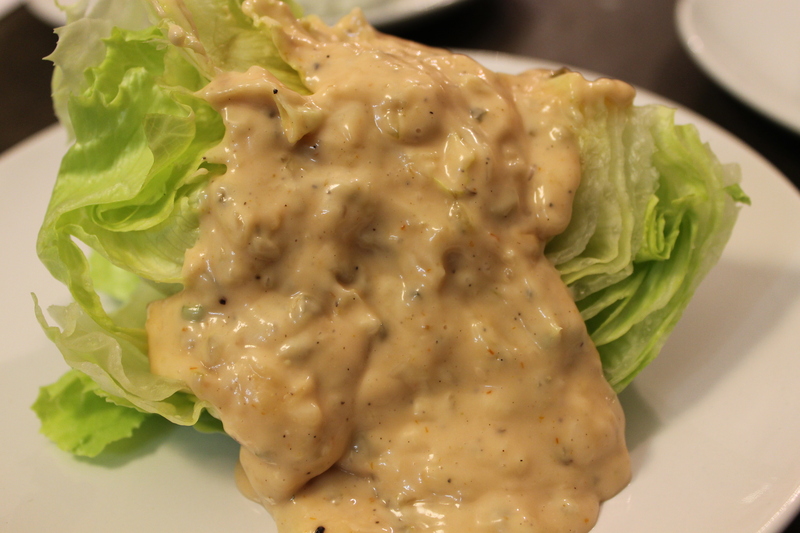 Thousand Island Dressing has a slightly more murky history. One story is that Oscar (Oscar of the Waldorf) Tschirky introduced the dressing to patrons of the Waldorf Hotel in New York via his boss, George Boldt, who was served the dressing while on a boat tour in the Thousand Islands in upstate New York. It was said the chef on board basically threw together a salad dressing with whatever he had on hand, and it became a hit. Another story, probably the more likely one, is that Sophia LaLonde, the wife of the fishing guide at the Herald House on the Thousand Islands, came up with the recipe in or around 1911 to serve at the hotel and shore dinners there. The Broadway actress May Irwin enjoyed the dressing so much she asked for the recipe. Mrs. LaLonde obliged, and Ms. Irwin took it back to New York and gave the recipe to Mr. Boldt so the kitchen could prepare it for her. Once the Waldorf began offering the dressing to its patrons, the dressing became popular throughout the country. The Holiday House Hotel in the Thousand Islands still sells the original recipe dressing at the hotel and online. 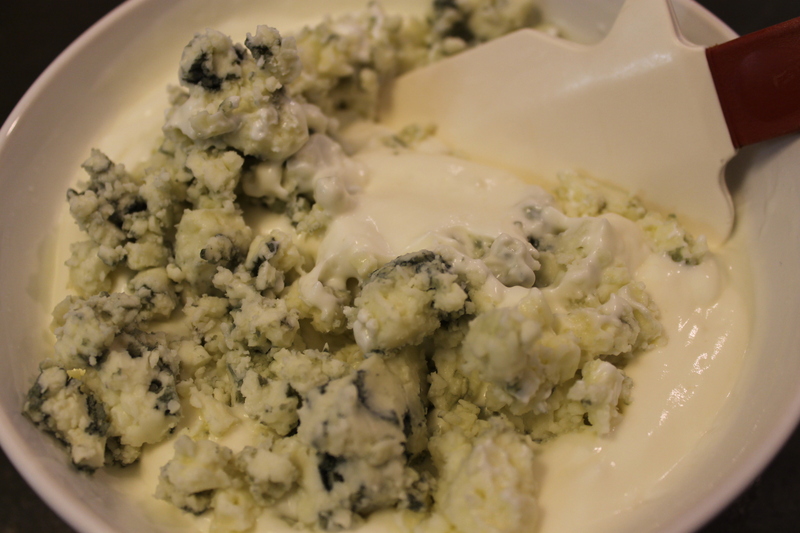 Blue Cheese Dressing has a very murky origin story. It has been suggested that it originated in France, but that’s highly unlikely. The French prefer lighter vinaigrette-style dressing on their salad; it’s doubtful that putting cheese in their salads would even occur to the French. Blue cheese has been in America since at least the Revolution where that well-noted Francophile, Thomas Jefferson, enjoyed it at his dinner table. The first recorded evidence of Blue Cheese Dressing as we’ve come to know it (Then known as Roquefort Dressing) was in Edgewater Hotel Salad Book in 1928. 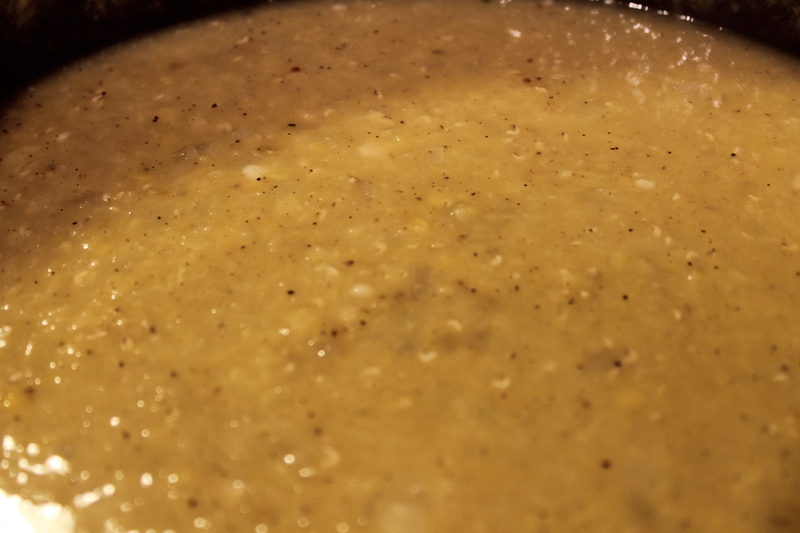 An earlier version of the dressing appears in the Fannie Farmer’s 1918 Cookbook. By the 1930’s the dressing had spread in popularity not only through Fannie Farmer, but also through Irma Rombauer’s ubiquitous book, The Joy of Cooking. 1. All three of these recipes can easily be made vegan. 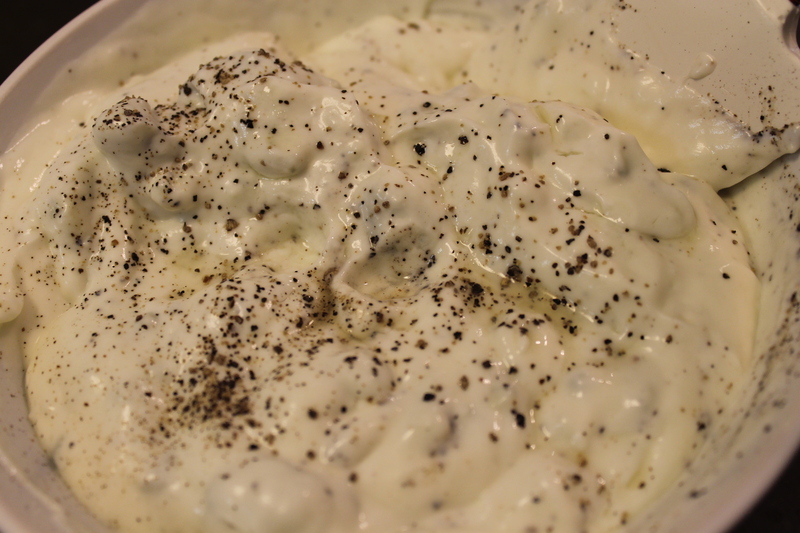 For the Ranch: Omit the sour cream; substitute vegan mayonnaise and plain soy milk. amount and add to taste). 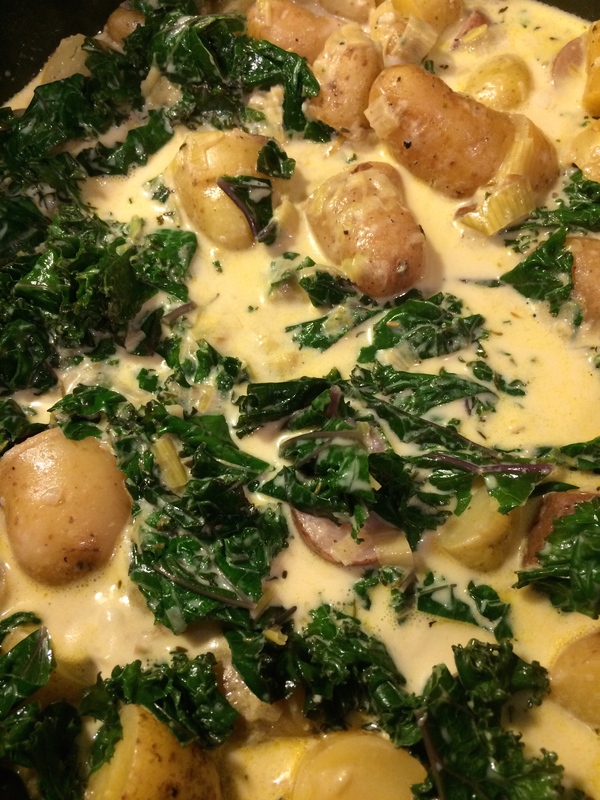 If you have some nutritional yeast, you can also use that for additional cheesy flavor. 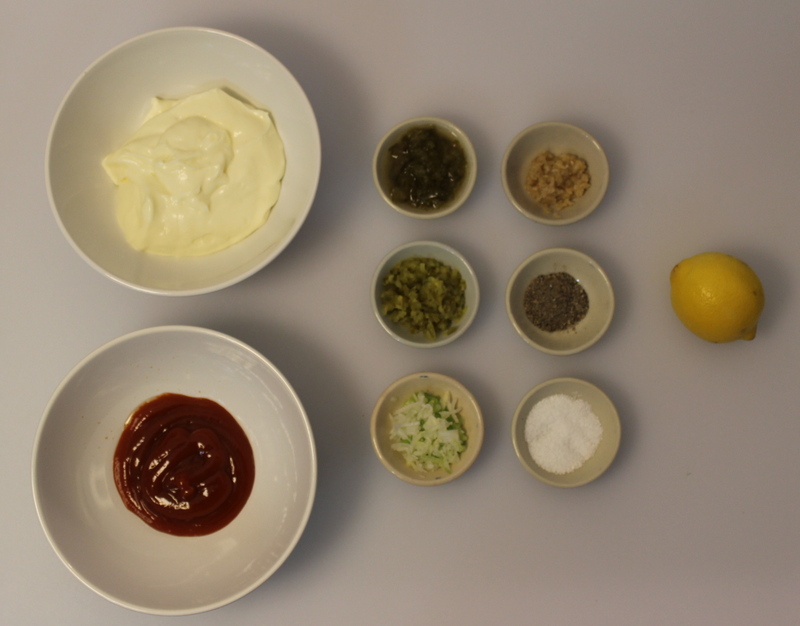 For the Thousand Island: Substitute the mayonnaise for vegan mayonnaise. 2. If you can find it (and it’s getting easier to), use “country style” buttermilk. The flavor and thickness make so much difference in the finished dressing. 3. 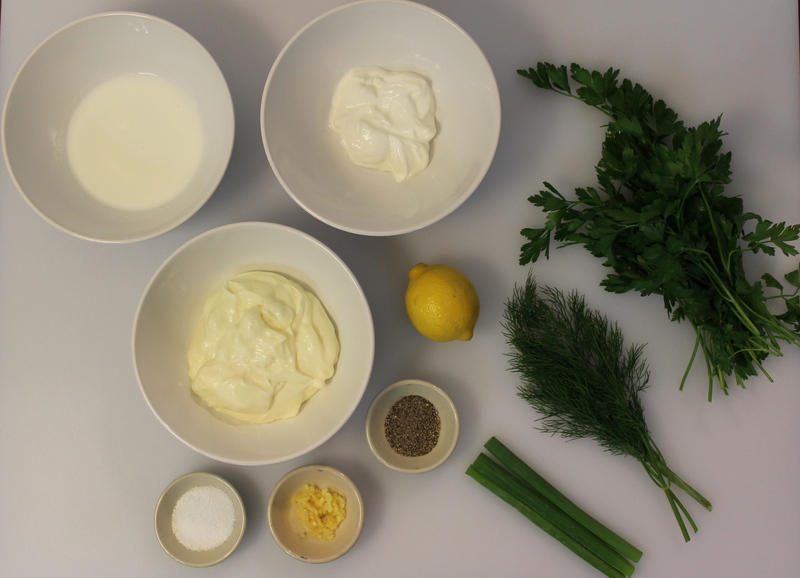 If you must use dried herbs in the Ranch Dressing, use 1/2 the amount of the fresh in the recipe. 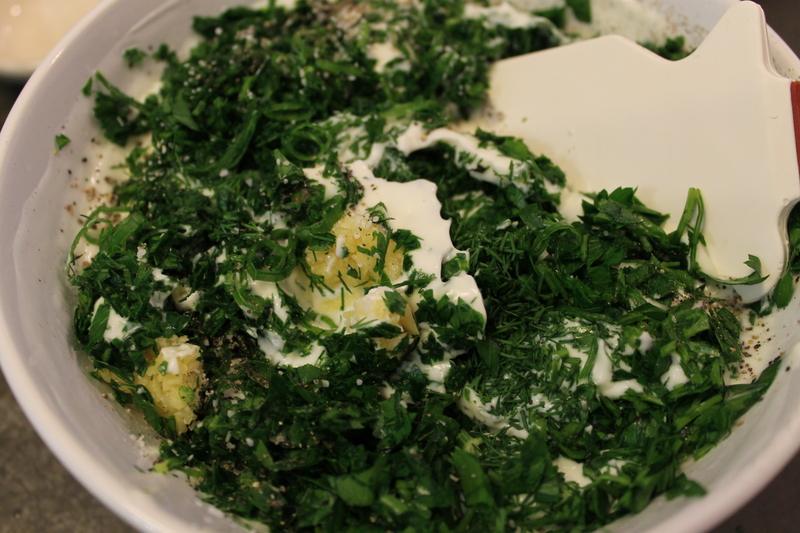 The dressing will need to sit for an hour for the herbs to infuse their flavor. 4. 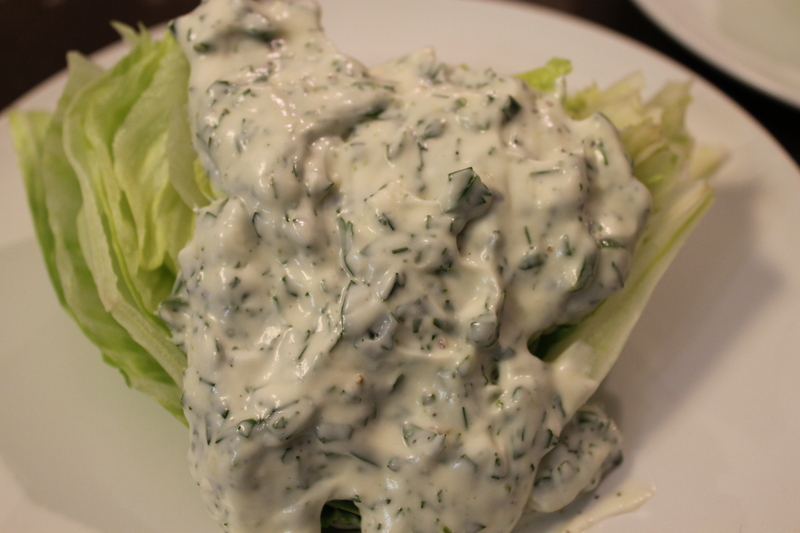 For the Blue Cheese Dressing, I used Amish Blue. I have used gorgonzola, roquefort, and Stilton in the past. Extravagant, but delicious. 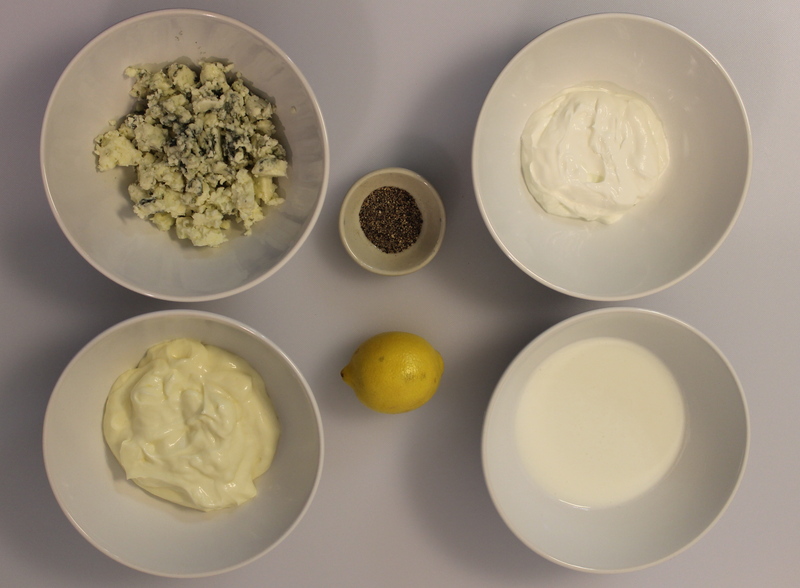 You can use any type of blue cheese you like – as your cheese department and budget will allow. 5. 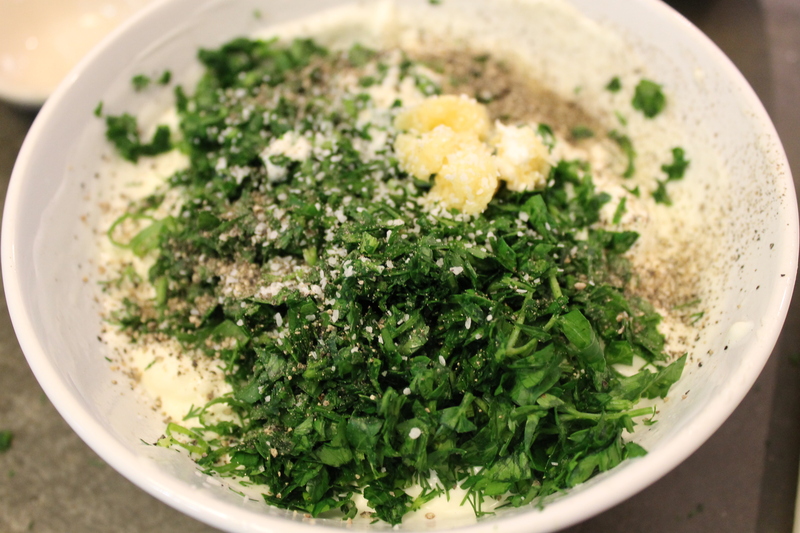 For the Thousand Island, I usually add more than 1 teaspoon of horseradish depending on what I’ll use it for (i.e. Reubens). So, adjust according to your taste. 6. You can substitute low-fat yogurt for some or all of the sour cream. If you must. 7. All of these dressings will last up to a week. If they begin to separate, just give them a stir. The Blue Cheese Dressing, will, however, thin out considerably as it sits. Just add more mayonnaise and sour cream to thicken. Now, I will say, these are my versions of these dressings (and, no doubt, many others have made these same adjustments). You can certainly add, subtract, and/or change ingredients. 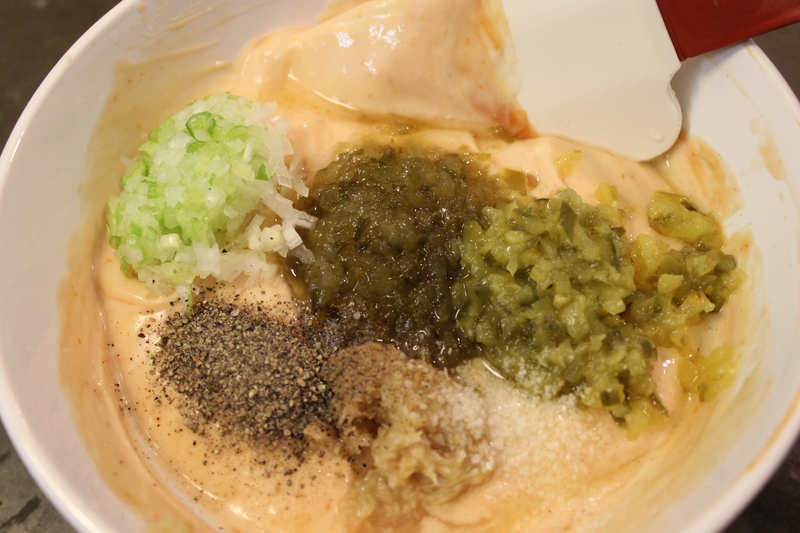 For example, the original Thousand Island Dressing uses finely chopped egg in the recipe; I don’t. 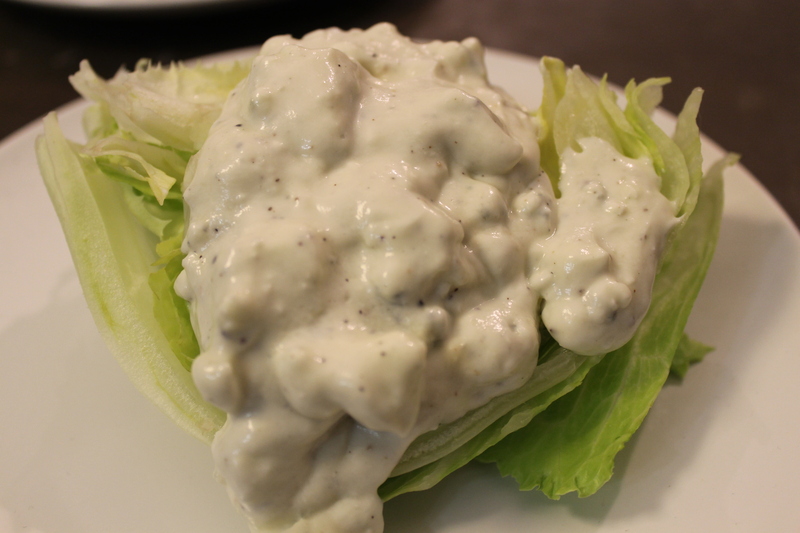 The original Ranch Dressing is made with buttermilk only; I’ve added mayonnaise. I’ve added lemon juice to the Blue Cheese Dressing. I, like many, have also added bacon from time to time (it’s excellent on burgers when you feel like indulging). Sometimes, I like to go all ’70’s and use an Iceberg wedge when I serve any of these dressings. A dear, late friend of mine, Chef Roger Mollett, used to say, “Iceberg is the polyester of lettuce”. He’s right, you know. 1. Add the ingredients into a bowl and mix thoroughly. 2. Let sit for at least an hour, taste and adjust for seasoning. 3. Serve with salad or other food of your choice. 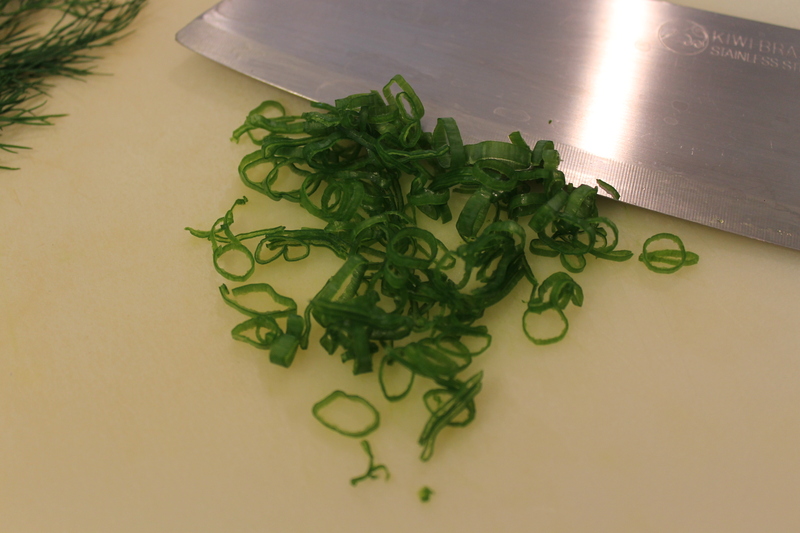 If you don’t have chives, thinly sliced scallion tops work as well. 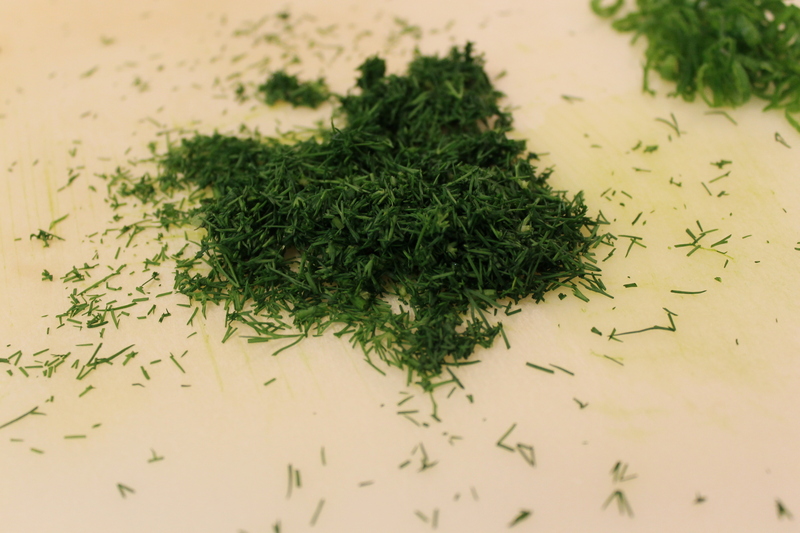 Fresh dill is what really makes this dressing so delicious. 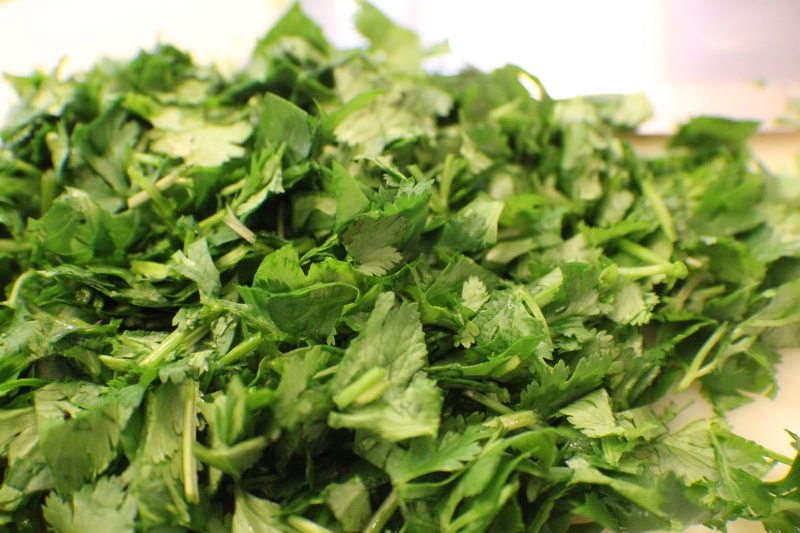 You can use either curly or flat-leaf parsley. Mixing. 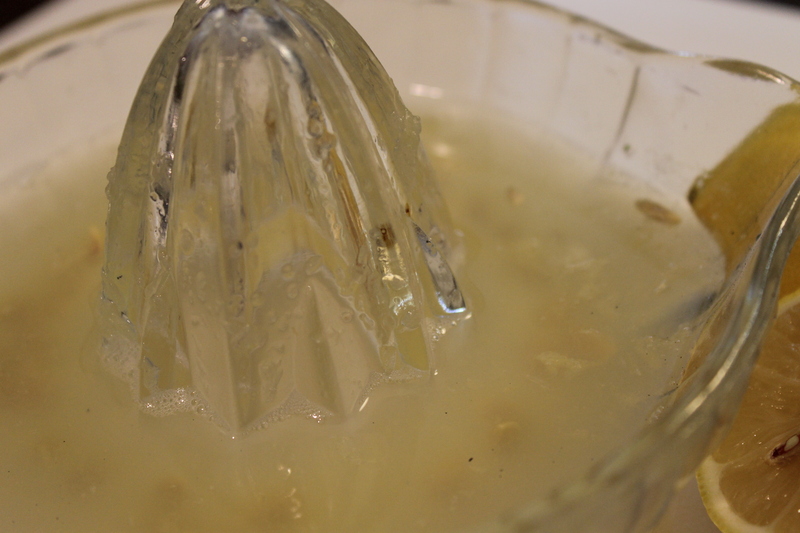 The buttermilk will be stubborn and not want to incorporate at first. But, trust me, it all comes together. Not pretty. But it’s damn indulgent. I used Amish Blue for this example. You can use any blue cheese you like. Mixing in the blue cheese. It’s a lot. 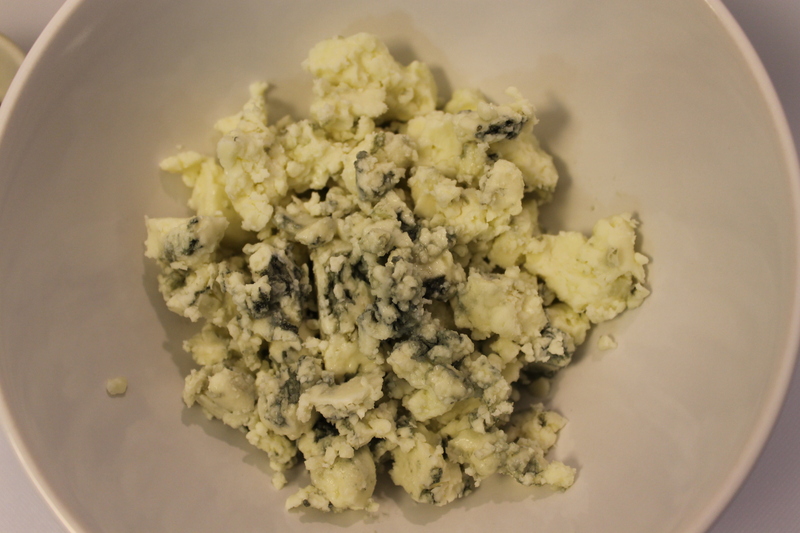 If you have to crumble your blue cheese (as opposed to buying it already crumbled), leave the pieces different sizes. It makes for a more interesting texture. Mixing in the pepper and lemon juice. 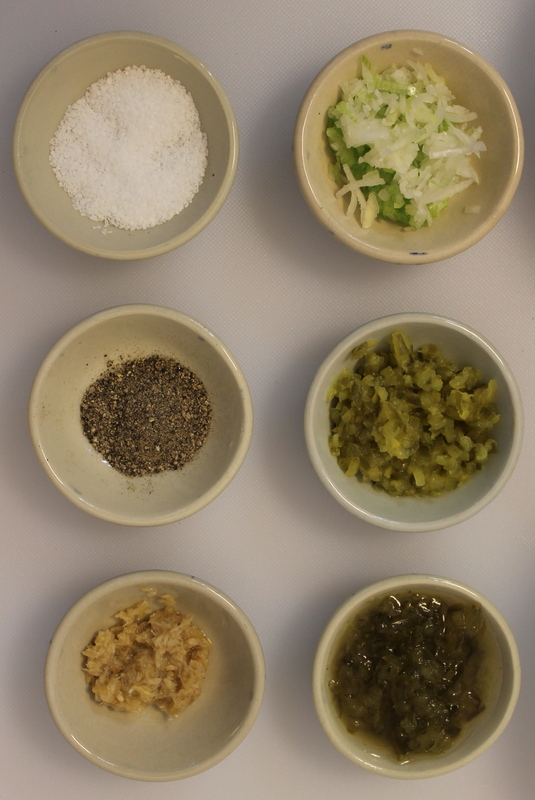 The best way to test a dressing – any dressing – is to use some of the greens you’ll be serving it with to better gauge the flavors and how they taste together. 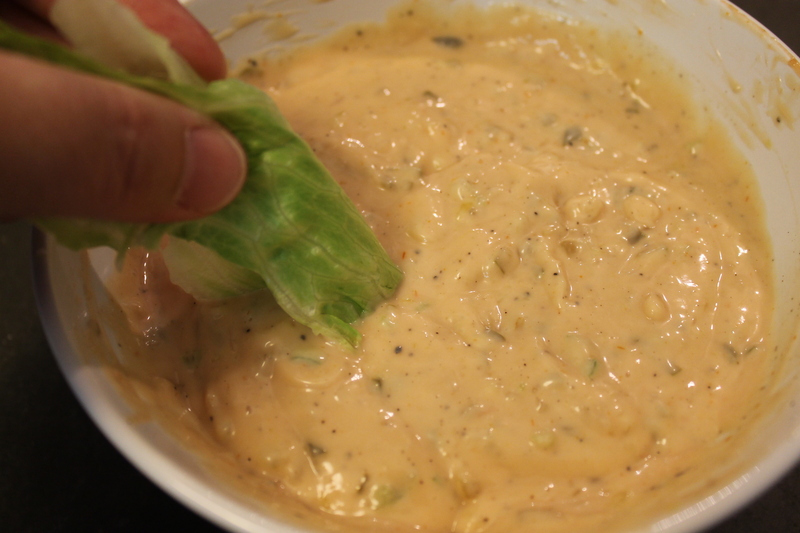 Testing the Thousand Island Dressing. Plus, as well know, when you’re adjusting recipes standing up in the kitchen, the calories don’t count. Plus, hey, it’s lettuce.